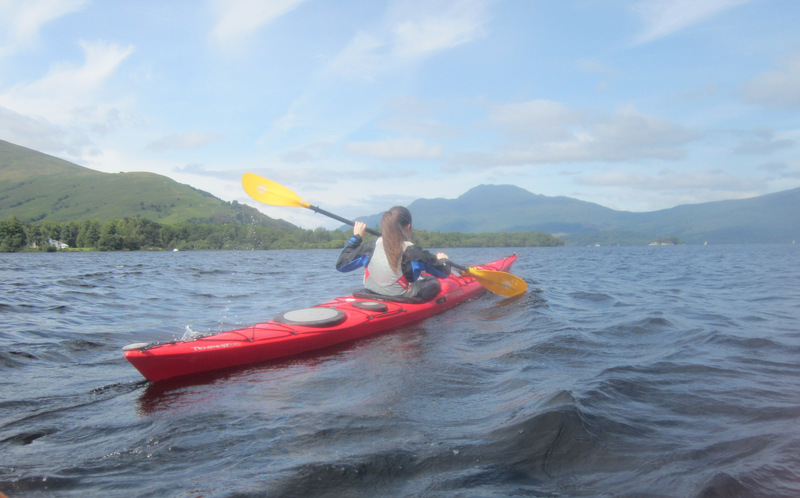 Helensburgh CC – Page 2 – Canoeing and Kayaking with Helensburgh C.C. 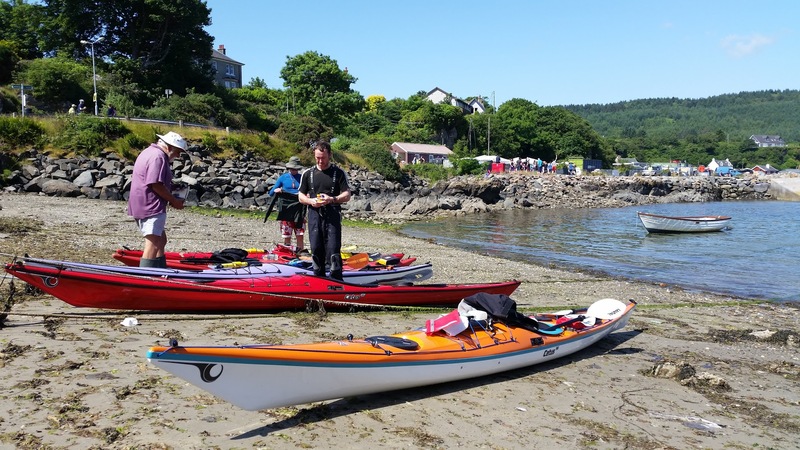 Route: Kilcreggan (Fort Road), Cove SC, Blairmore and v.v. 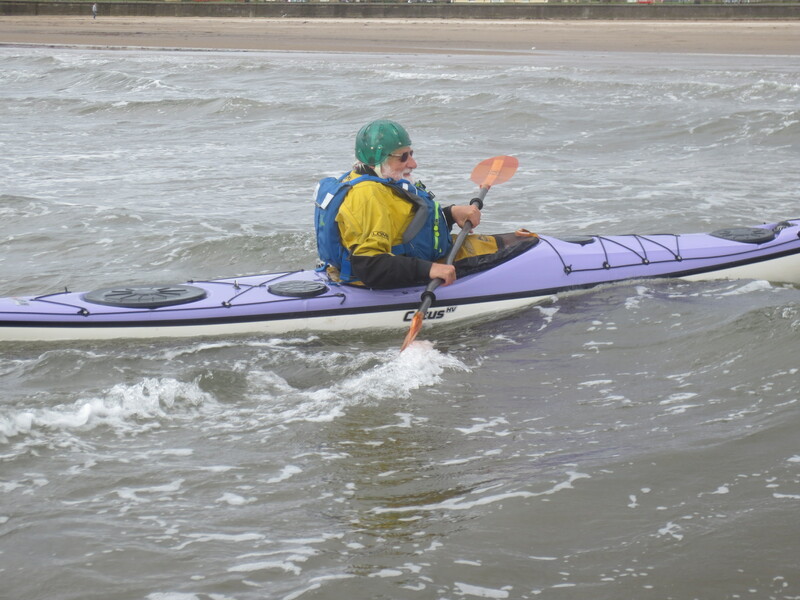 Report: A strongish breeze plus tide made the paddle out a surprising effort but the return somewhat easier, if a little worrying for our novice. Main object of post is to report excellent coffee shop in Blairmore (but closed Mid-December to March) to add to reopened Rosneath establishment. For full screen, “double click” on the photo or map. 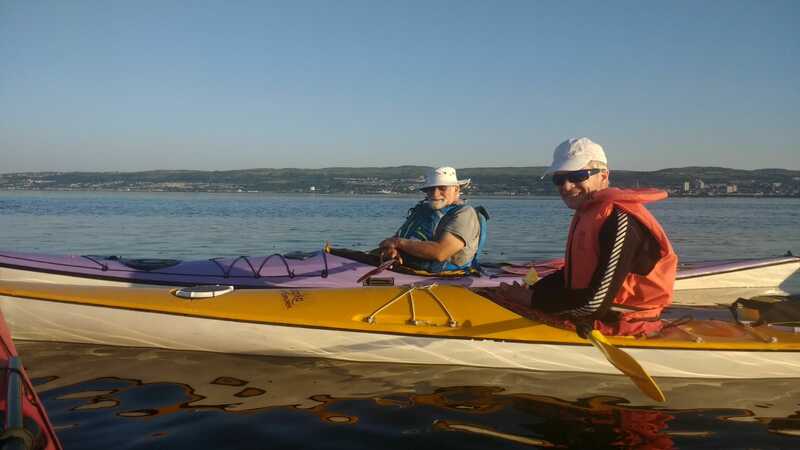 Paddlers: Hugh, Geoff, Steve W.
Getting There: The journey was straightforward and on time. 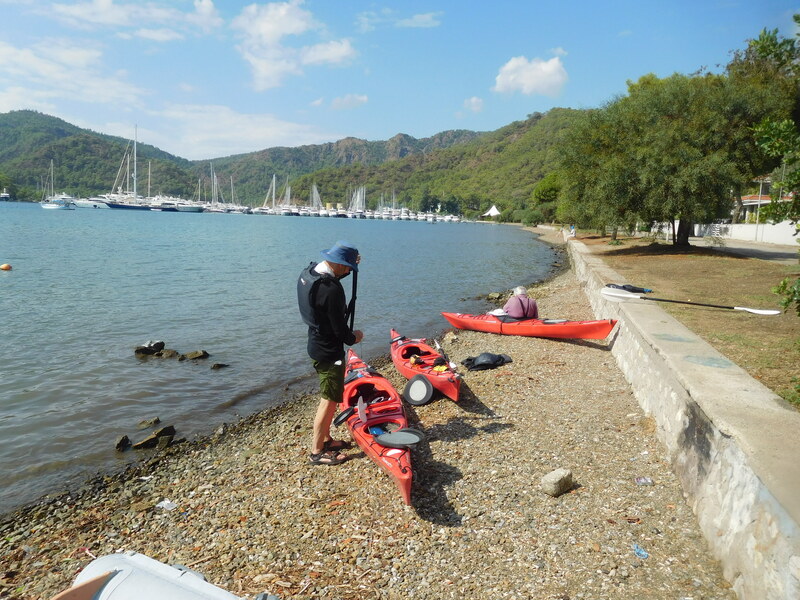 We left Helensburgh at 11.30 for a 14:00 plane to Dalaman arr 20:20 (Turkish time) and Taxi to Lykia Park Airport Hotel for a night’s sleep and pickup the following day. 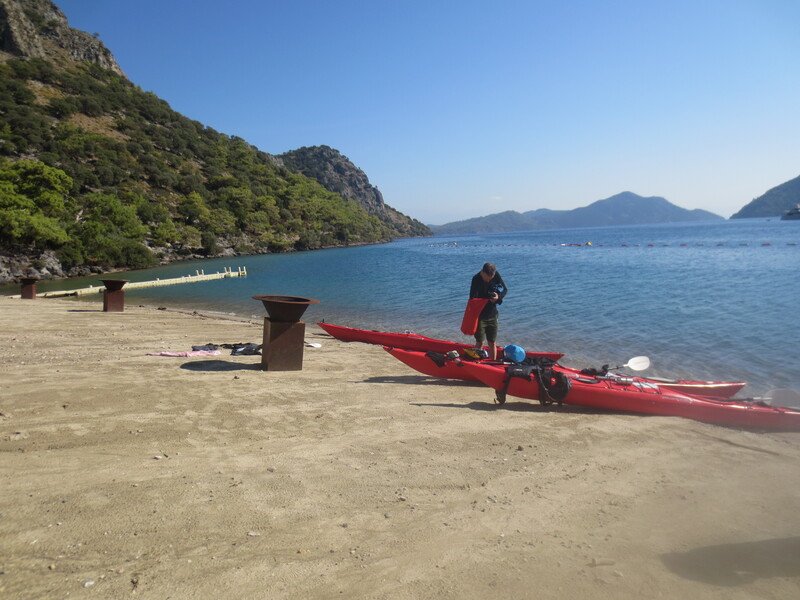 Day 1: After an excellent breakfast,at 9am Dean (the kit supplier) took us down to Gocek, a sailing centre at the west end of the Bay of Fethiye. 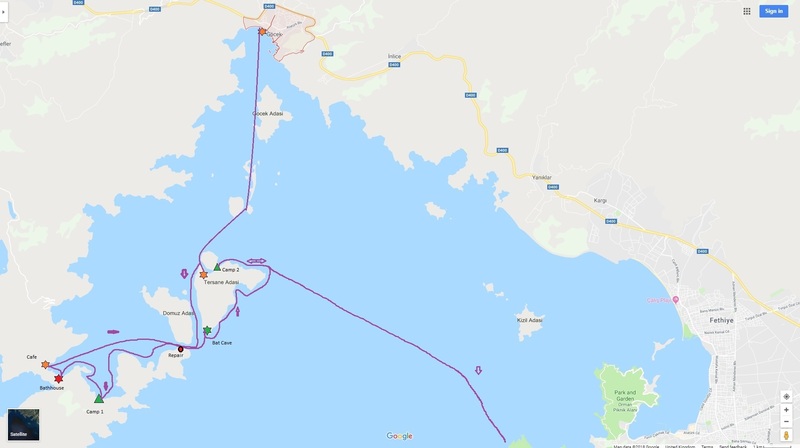 The original Gocek-Marmaris plan had been abandoned in favour of a route done some 8 years earlier around the islands in the bay and then down the wonderful but exposed 7 Capes to Potara. 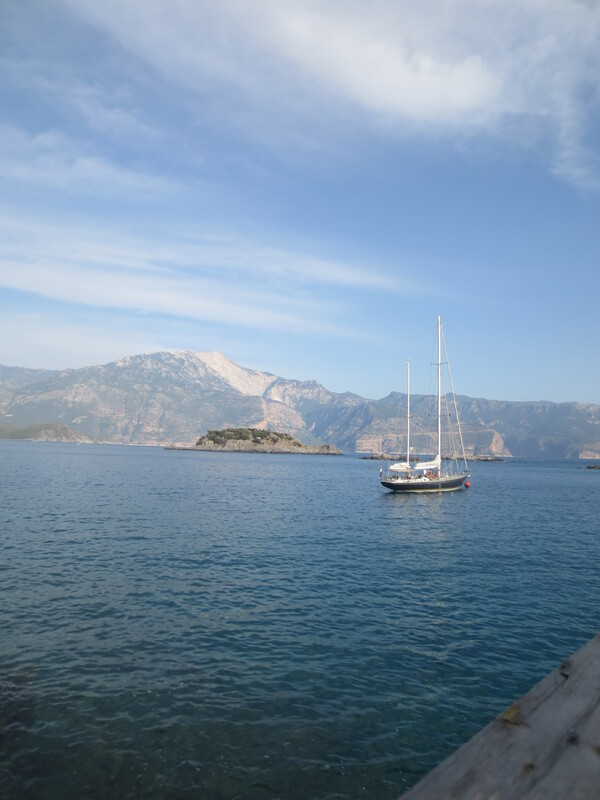 From Gocek we headed for the island chain, stopping for a late lunch at a small cafe on Tersani (adasi/adas means island) where we were tempted by a portion of Calamari and Chips. On then towards the southern most point of the chain where we had a beer in a small cafe and then made camp on a small, adjacent untidy beach. 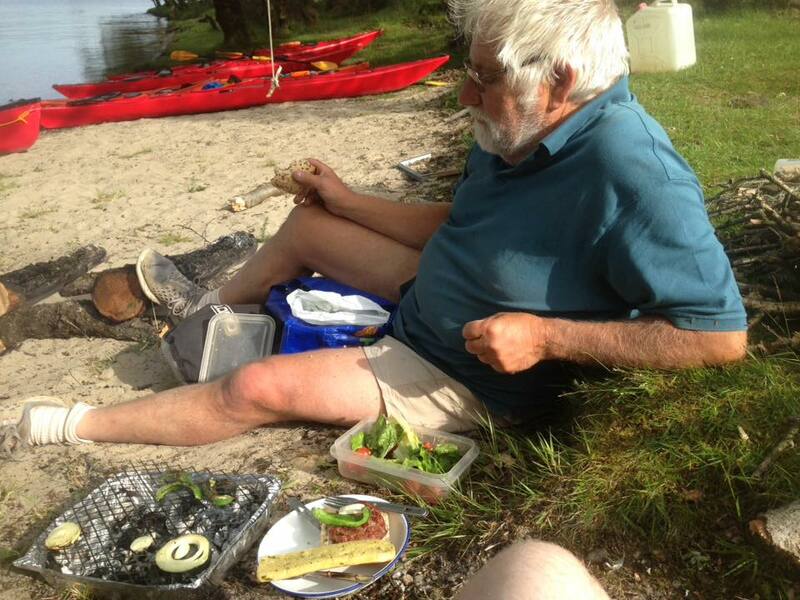 A fire was lit and we settled down to bread, cheese and non-alcoholic beverages before turning in early. 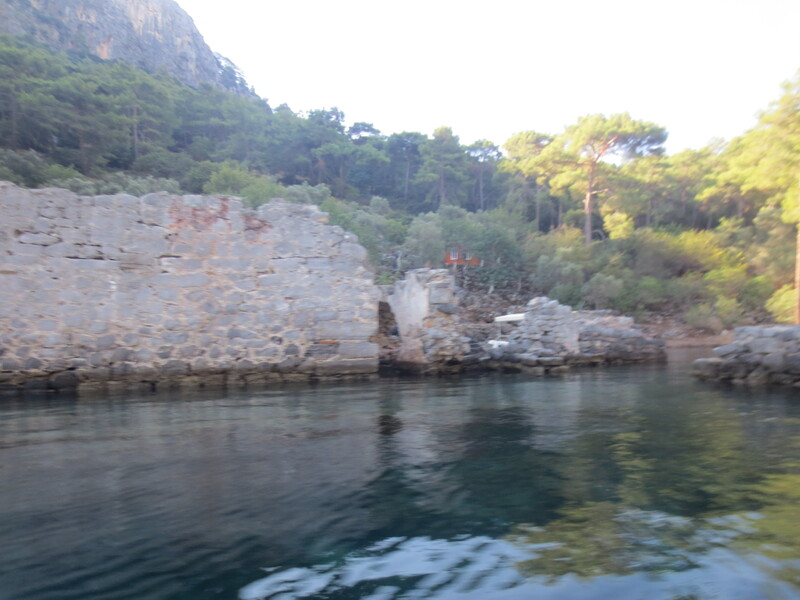 A lovely day greeted us as we slipped from our beach and headed for the ruins of a Roman Bathhouse on the opposite corner of the bay. 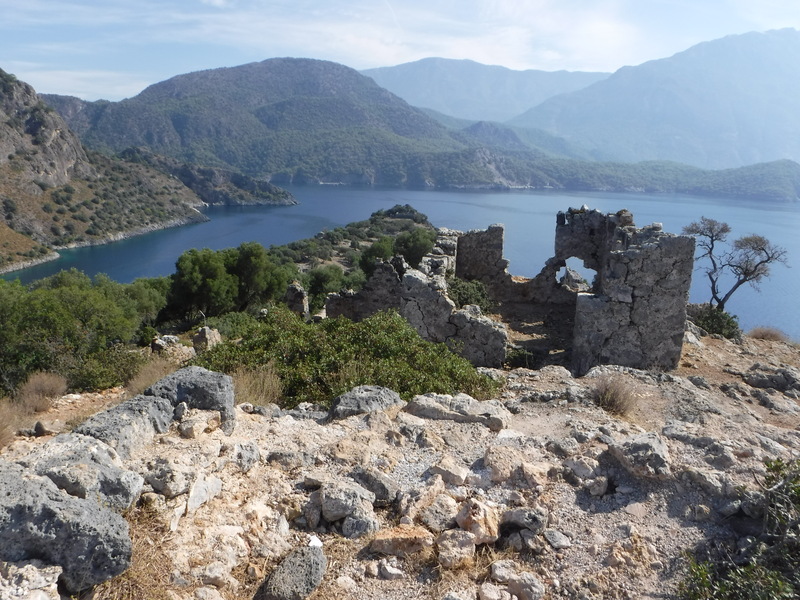 Our next port of call was a pristine sand beach and a cafe opposite the ruins. 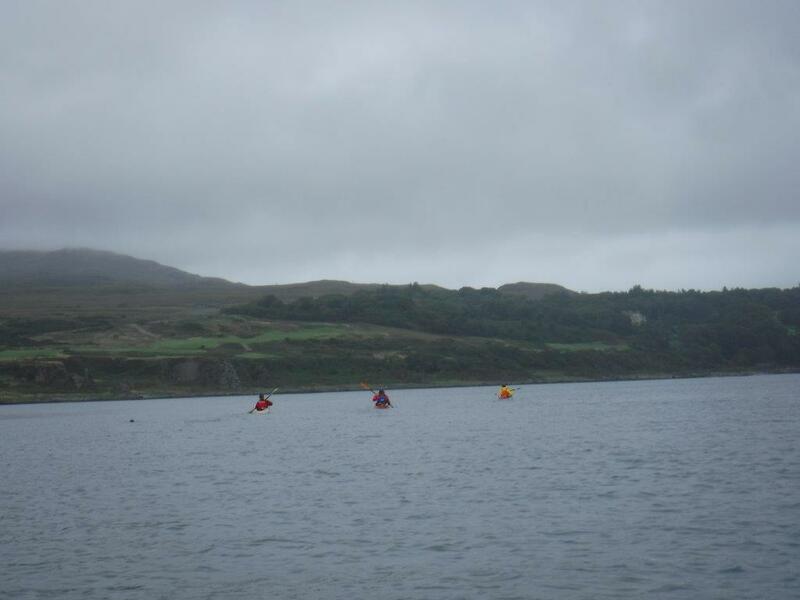 The swim was excellent, the coffee better and the toilets superlative. 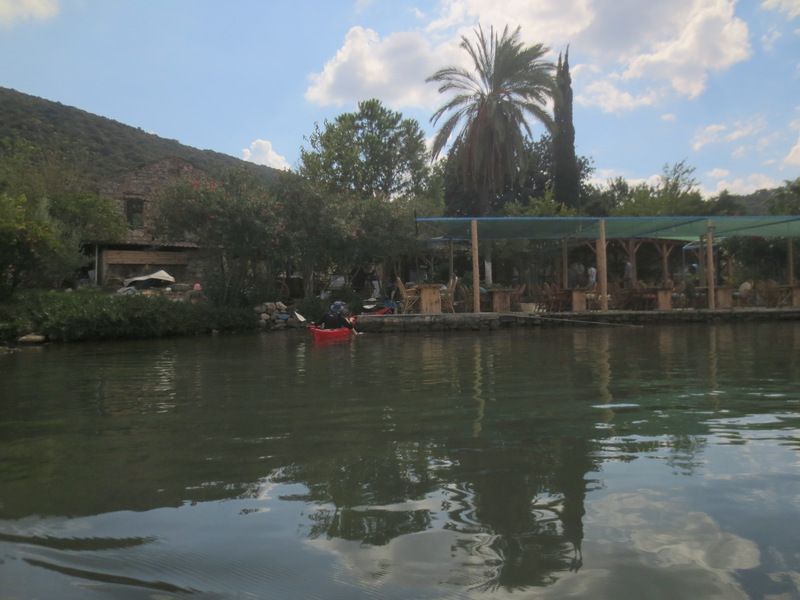 Strongly recommended if you have lots of time but we were hoping to make it most of the way across the gulf to Karak Adansi and left a little late. En route we stopped at the Migros boat/shop to try and get some wine. Sadly it was all committed to the cafes that surround this area. 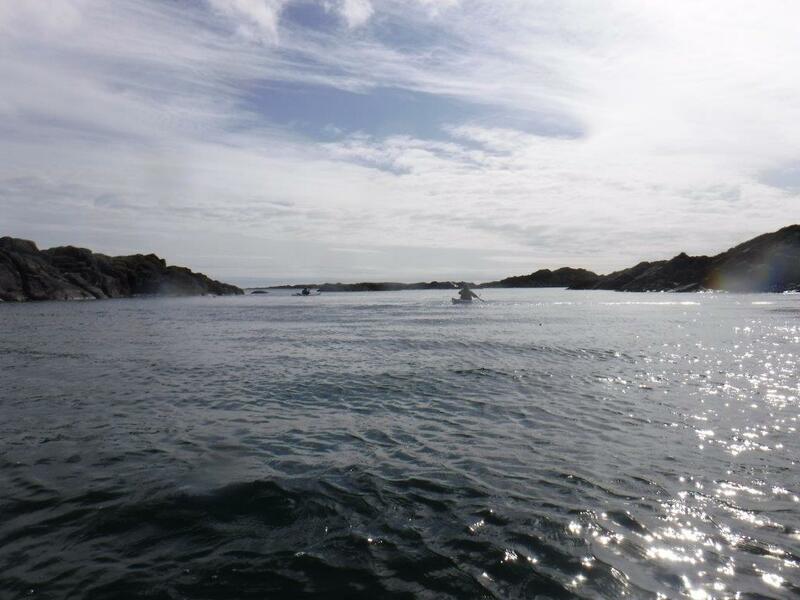 We pushed on only to come to a dead stop when the back of Hugh’s boat sank beneath the waves. 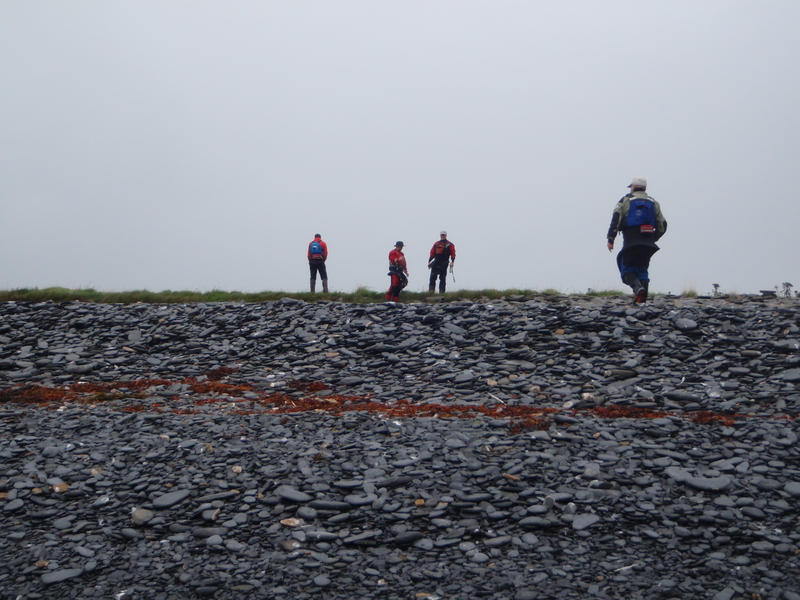 An emergency stop was made on a six metre long by half metre mix of rock and shingle. The “filling” of the skeg box (rubber and mastic) had come away and the hole at the top of the box (where the skeg cable enters the boat) was taking in water. 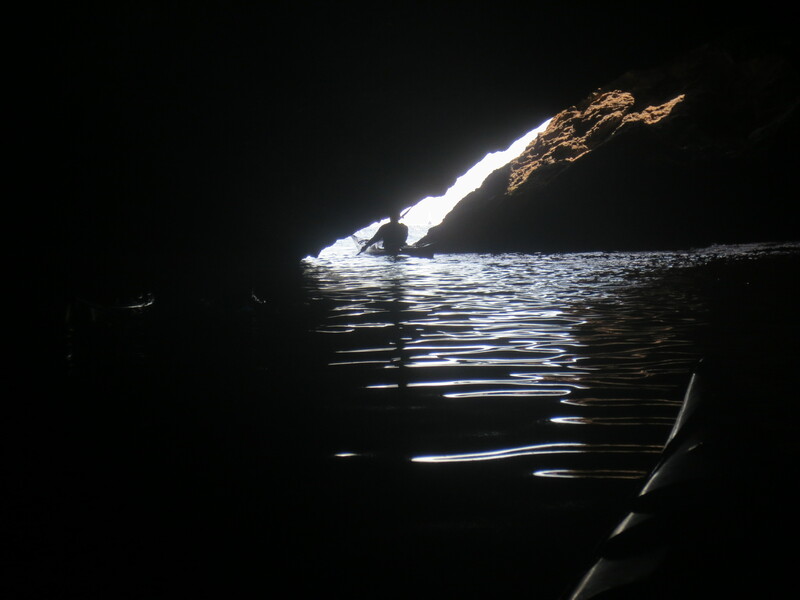 If the sea is calm and the back light, the water does not get to the top of the box but sadly, in this case, it did. 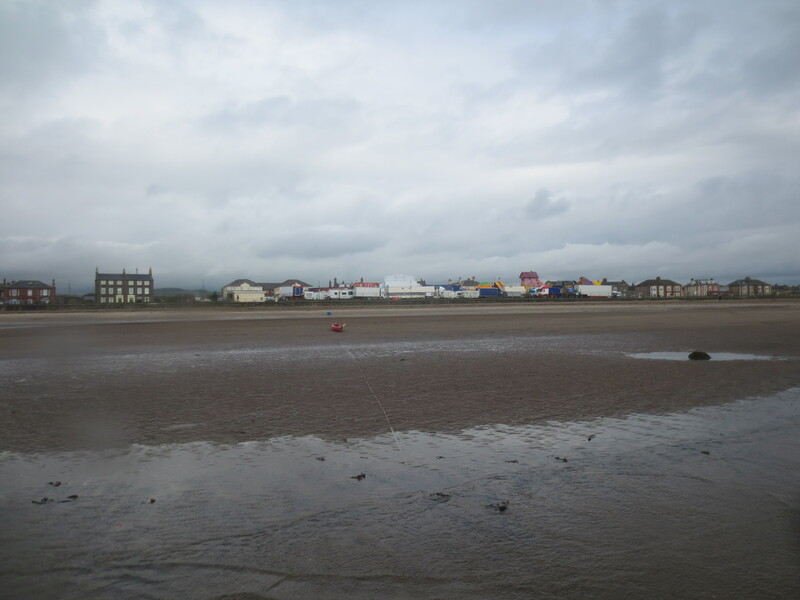 The boat was emptied of water and the skeg area taped, and off we went again, with the proviso we would stop on a decent size beach to dry out and check the taping. 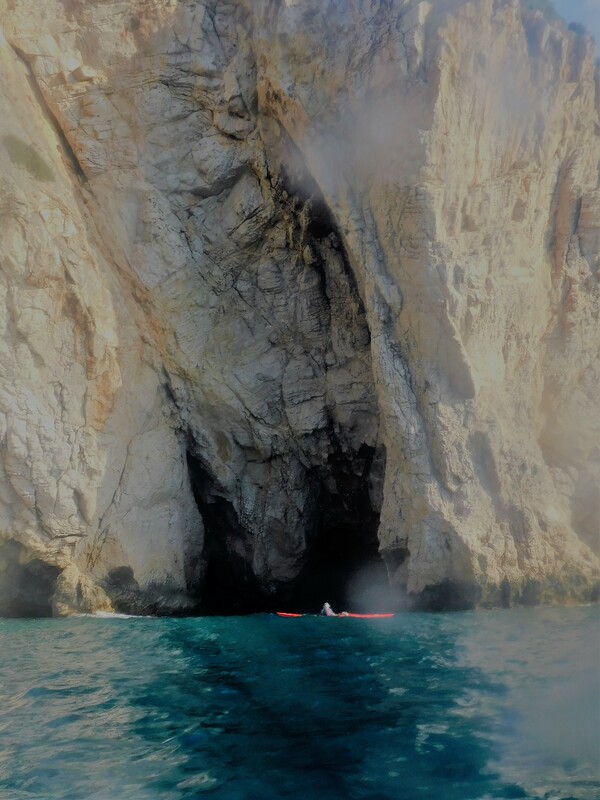 Just across the next channel Hugh identified a slit in the cliff which he remembered as an impressive cave, filled with bats. Wildlife is scarce throughout the area presumably because of the heat and dryness. 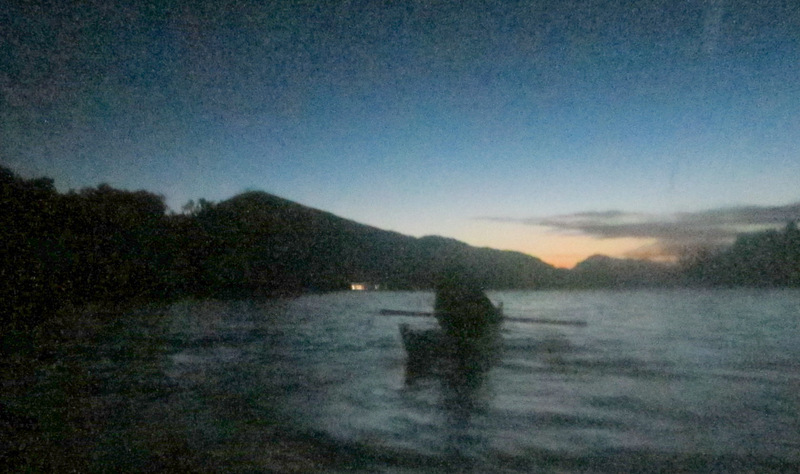 Bats were unusual as was the turtle that came up to the boats at one stage. 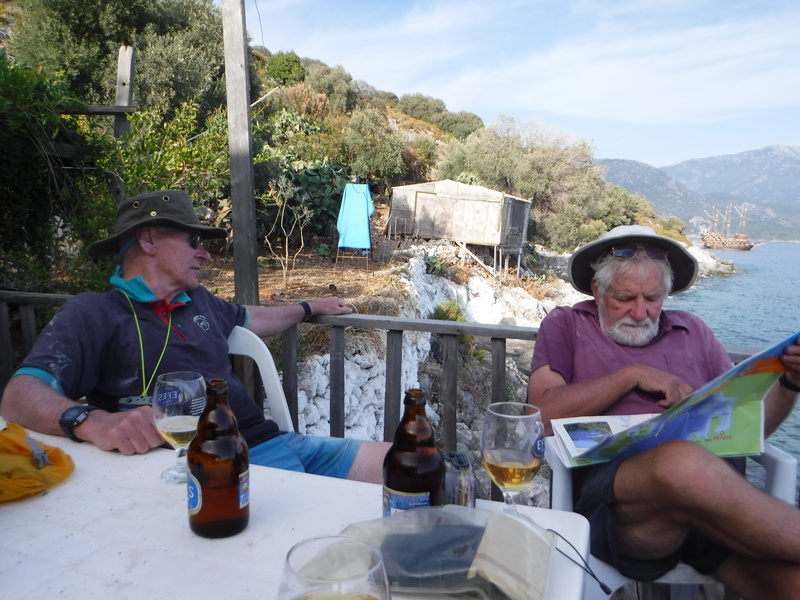 On odd occasions we saw Feral Goats , large sea birds and raptors but sightings were very limited. After the cave we were looking seriously for a beach but in the end had to go back to a camp site we knew , close to the cafe of the previous day. 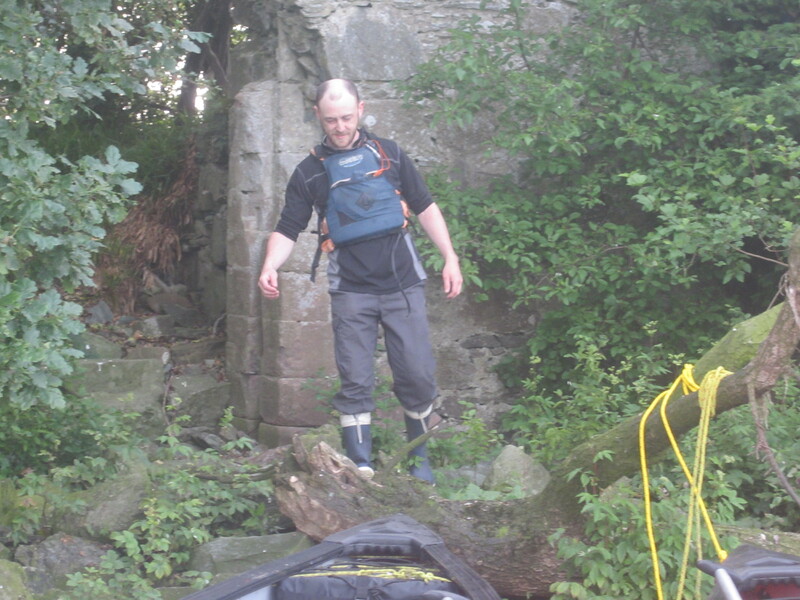 Here we stopped after a short day, put up the tents and set about trying to secure the boat from water ingress. 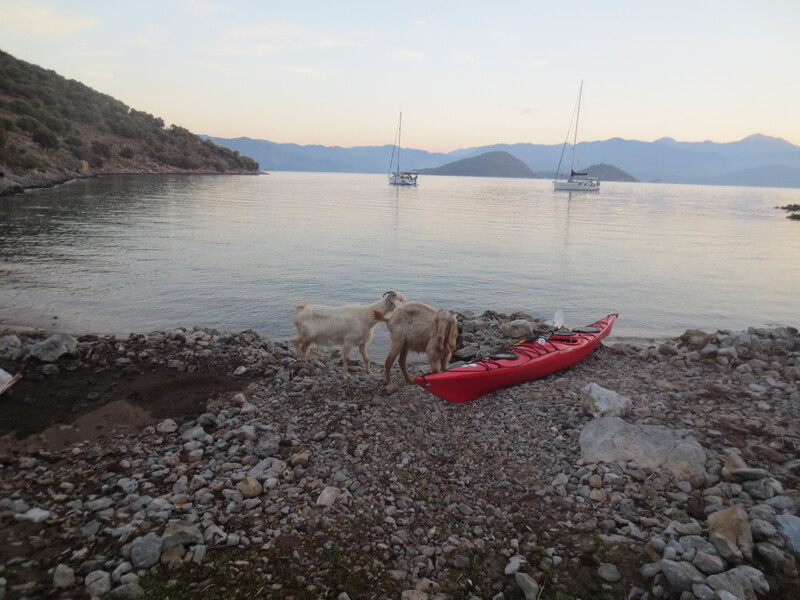 During our stay we were visited by a large (30 strong) herd of goats but they were harmless if over-friendly. The evening ended once again around a fire gossiping. Another beautiful day with a wonderful view. 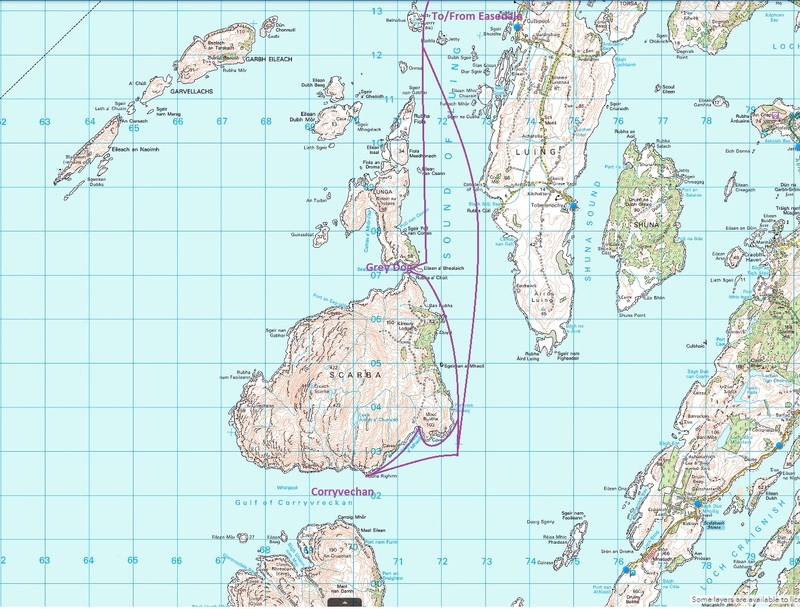 Completion of the planned trip meant trying to make up some time so a decision was made to cut straight across the gulf, about 20km. 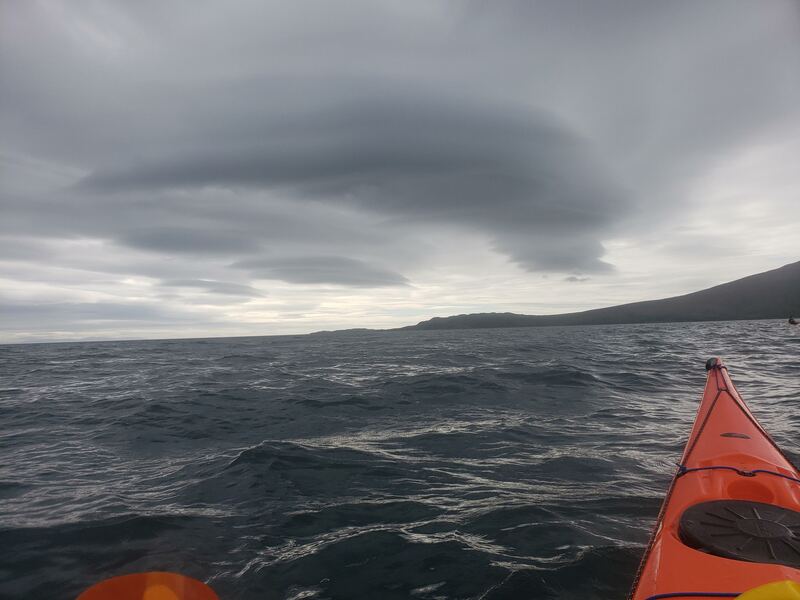 Although it was very exposed and there was a big swell coming in from the south, there was little wind so that when we reached the other side we just continued south. At this point the cliffs became quite huge and there were simply no places to stop. 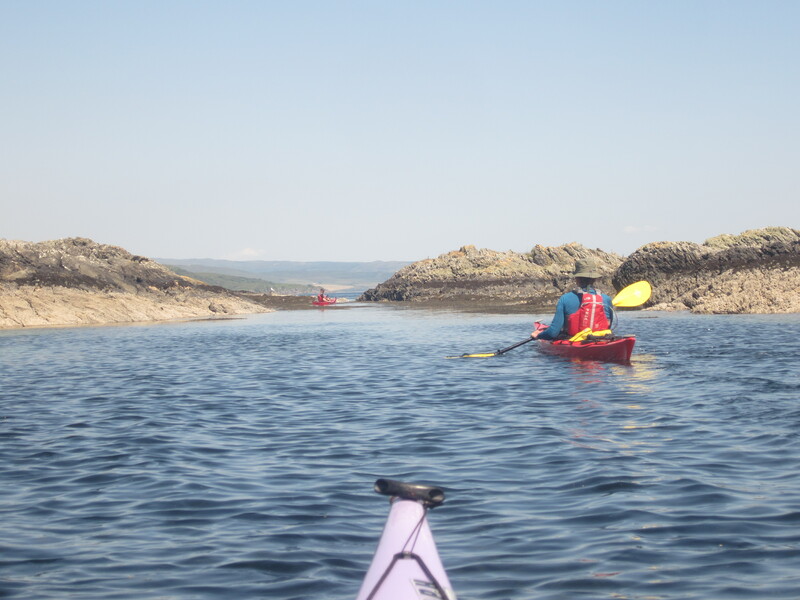 Fortunately just before we were due to reach the first serious water at the Cape there is an inlet with a tiny beach at its end. 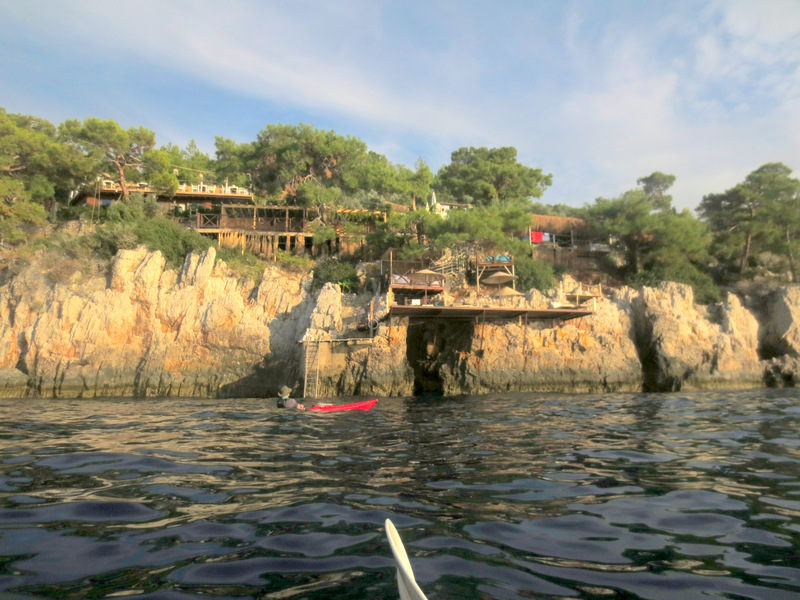 Amazingly perched on the cliff was a bar (closed) accessed by a funicular railway. The economics of the scheme are a mystery. After lunch and a swim we embarked on what proved to be the “crux” of the trip. 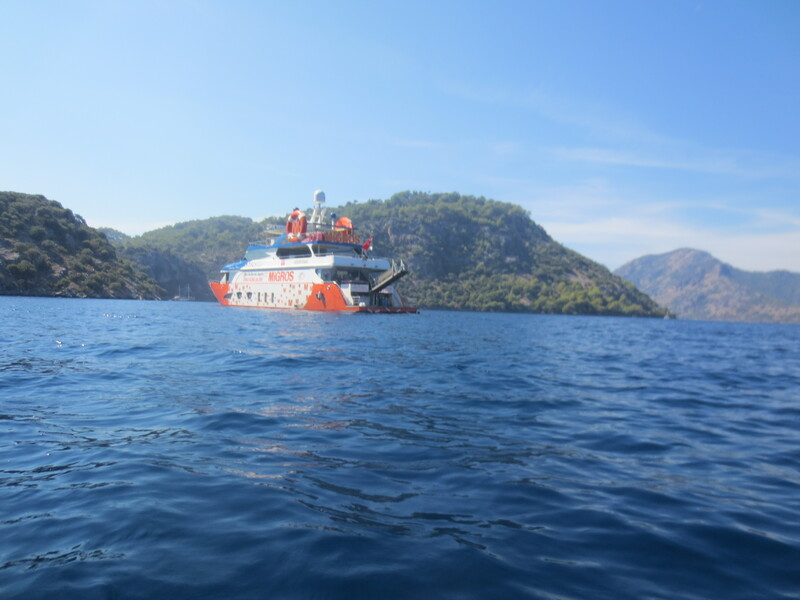 A large swell from the south-west had been with us since we started and increased in size as we moved out of the Gulf. 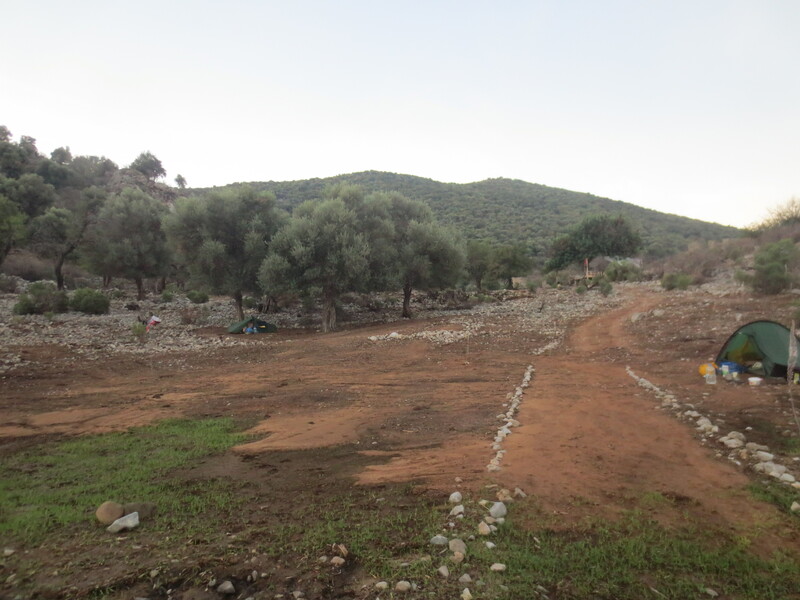 We believe it was the product of the hurricane that had come through the Aegean the previous Friday. Whatever the cause the product was really rough water as we passed the Cape, hence an absence of photographs! 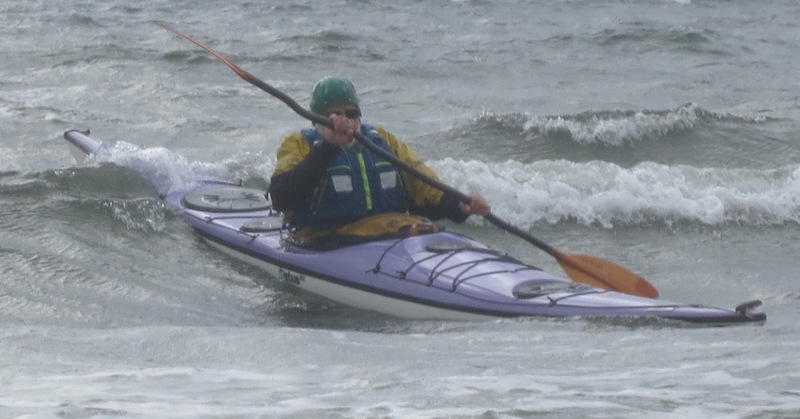 That said with relatively light wind and warm sea it was enjoyable rather than frightening and after 20 minutes or so we were round and riding the swell. What this period of turbulence did do however, was to periodically submerge the back and then front of the boat, causing any holes at the top of the skeg housing to become submerged and the rear hatch to start filling with water. Some four hours and 30 plus kilometres after starting we finally pulled into Katakaoren, a small cafe and yacht mooring, for a couple of well-earned pints. 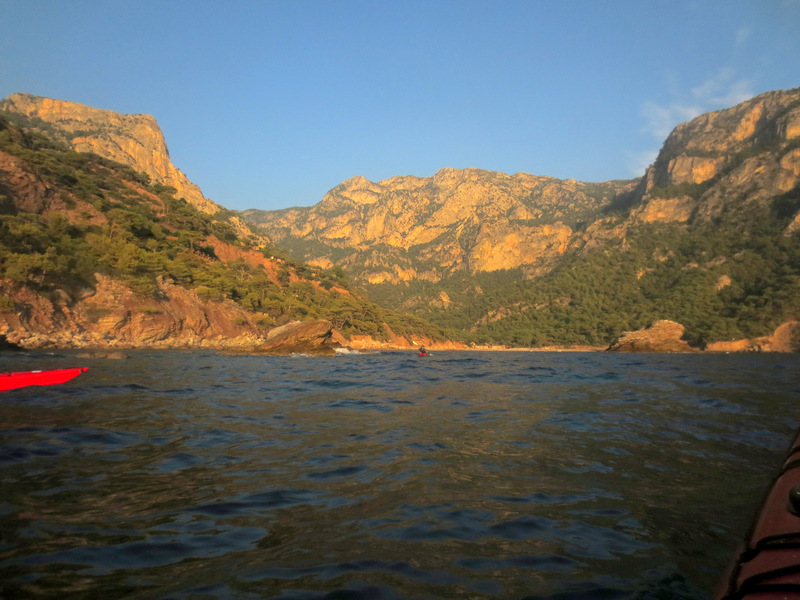 Time was running out when we returned to the boats and headed for the beach at the road end at Gemile. On the beach they were filming a Turkish comedy involving water sports so we wandered along to the cafe at the other end of the beach for another beer and to investigate the camp site. 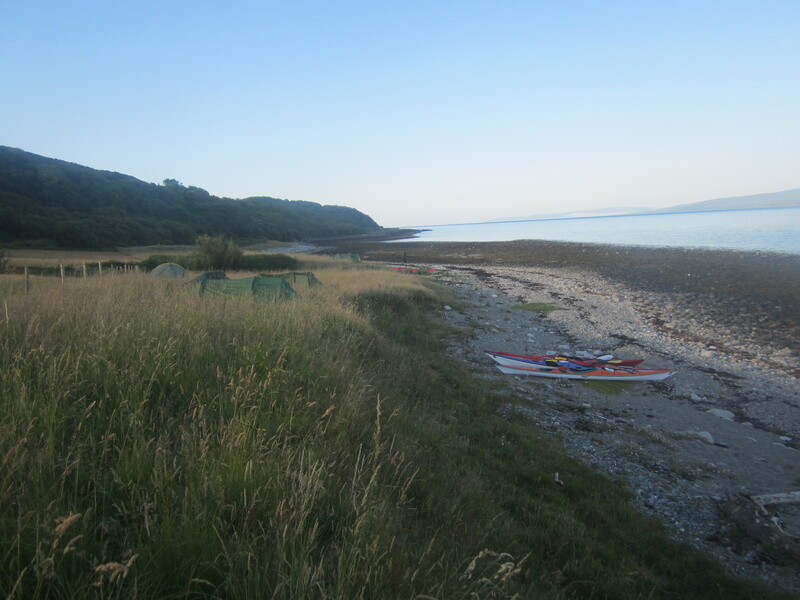 Eventually we agreed just to camp on the beach and just as darkness fell started pitching only to discover that Geoff’s tent was floating in a three-quarter full back hatch. Not happy; on sand with every bit of the tent, in and out, wet; no light; and physically tired after a long day and three beers. 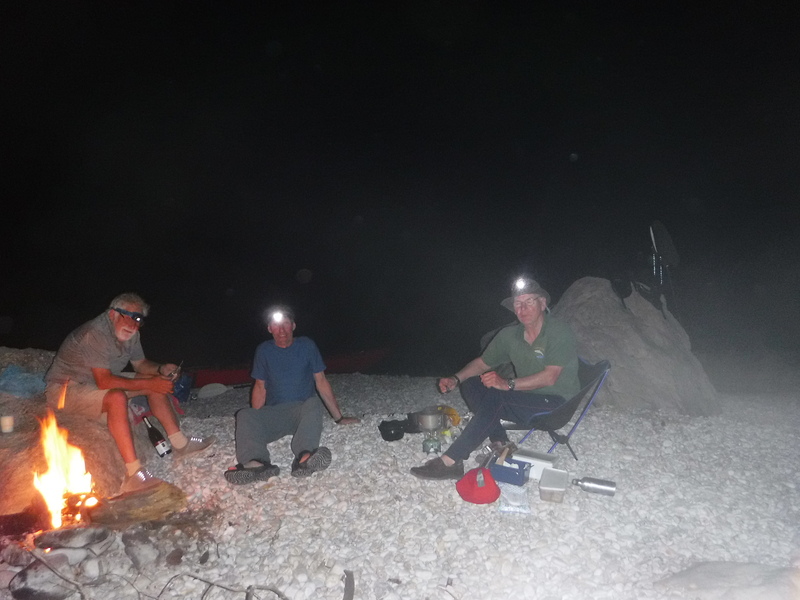 Ten minutes, lots of swearing and able assistance from all and things were back on track with a meal, beer and a chat with the watersport locals by the fire in their shelter. 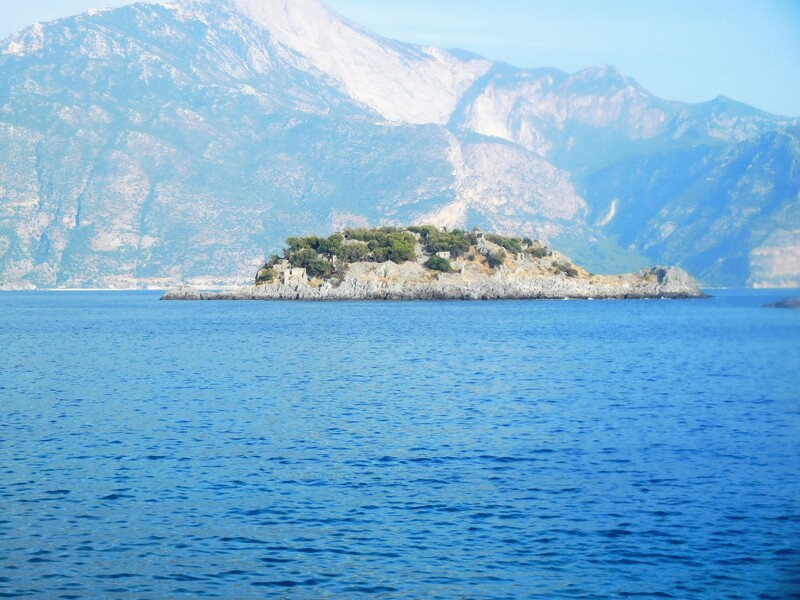 Gemile Island lies just opposite the beach and was an important Christian Orthodox monastery dedicated to St Nicolas (Father Xmas) who was born locally. 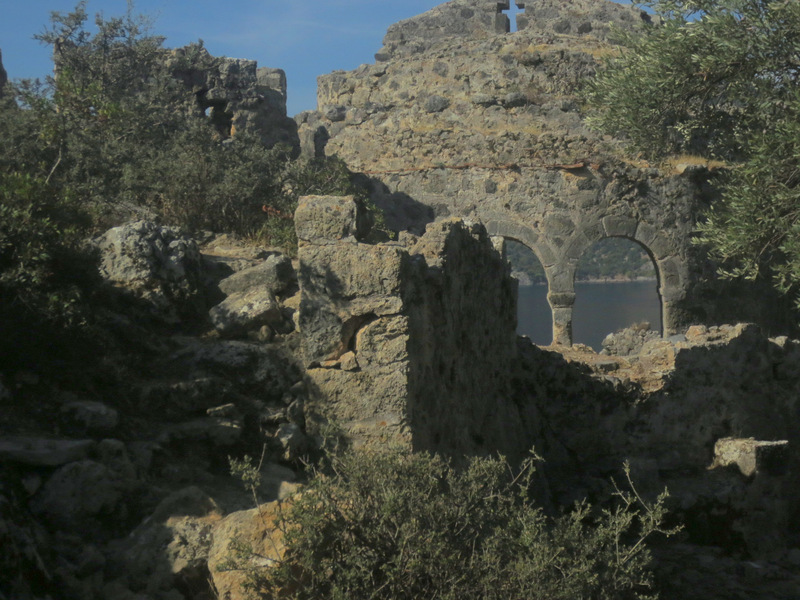 On the island there are the ruins of 5 churches dating between 400 and 700 AD. The most impressive feature, apart from the staggering views, is a processional colonnade that runs up the hill from the north-west. St Nicolas Island is awe-inspiring, incredibly old (the Romans had just left Britain when it was being built) and really neglected. 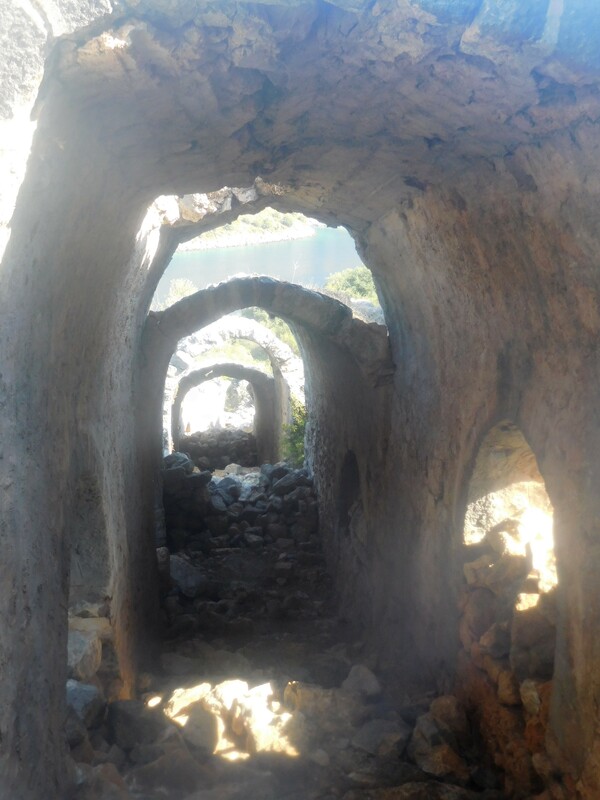 Turkey has so many ancient ruins (see previous reports) it simply does not have enough money to deal with them. In this case the very limited preservation work is being funded by a Japanese archaeological group. 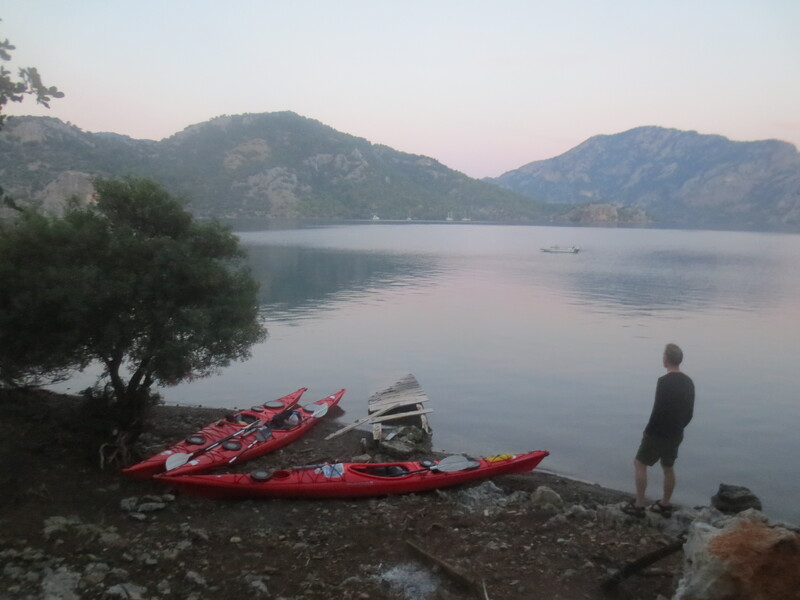 The next planned stop was the resort town of Oludeniz for resupply and, if possible tape for the boats. 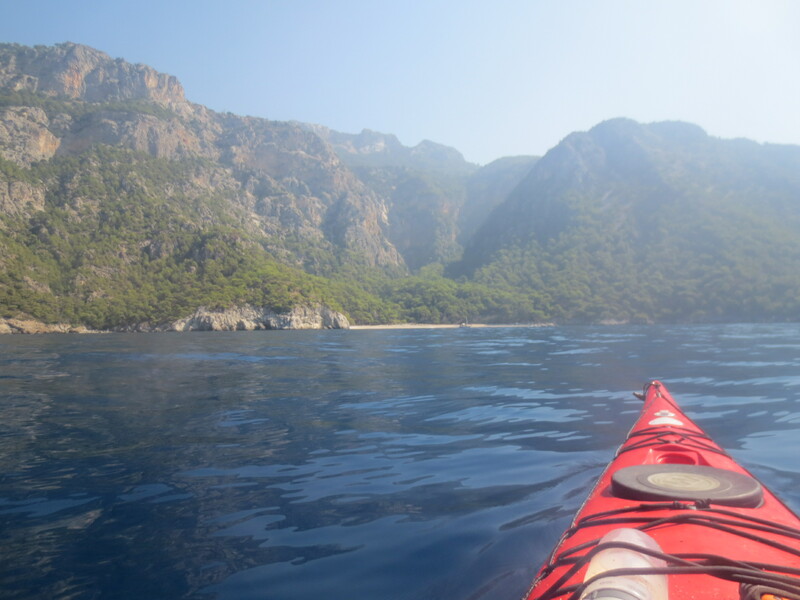 However half way along a coastgaurd rib drew up and proceeded to interrogate us in Turkish. Finally they resorted to a smart phone and a translation system to tell us to be careful and not to go too far out. 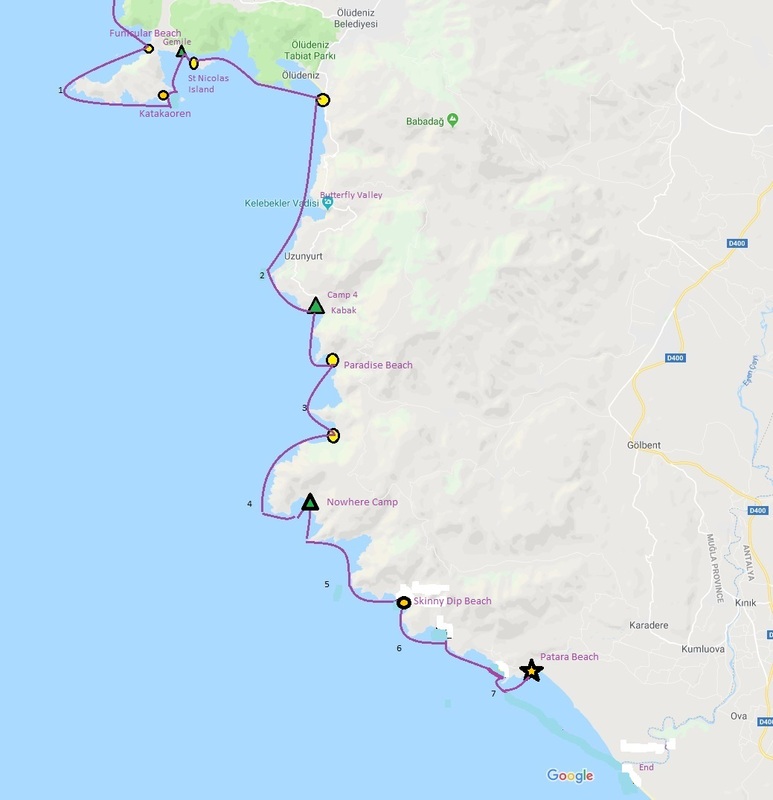 Why this was necessary is a matter of conjecture but our feeling is that perhaps we had been spotted rounding the cape the day before and somebody had phoned in their worries. 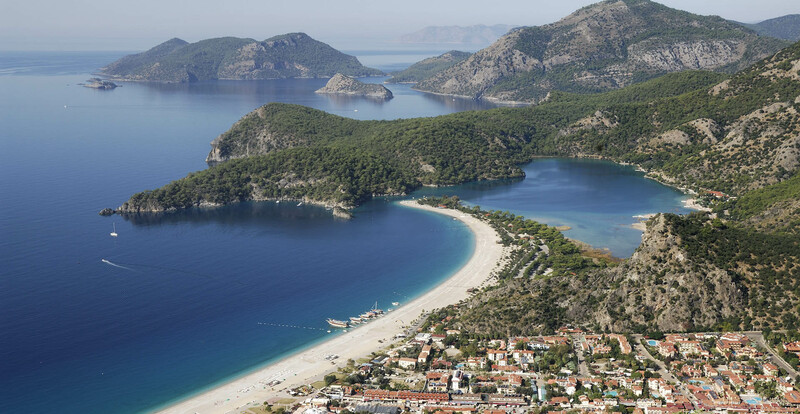 Oludeniz is an extremely attractive beach resort with a lovely lagoon and an excellent beach. The town itself is mainly cafes, many of which are orientated to the British visitor with football on the TV and English Breakfasts everywhere. Behind it the limestone mountains rise precipitously and provide a unique feature; hundreds of hang gliders launching from a platform close to the top. 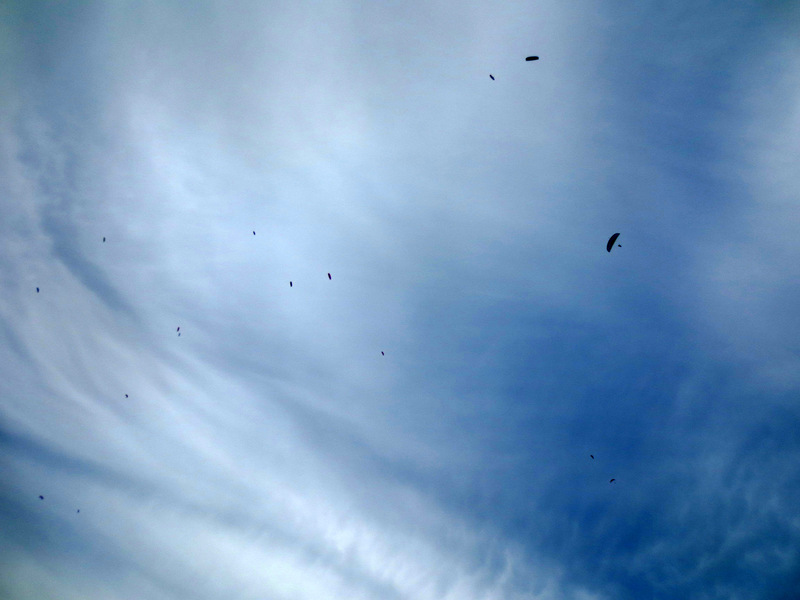 At any time there can be 40 or 50 hang gliders in the air descending to the promenade in the town. As with food and accommodation the cost of the flight (£45) is less than half the cost of a similar flight in Austria or Switzerland. 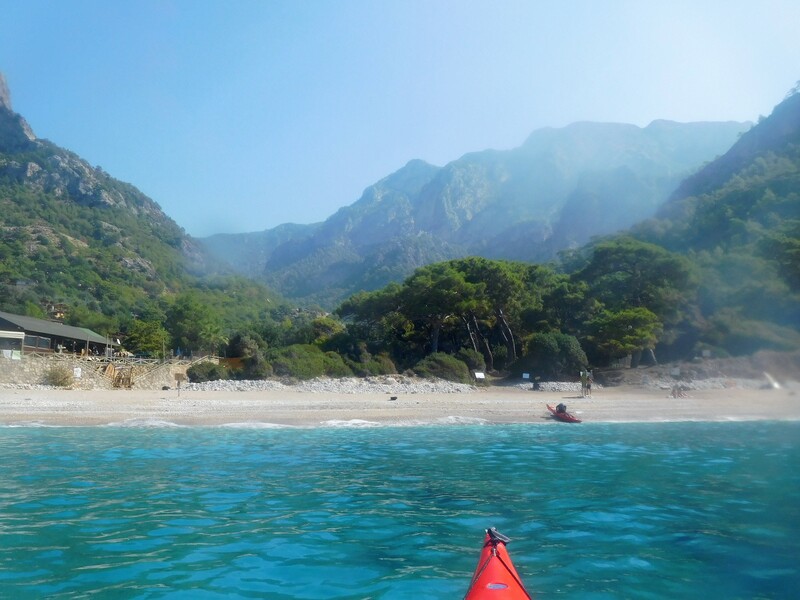 After a fruitless long hot walk through town looking for tape, we set off again heading east for Butterfly Valley and if time allowed for Kabak. 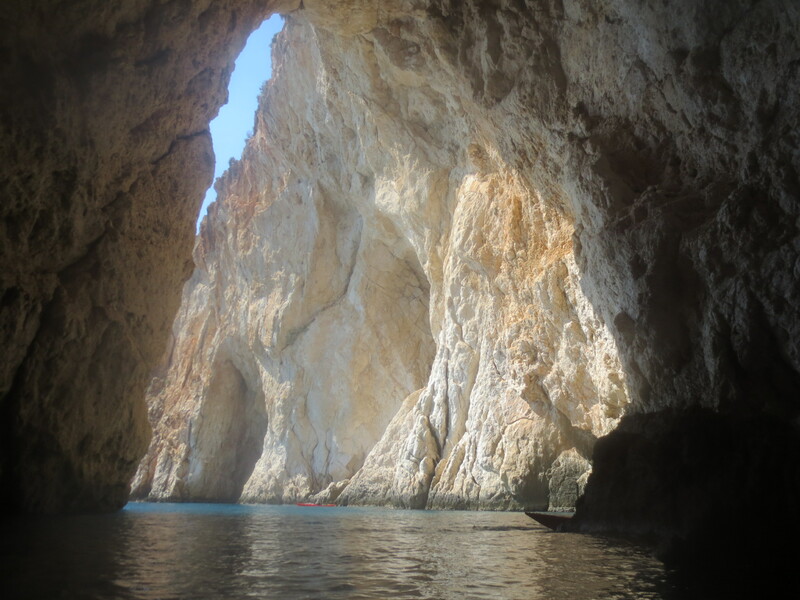 Once again there were towering cliffs and small coves (some with houses perched above them) and the occasional sea cave to explore. 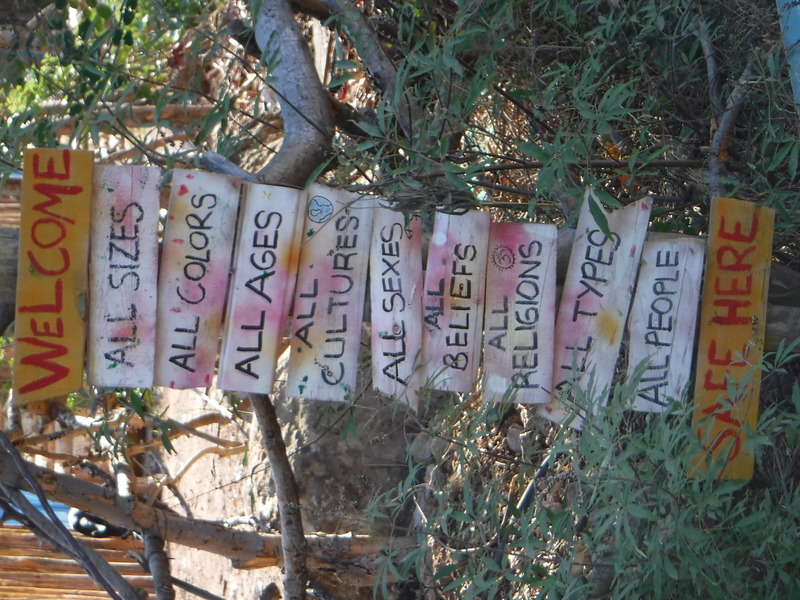 Eight years ago we had stayed in the holiday commune at Kiribak. 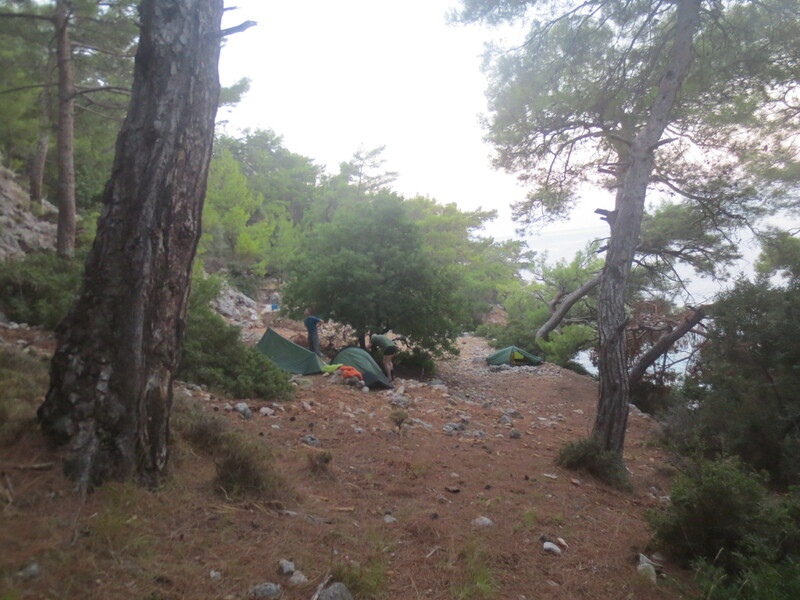 This still exists but a much smarter complex of cafe, camp site and bungalows has sprung up right on the beach. After landing, a beer and the appropriate investigation we decided on the B&B solution at 100TL (£13) and were rewarded with a lovely bungalow with a balcony looking down towards the beach where we could cook, eat and drink red wine. 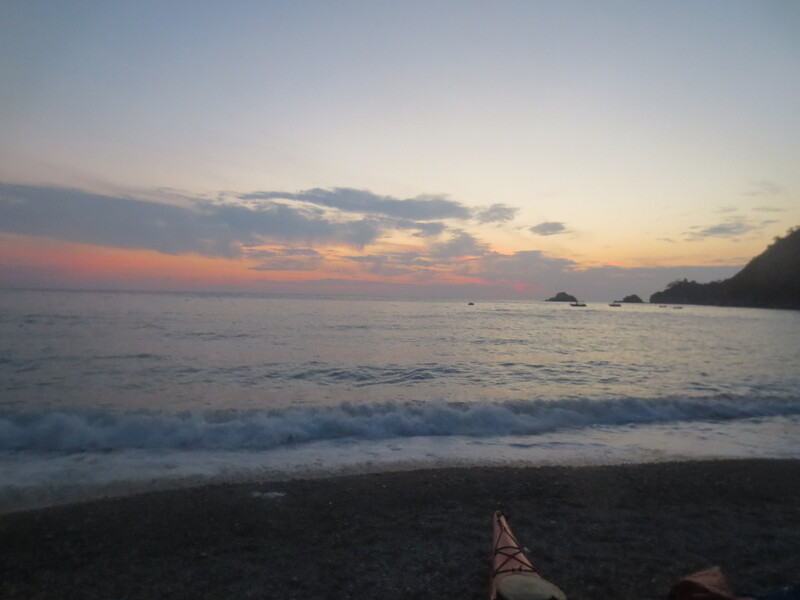 Plus there was a superb hot water shower and another lovely sunset. Life was good. The breakfast was amazing. In addition to a pile of newly cooked bread there was butter, 2 sorts of cheese, 2 sorts of olives, tomato, cucumber, honey, peanut butter, a sweet date based type of jam and as much coffee and tea as required. In addition there was a plate of fried potatoes with frankfurters and 2 eggs each. Quite the best B&B ever. 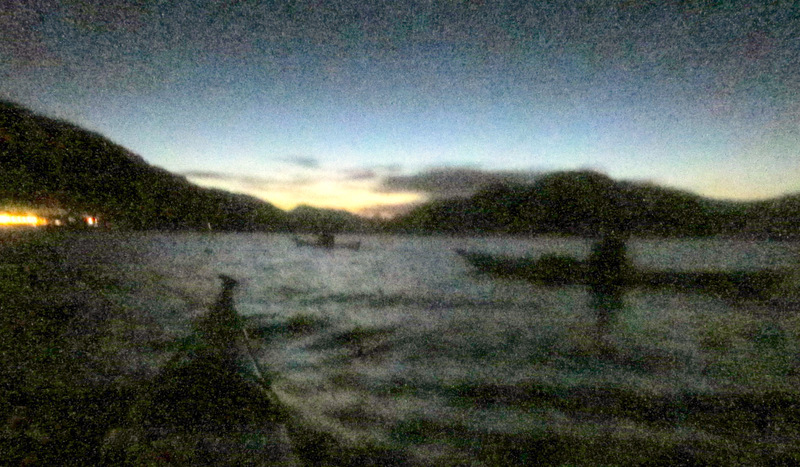 After re-taping with the last of the tape (which took the best part of an hour) and a small prayer to the sea-god that it would survive the final two days, we headed off again towards the next inlet and paradise beach. 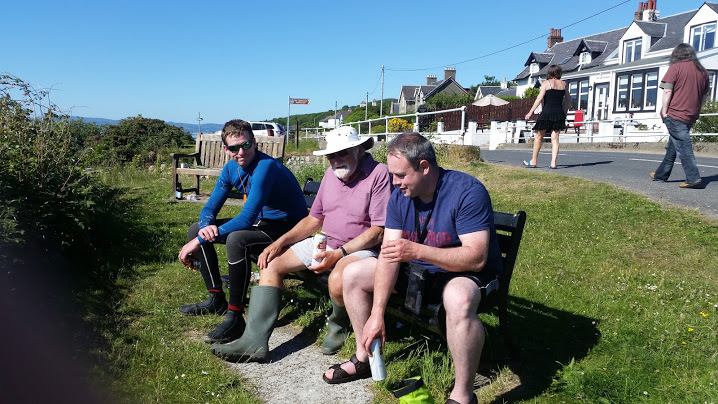 A break, a swim and then on again. 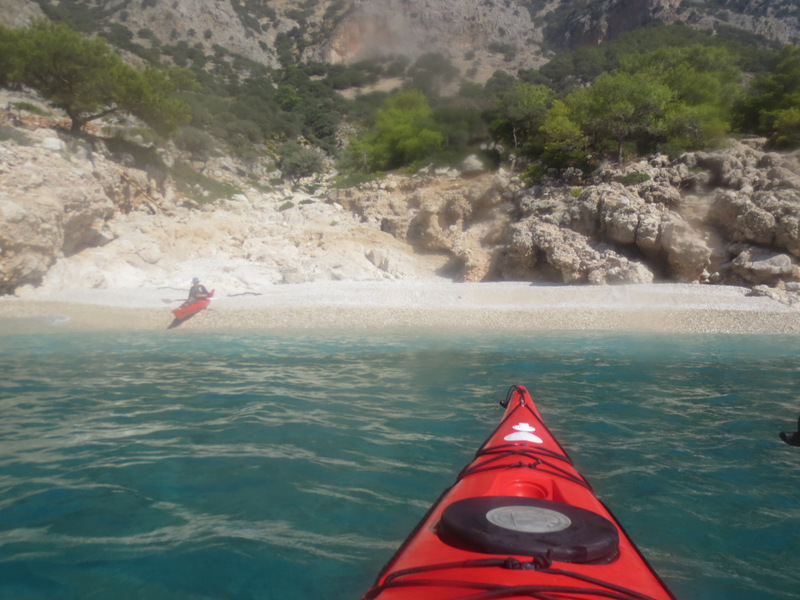 By this time beaches had virtually disappeared and we were looking for a small length of pebbles and a gulley. 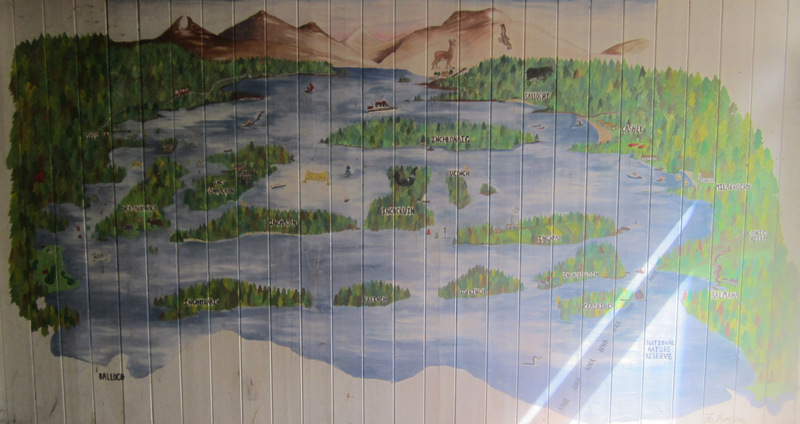 The first stop suggested we had found a place only to be ruled out by closer inspection of the awful map. 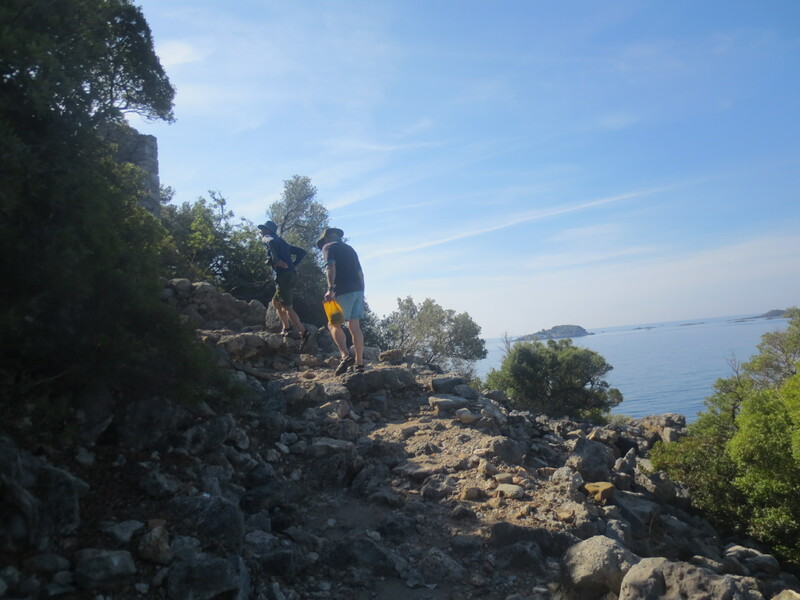 Eventually we found our site, a small pebbly beach, a rock strewn gulley and a couple of flat terraces. 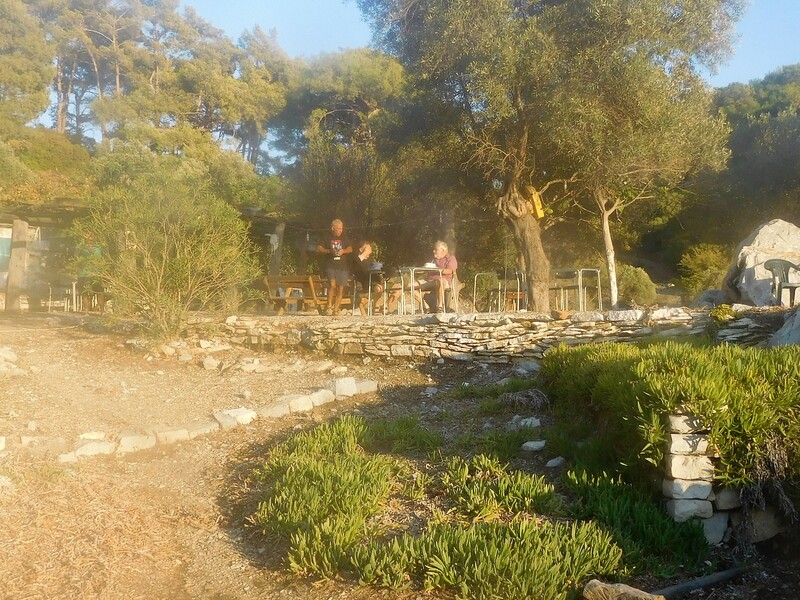 With food and fire on beach and tents on terraces we settled in for an excellent final night. 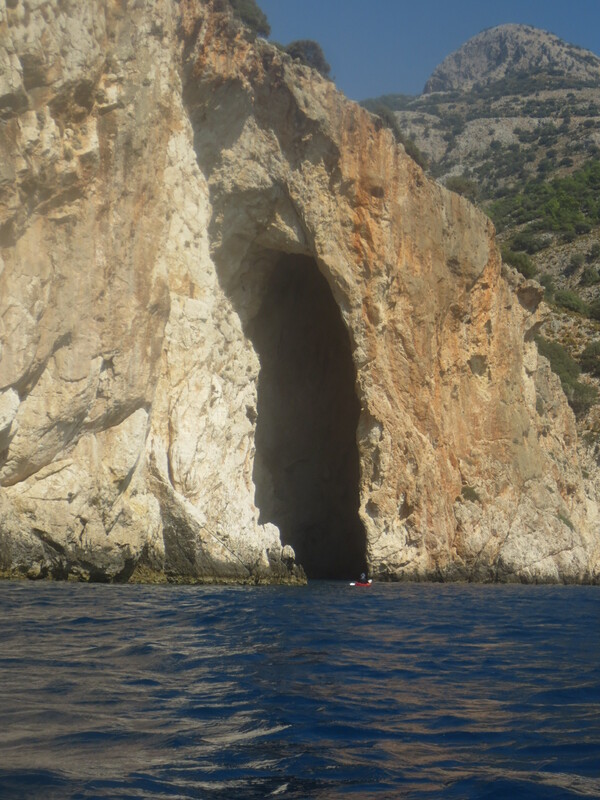 The outstanding feature of today’s trip was the “Cathedral” cave, vast and high domed. Further on. 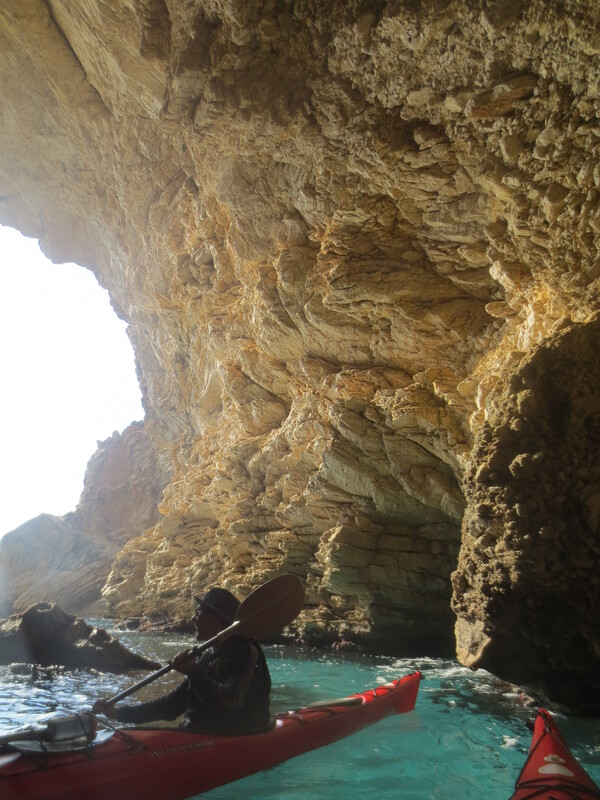 More incredible rockwork, more caves and more headlands. 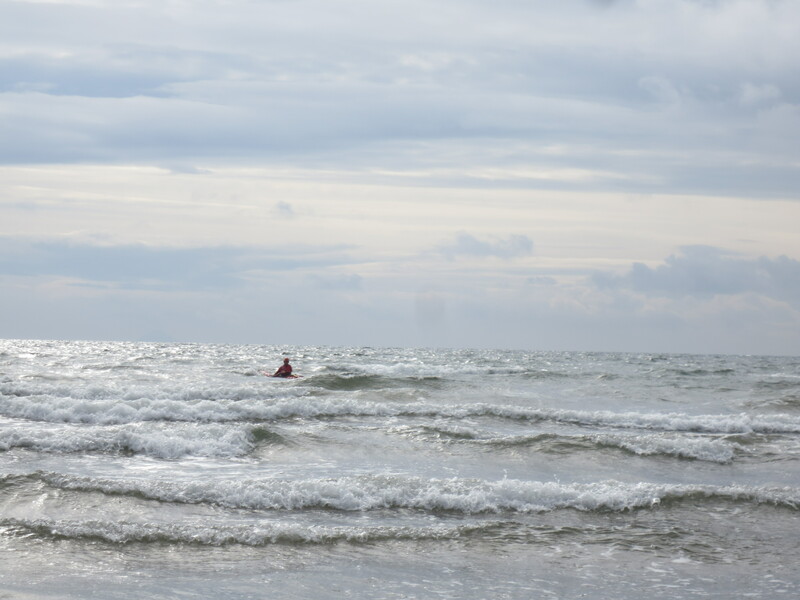 The final challenge was a surf wave at the entrance of the Patora river, which was duly conquered. 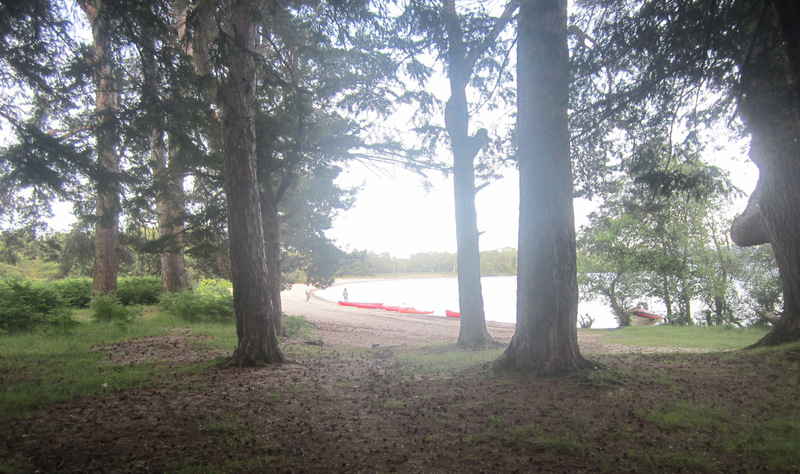 At the final beach (freshwater!) was the cafe for beer and food and a short wait for our lift back to the airport. 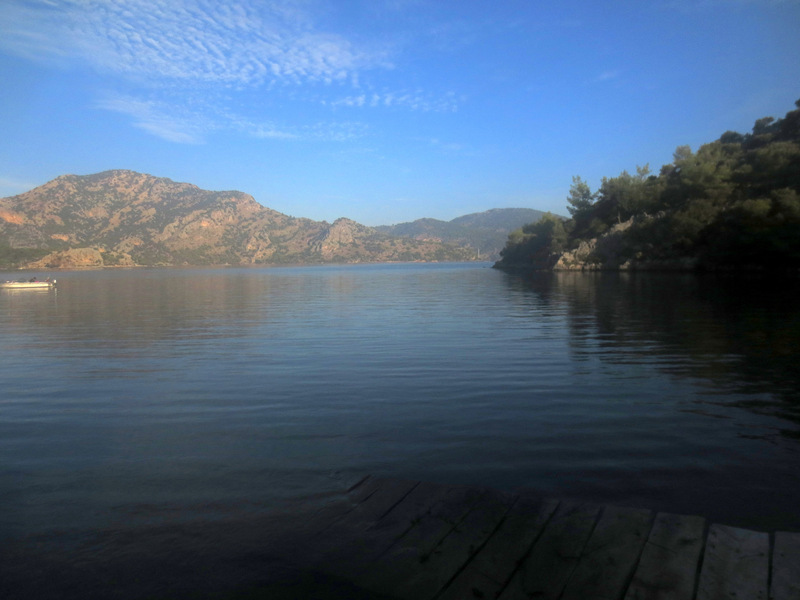 A trouble-free 2 hour trip back to Dalaman for coffee and cake and then on to the airport by 20:20 for the 22:00 plane back to Glasgow arriving at 00:20 UK time. A quick exit and we were home about 01:30. Another wonderful trip to a wonderful part of the world. 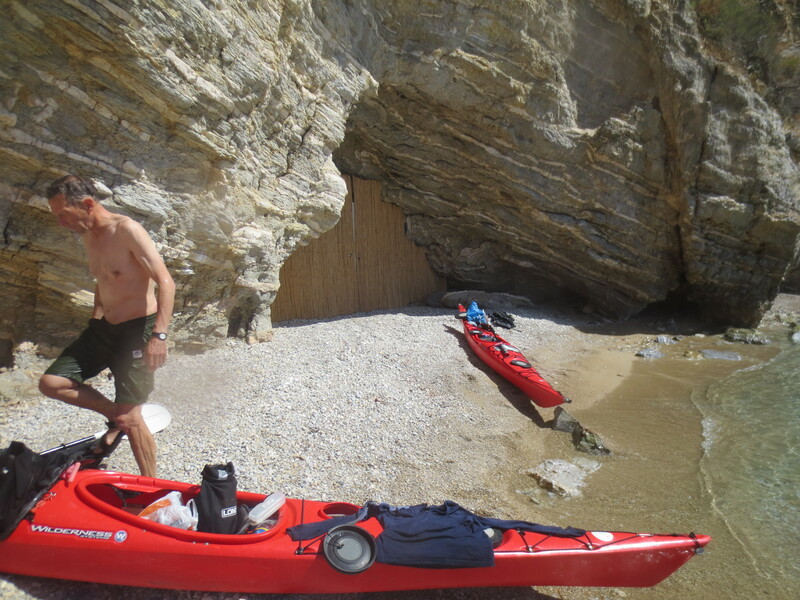 We covered some 124km and had a dozen swims on a dozen different beaches. 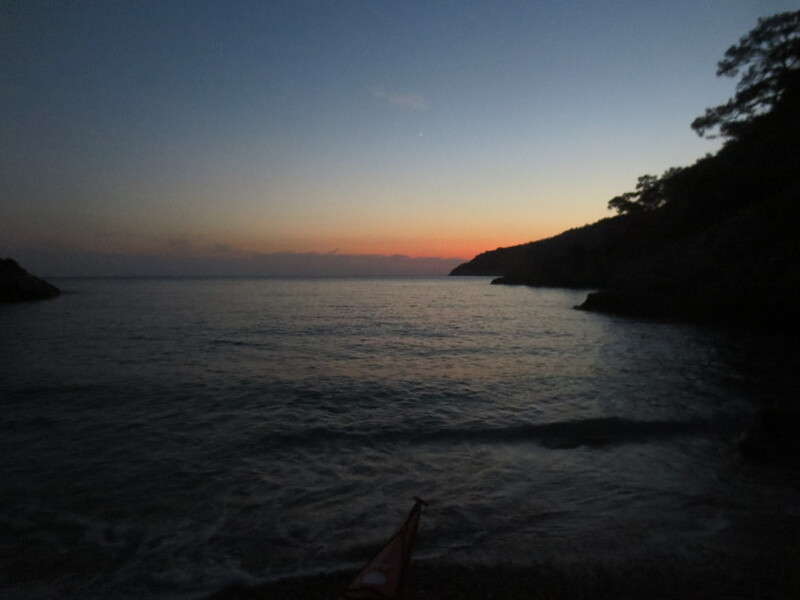 Temperatures at sea and at night were near perfect. Total Cost, including lots of beer, meals on the plane and in cafes plus two hotel “bed-nights” and airport parking was around £730. Tremendous value. Paddlers: Geoff, Gordon, Steve T.
Report: Surfing must be the very best activity ever on a windy Saturday in September. 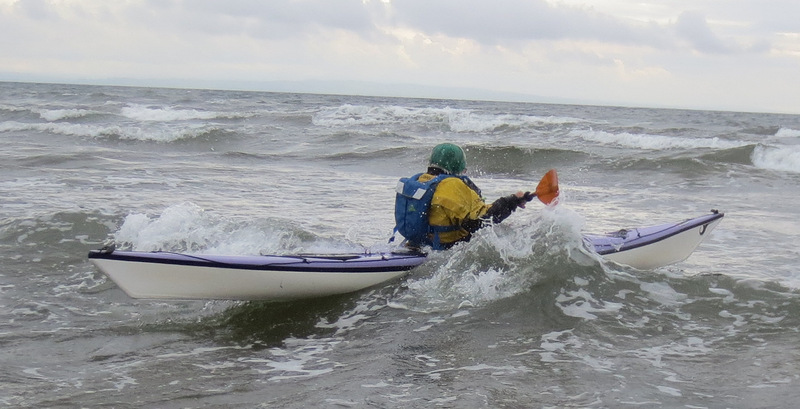 Normally undertaken in short maneuverable craft, sea kayakers occasionally find themselves having to land or leave through surf. 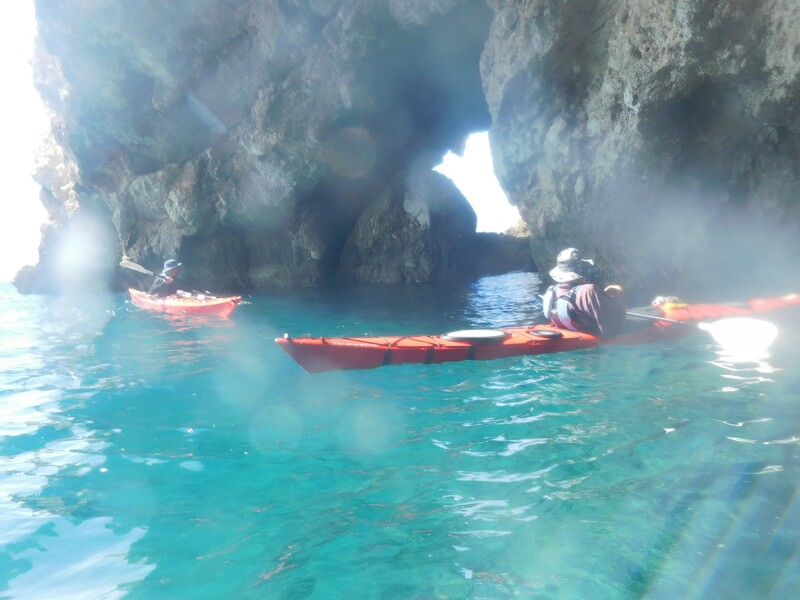 So surfing in sea kayaks gives a combination of tremendous fun and sea kayak training. 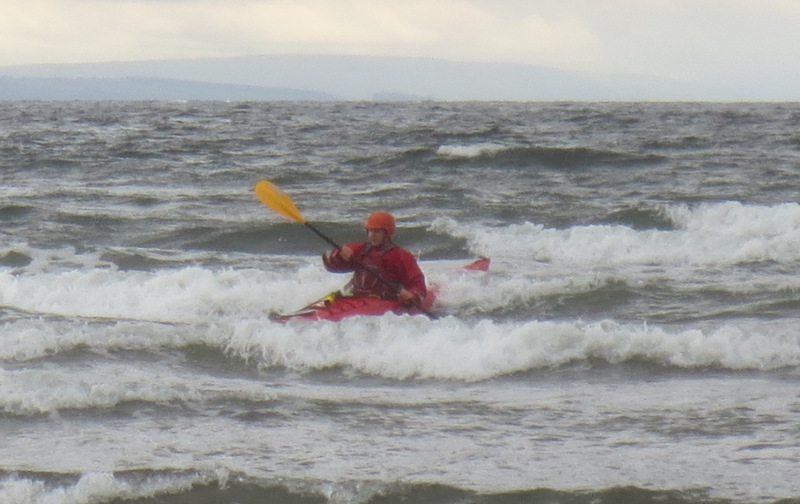 South Bay, Ardrossan is an excellent place for safe surfing. 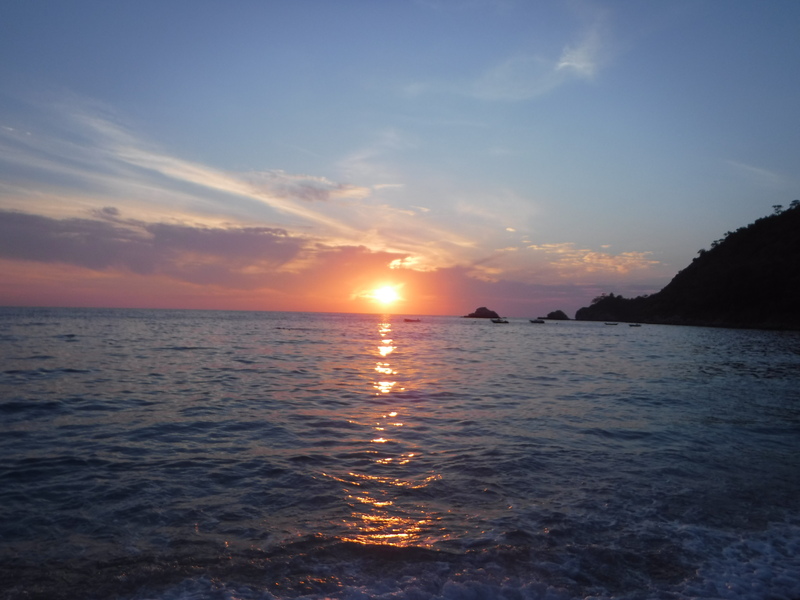 It is a crescent of soft sand of around 1km between two rocky headlands backed by grass with easy beach-side parking. 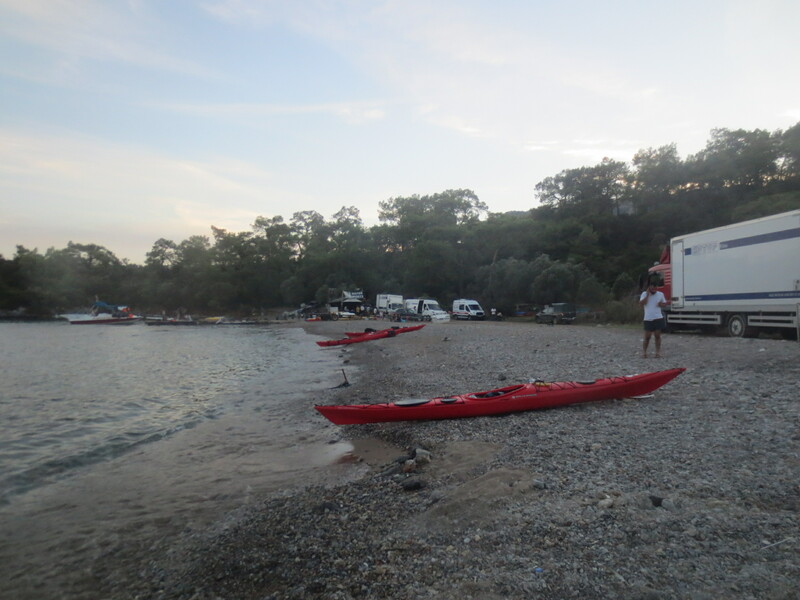 We parked right behind the toilets in the centre of the beach by the ramps on to the sand. Advice: Take a trolley as it can be a longish walk over the sand. The car journey in both directions was excellent and took about 70 minutes. The beach faces south west and we had a strongish force 4 from the South West. 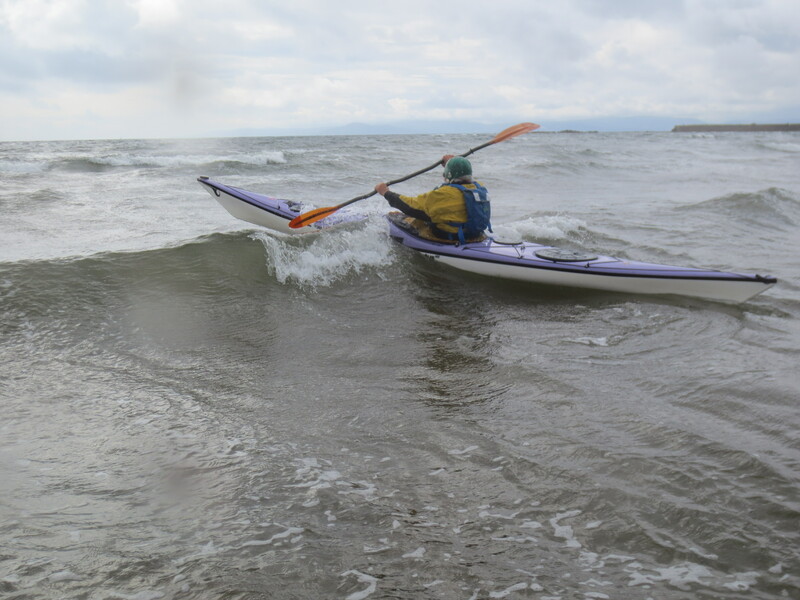 The tide had just turned and was on the way in over the shallow beach which resulted in extensive but not huge surf over a very large area, giving long runs. 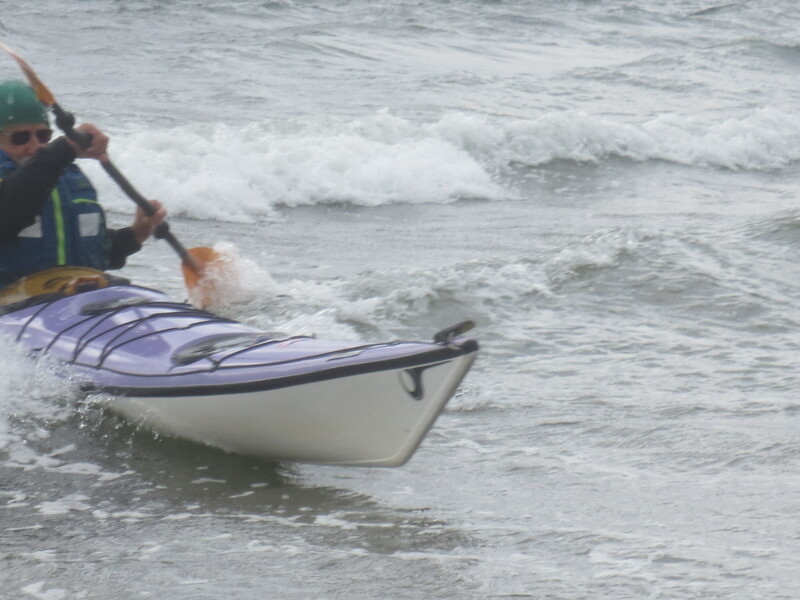 One of us was stationed on the beach the whole time to help with any capsizes (and to take photos). 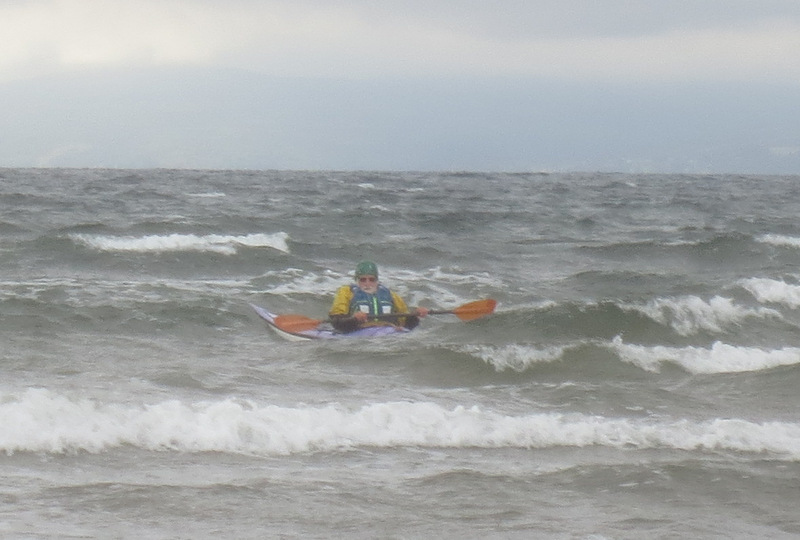 Kayaker at edge of breaking surf waiting for a run in. 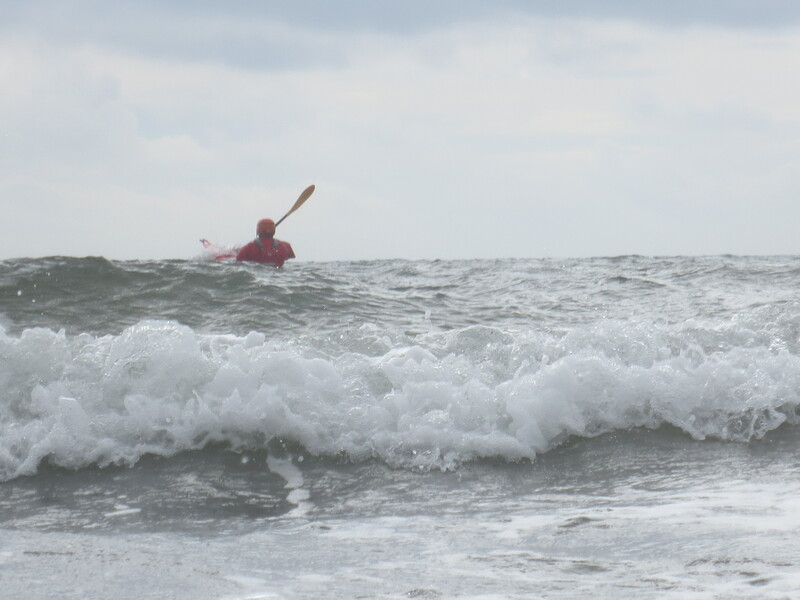 The paddle out was energetic and wet with kayaks either riding the waves or carving/smashing through them. Trying to figure out which waves would give a good ride was difficult as big waves were too frequent and broke too readily. 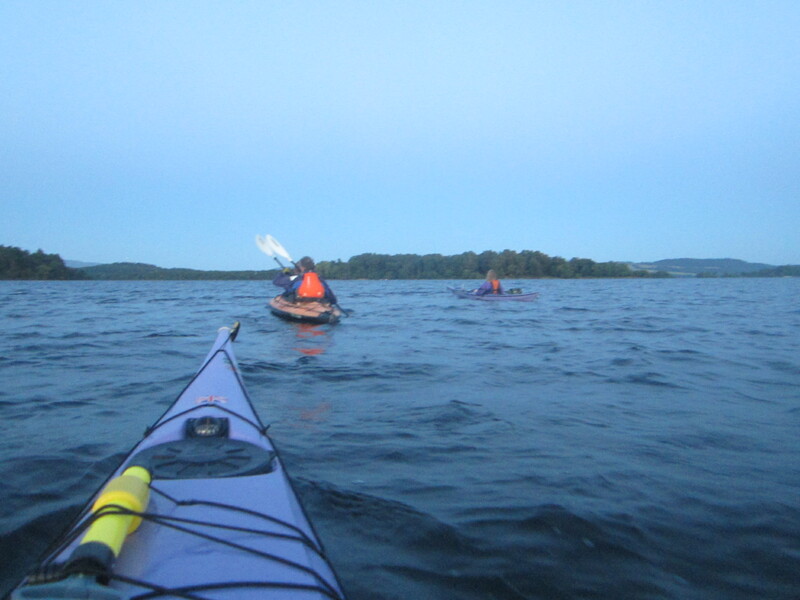 The tactic used was simply to keep paddling and try (desperately at times) to hold the line. Normally on a run in you caught a big one and hurtled towards the beach as long as you could hold it with your selection of stern rudders , low brace supports/turns and high brace supports. 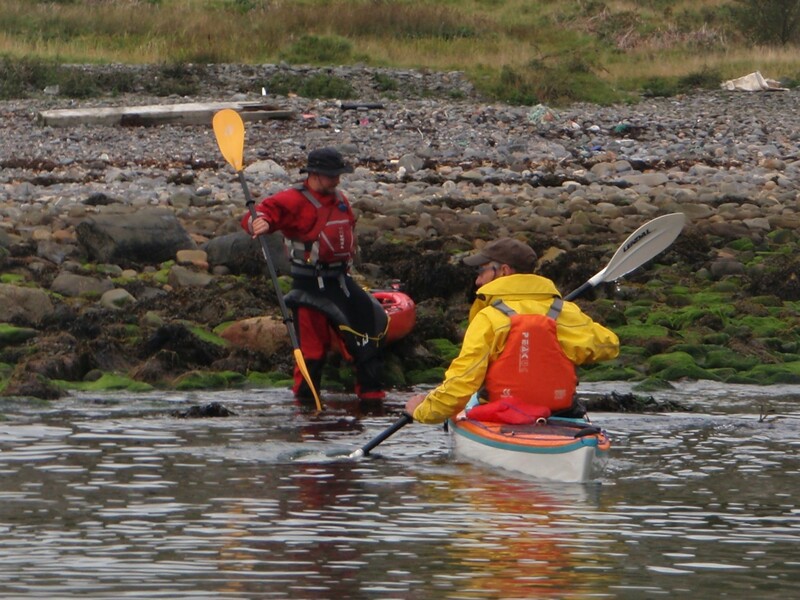 Both Gordon and Geoff experienced very wet (upside down) exits and rather slow swims back to the shore. 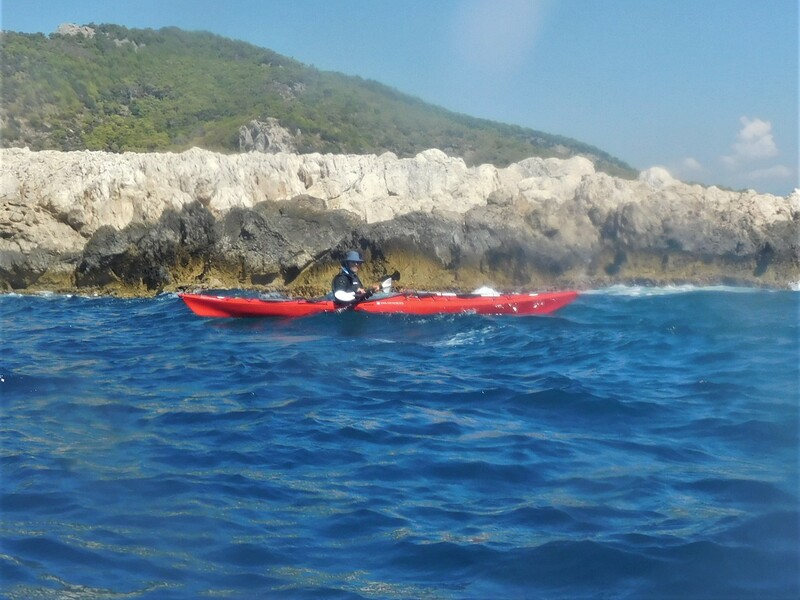 Equally we all had great runs and the satisfaction of conquering a hostile and at times quite frightening environment. We had around 90 minutes for both morning and afternoon sessions, enough to get in around 16 runs each, more than enough. All in all a near perfect day. Weather: Max 17 deg C, light SW wind falling away to nothing in late afternoon, sporadic sunshine/overcast. 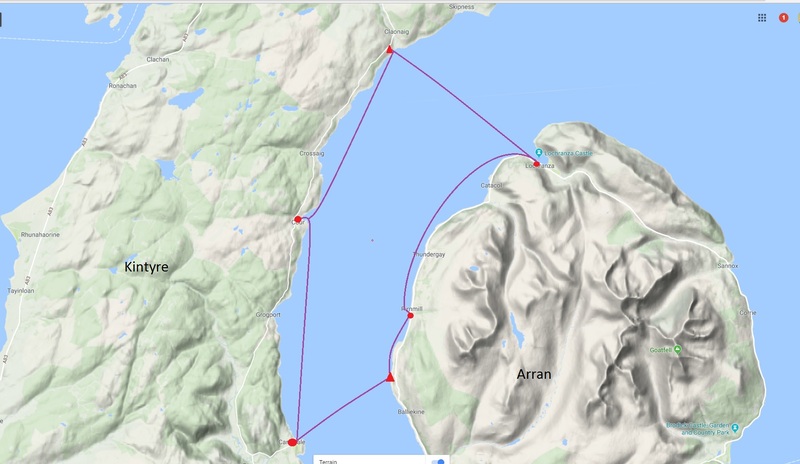 The plan initially included an overnight stop on the W side of the Corryvreckan at Bagh Gleann nam Muc (Bay of Pigs) but as departure approached, the forecast weather for the second day carried too high a risk of not getting back out in the morning. 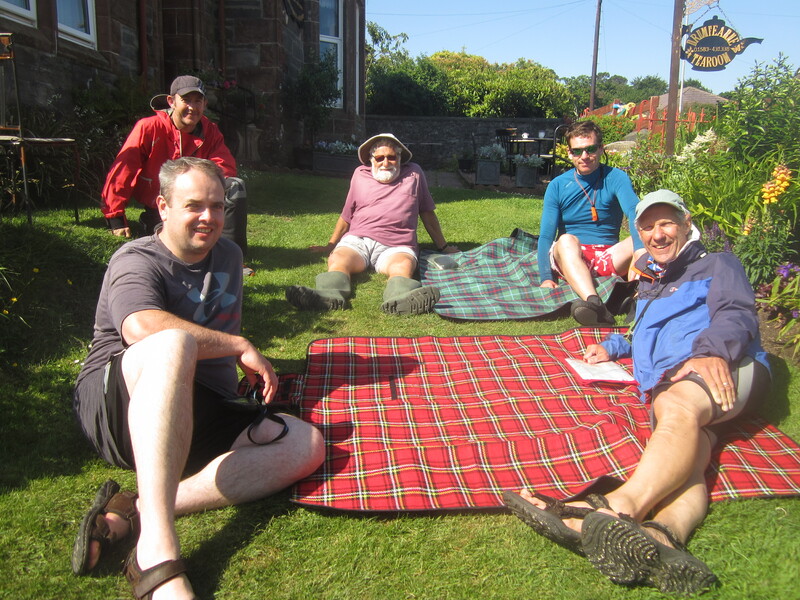 And so a long day was planned for Saturday such that only a short run-in was required on Sunday. 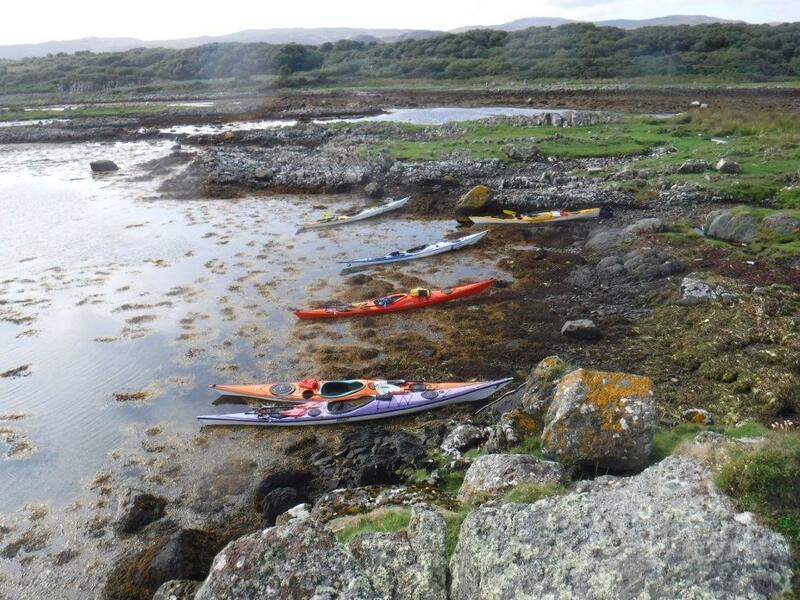 On arrival at Easdale there were several cars in the car park with empty kayak racks and three lady kayakers about to depart for the Grey Dog via the islands to the W of Lunga and Rubha Fiola. Transpired the youngest was an instructor at the centre on Lunga and so well experienced in the area. 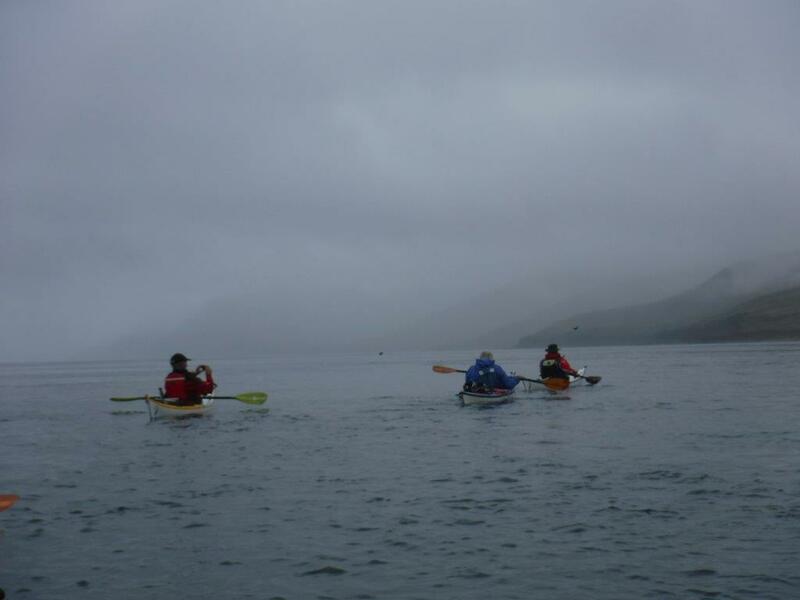 The sea mist had been giving us second thoughts but seeing the ladies depart we felt rather sheepish to have done so. Departing some 40 minutes late due to deliberating, we headed out to Belnahua even though at that point we could not see it. 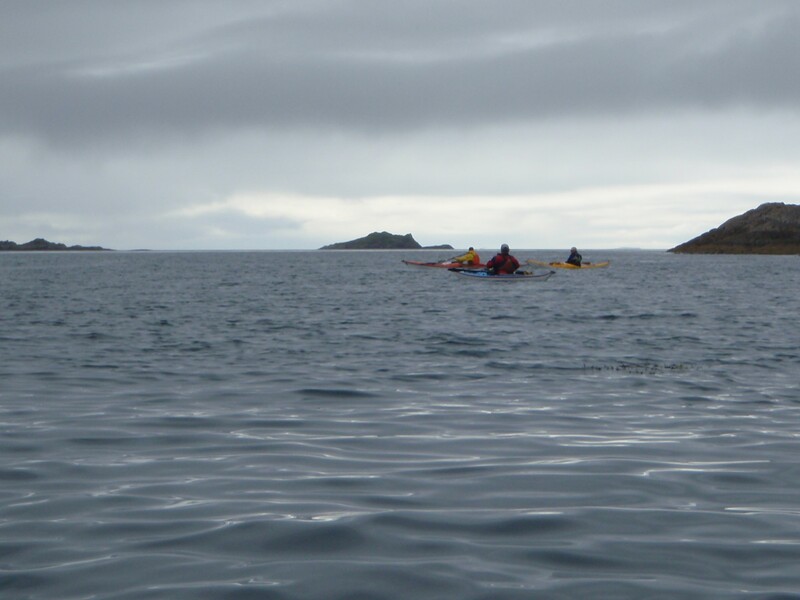 A quick stop of 10 minutes then down the Sound of Luing with the flow to the Grey Dog. 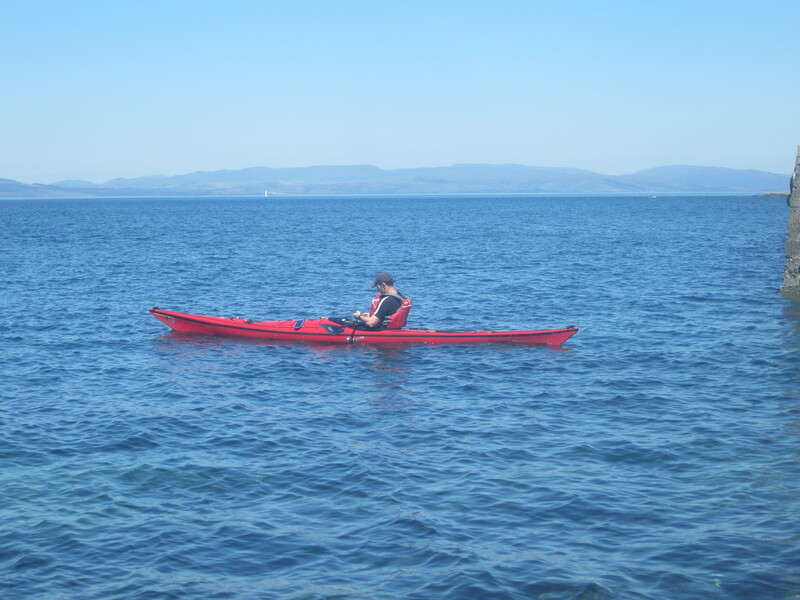 On the way in an otter surfaced close to one of the kayaks but did not seem to be disturbed. At the Grey Dog the 6.5 knot (as low as it gets) current was tamed by Gordon and the two Steves who managed get up the S side and rattle down the N side. 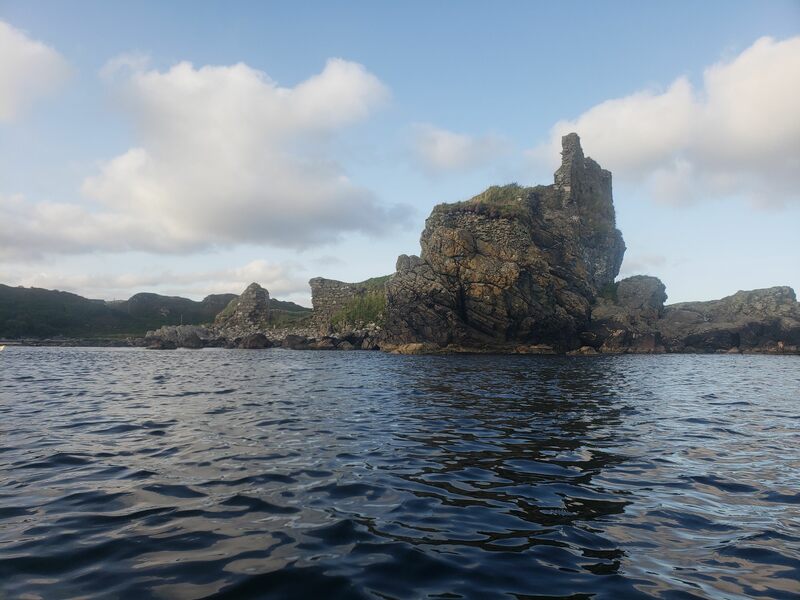 Our time contingency had been used before we got started and so we pressed on round Scarba to the place that strikes fear into most amateur mariners, the Corryvreckan. 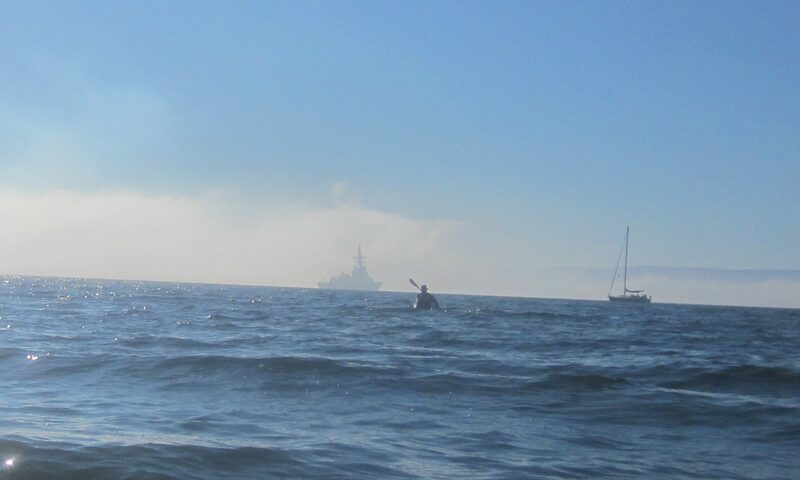 It is no faster than the Grey Dog (8.5 knots max.) but the overfalls generated by an underwater ridge on the flood are positively dangerous to small craft and must be avoided. Where eagles dare indeed, we had seen two of them. 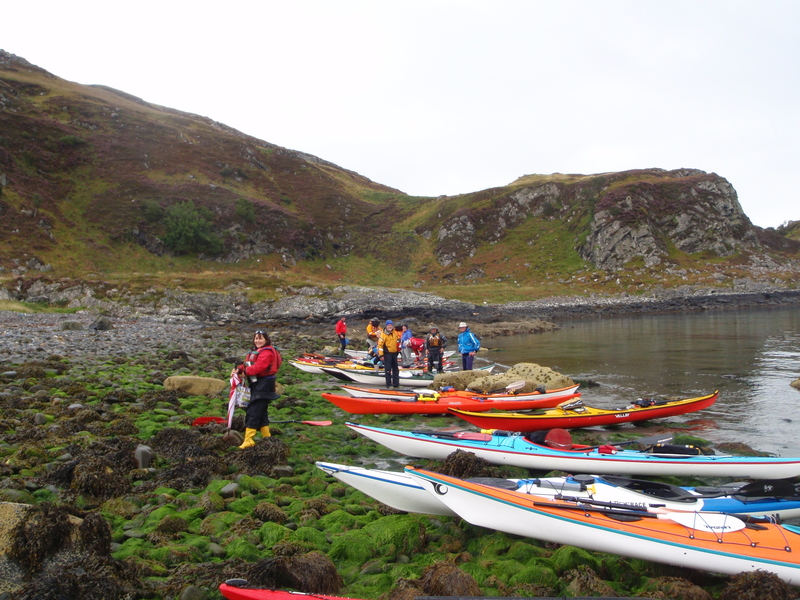 On arrival at Bagh Gleann a Mhaoil some 40 minutes after target we could see no movement of the water but a group of paddlers could be seen hugging the shore apparently having just come through the gulf from the W. Pushing on to Rubha Righinn it was obviously slack water but crossing the gulf from here and getting back would take 25-30 minutes. The total time of slack was estimated to be about 50 mins but we could not accurately determine when the slack started (it was originally intended to watch it) and so the double crossing was reluctantly abandoned and we headed back to the safety of the SE bay for lunch and a look at the bothy. 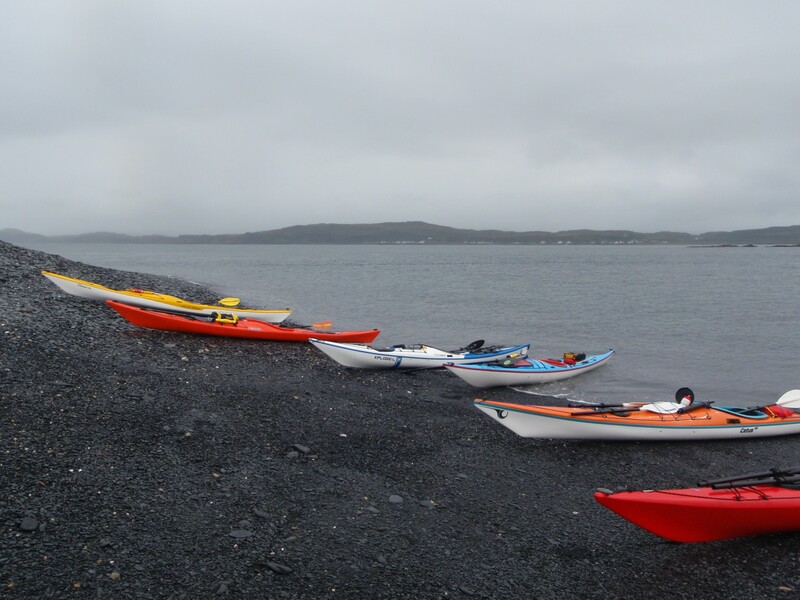 On arrival there no less than 12 kayaks were on the shore and two of the owners sitting on a log in the light drizzle. The group of some 4 ladies and 8 men were simply a group of friends (some ex SCA Touring Committee) including our own member Grant Montgomery. 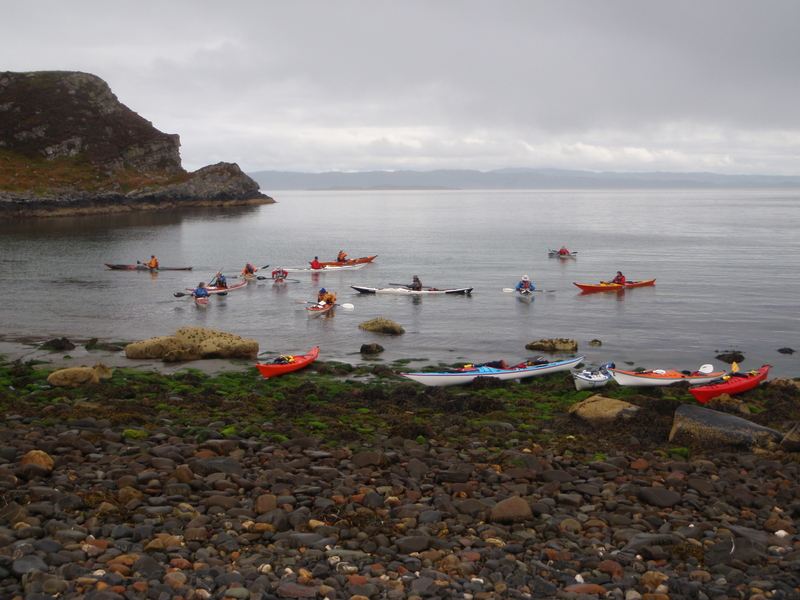 They had left Easdale at 0930 and entered the W end of the gulf on the last of the ebb. 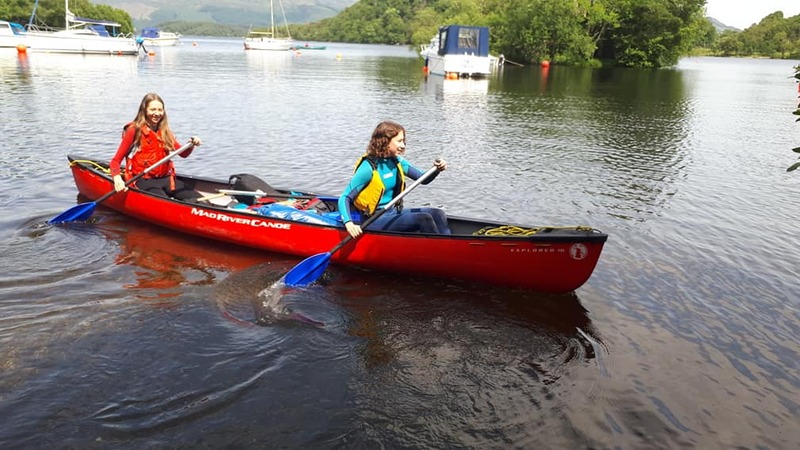 This was a brave decision because there are only 3 places to get out safely over a distance of 5k and that distance will take the full period of slack water. 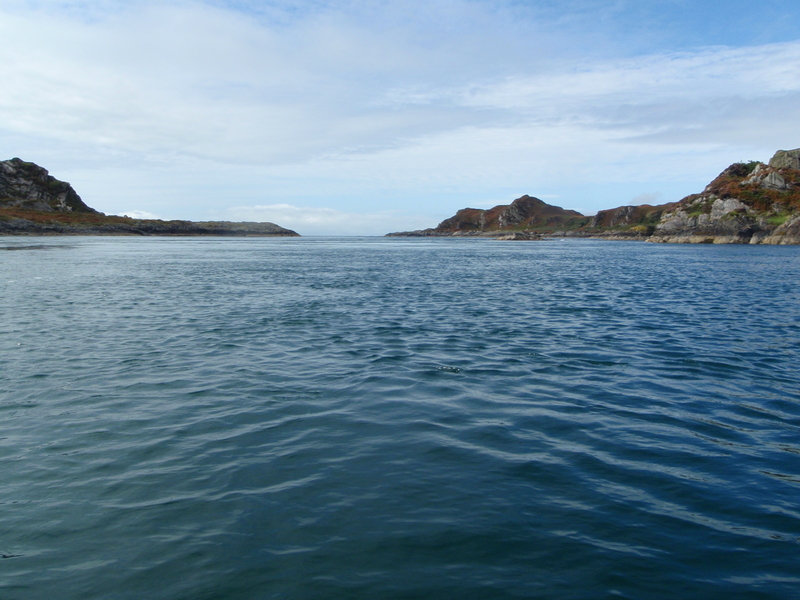 They had had to tolerate some turbulence at the SW point on Scarba to get the benefit of the flow. They too had reservations about the forecast for Sunday and like us were heading over to camp on Luing. 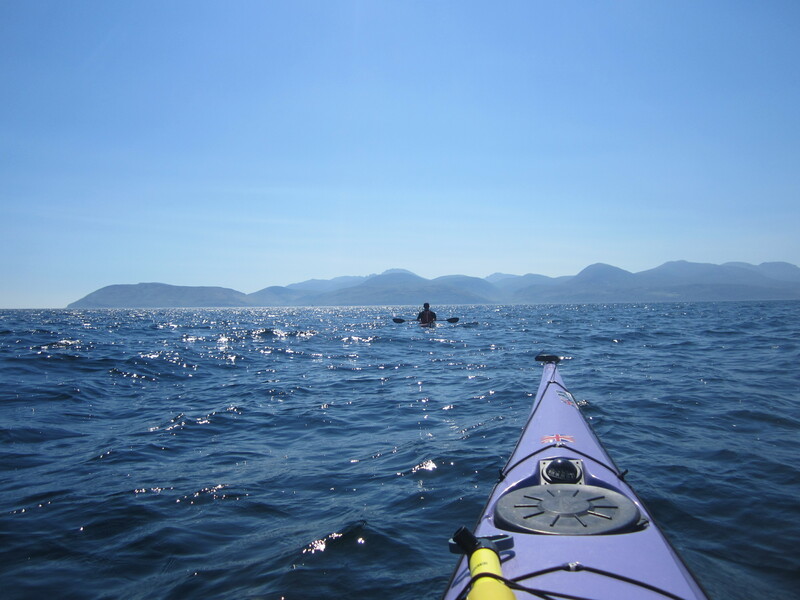 After a leisurely lunch and a look round the bothy, which has seen better days but in a storm in that area could be the height of luxury, we headed back up the Sound of Luing on the N going tide with the intention of putting in at Cullipool. 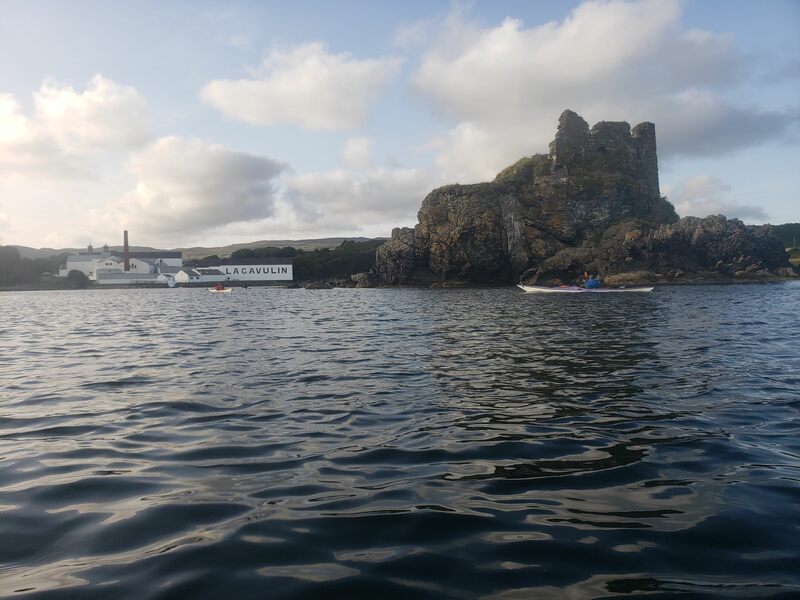 However when we got there it was decided by the majority to head back to Easdale and stop off in Oban for something to eat on the way home. 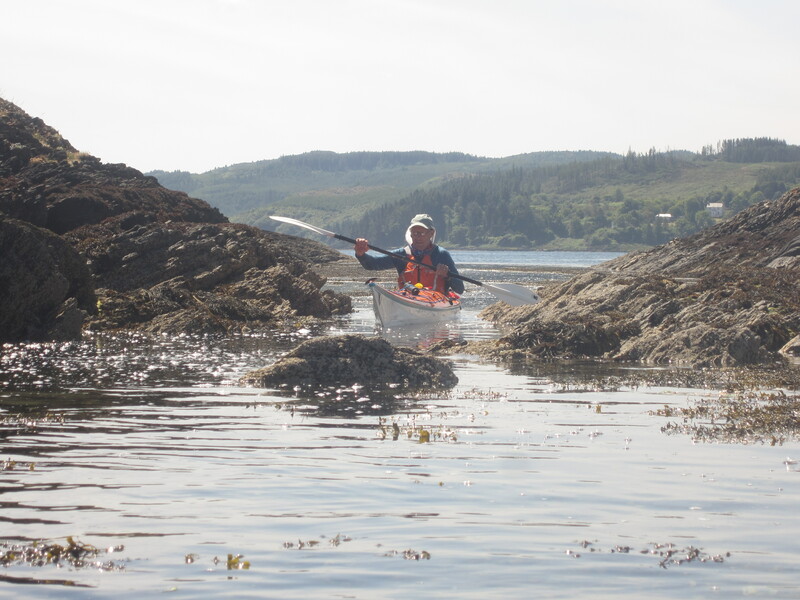 A fair paddle which, with the help of tidal streams, covered an estimated 33k (17.8 Nm). A quick chippy meal in Oban and back in Helensburgh before midnight with all having had an enjoyable day. Post Expedition Note Re Tides. As we all know tidal streams can often differ from prediction due to wind, barometric pressure and even weather some distance from the location therefore the best way to get accuracy is to eyeball it. 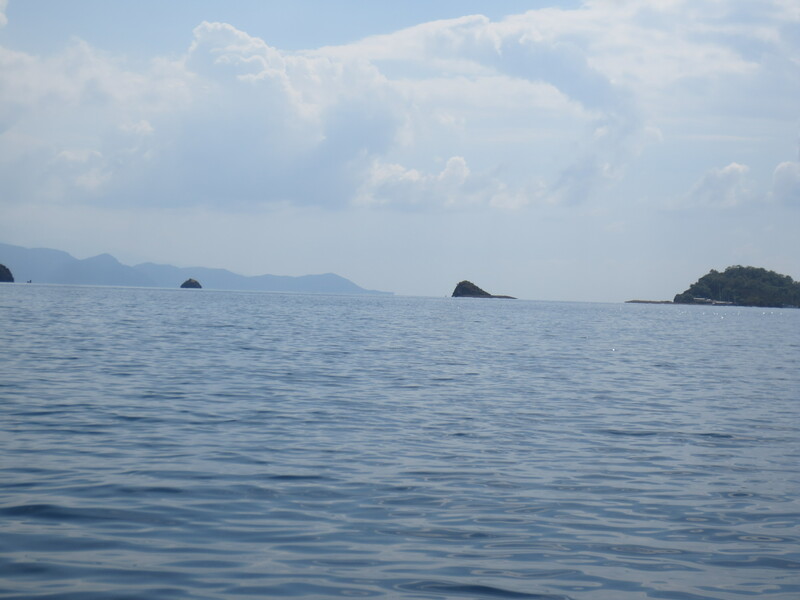 We could not on the day due to the gulf being slack on arrival. On the day the most accurate proved to be CCC Pilot since we were still sitting in the gulf with no apparent movement close to 1500 but could not risk a further 25 minutes for a double crossing with the W going flood imminent. 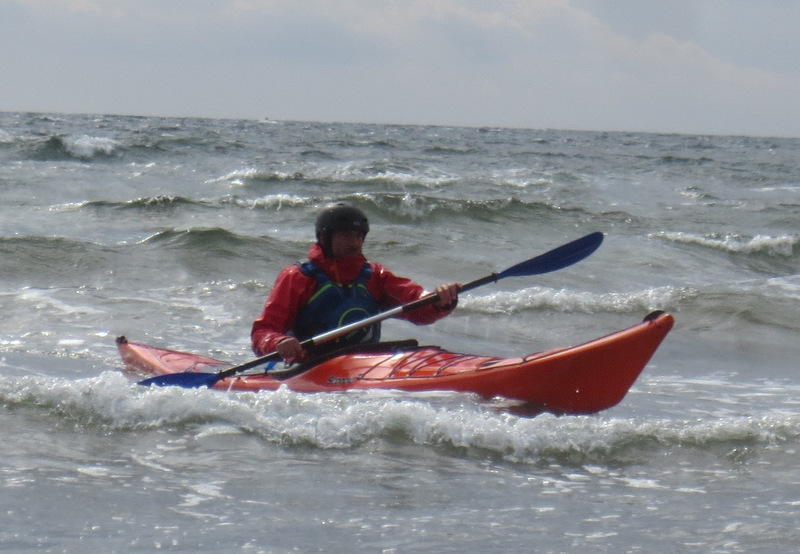 The 12 kayak group entry to the W end of the gulf was estimated at 1355 and they confirmed tide was still running E on entry. So again CCC Pilot seems most accurate. 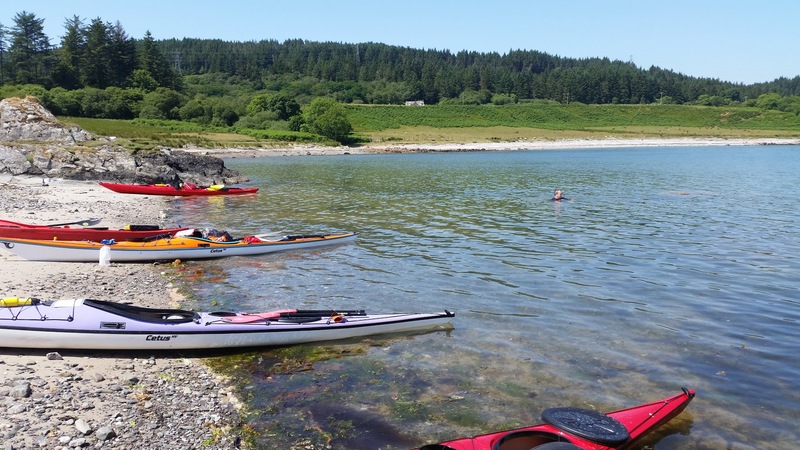 A word of caution; Reeds gives slack water times while the CCC Pilot gives the start time of flow after slack water for both neaps and springs. 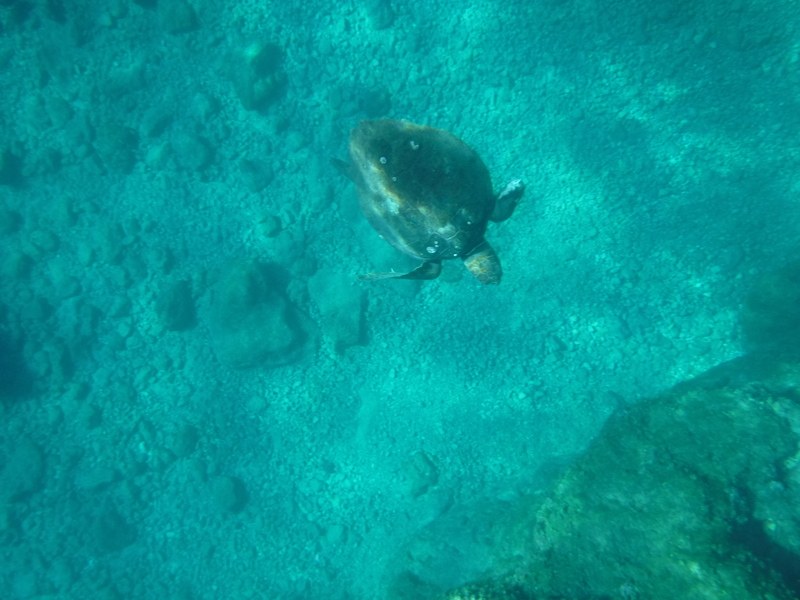 The Tidal Stream Atlas has to have half the slack water time subtracted from and added to the calculated time of change. 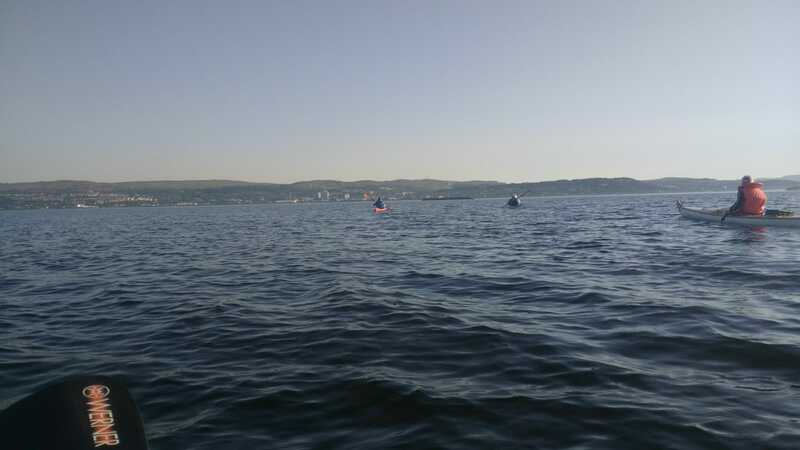 There are other sources of tidal stream information available for divers and kayakers but it is questionable whether they have greater accuracy. Weather: Grey windy and wet getting better over the weekend. 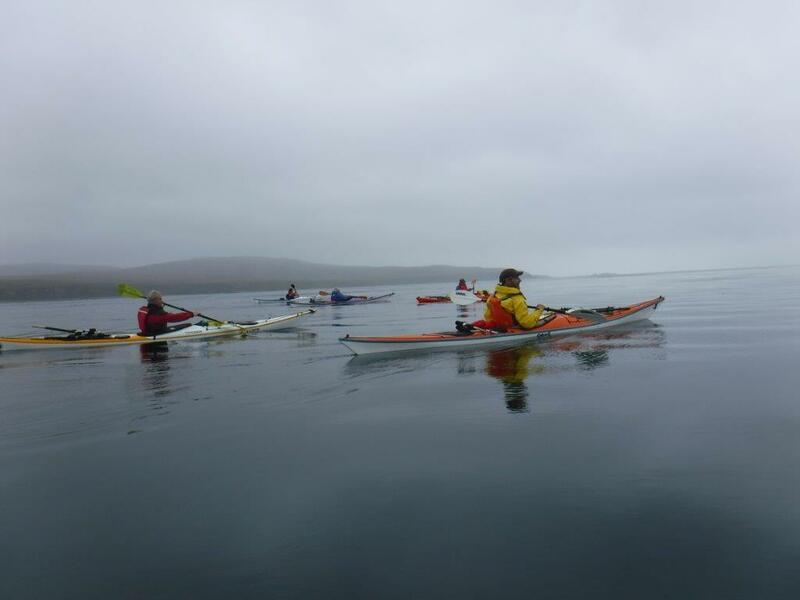 Low cloud and drizzle accompanied us throughout the day but thankfully the wind was relatively light. 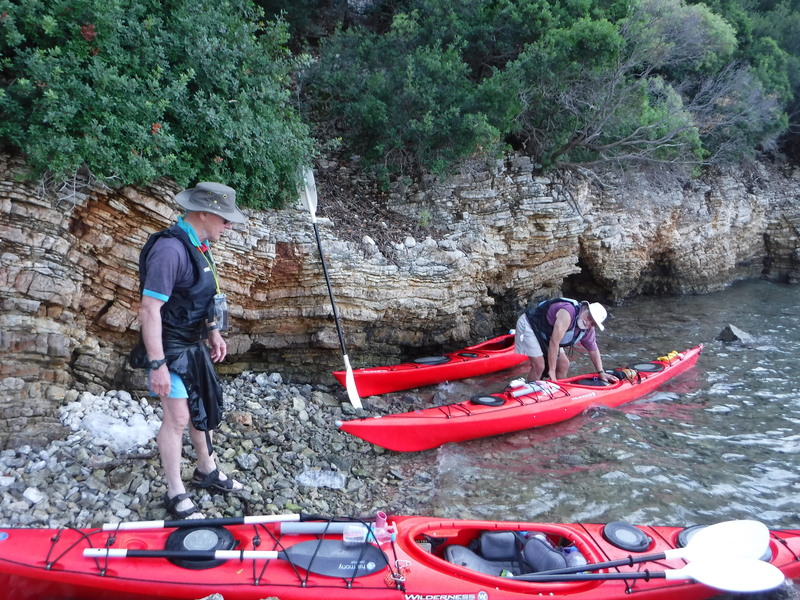 We made use of the steep slip into the old harbour and were able to get away shortly after the tide turned. 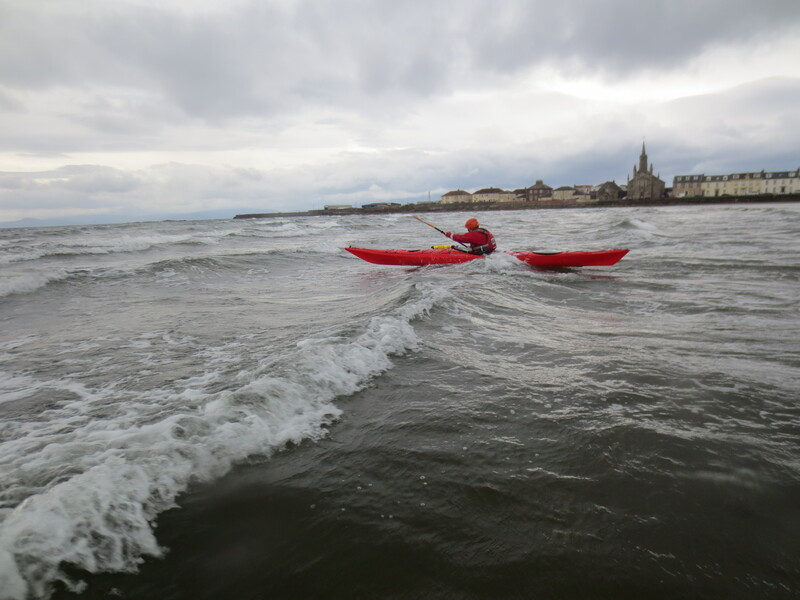 It was important to catch the tide as it runs at at up to 5 knots. Thus we were carried quickly down the sound to our first stop, the rather pleasant MBA Bothy at An Claddach. 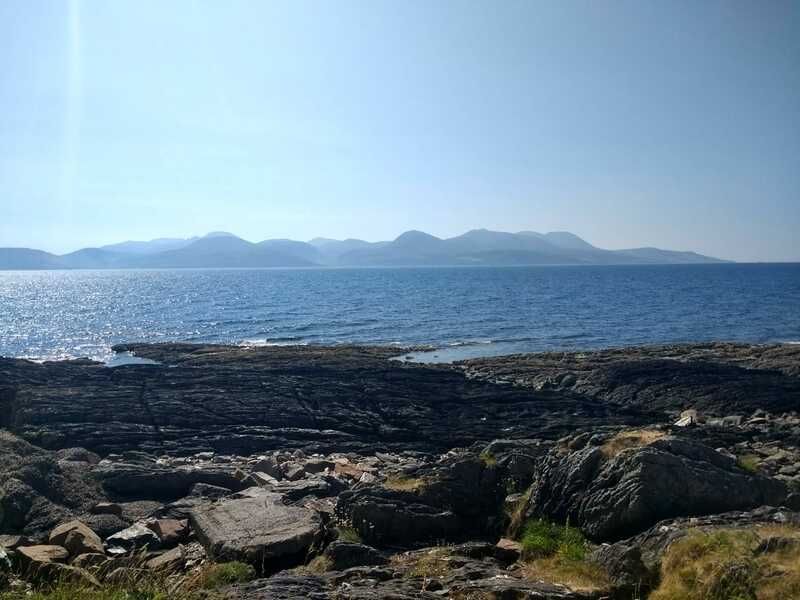 From the Bothy we headed across the Sound to Jura and, at the behest of Hugh, headed for a “Chambered Cairn” marked on the map. 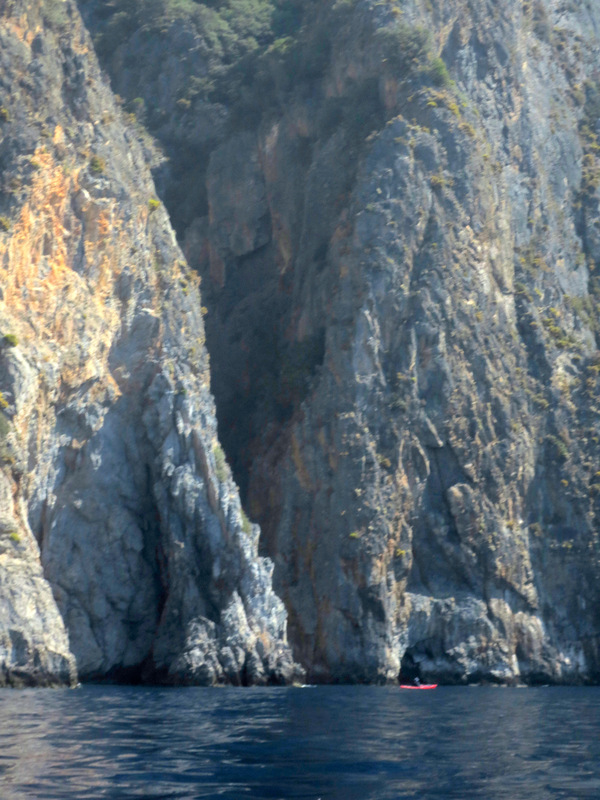 The rock formations along the coast were spectacular with gashes, towers, twisted rocks etc. 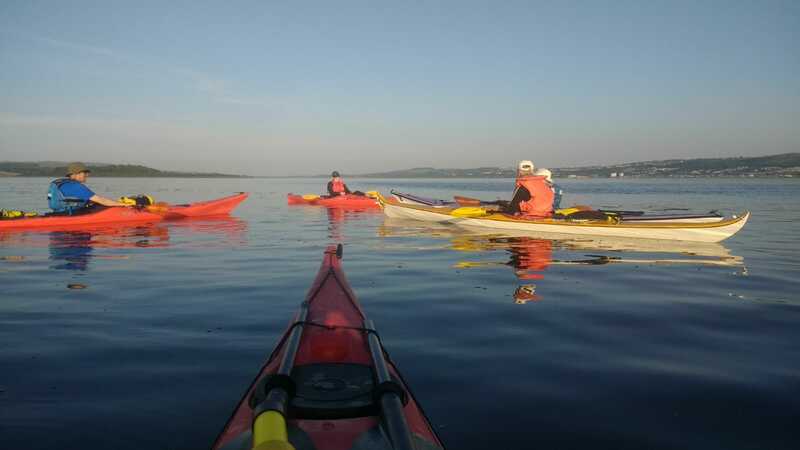 At one point we were joined by a female kayaker from a small group of houses who was anxious to share her love for the area. 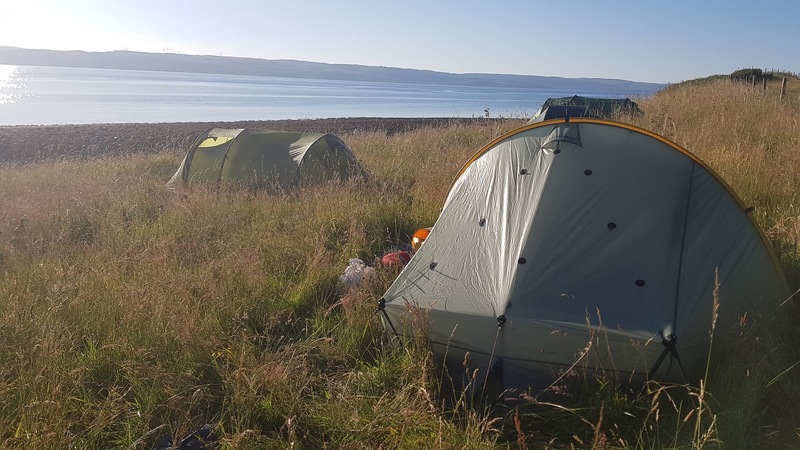 We had agreed that, with rain continuously threatening we would stay at the excellent campsite at Craighouse, used previously on one of our trips. 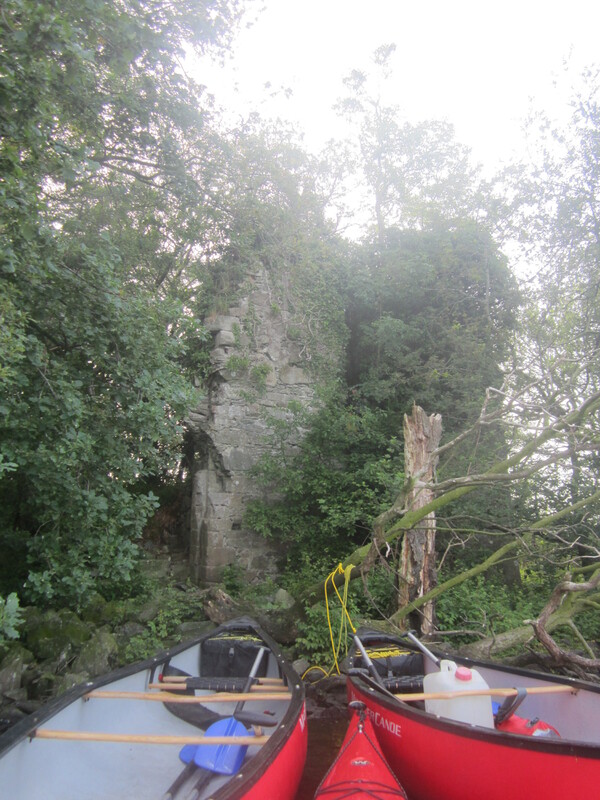 We arrived at about 19:00 and pitched, which was not a pleasure with the light rain mixed with clouds of midges. 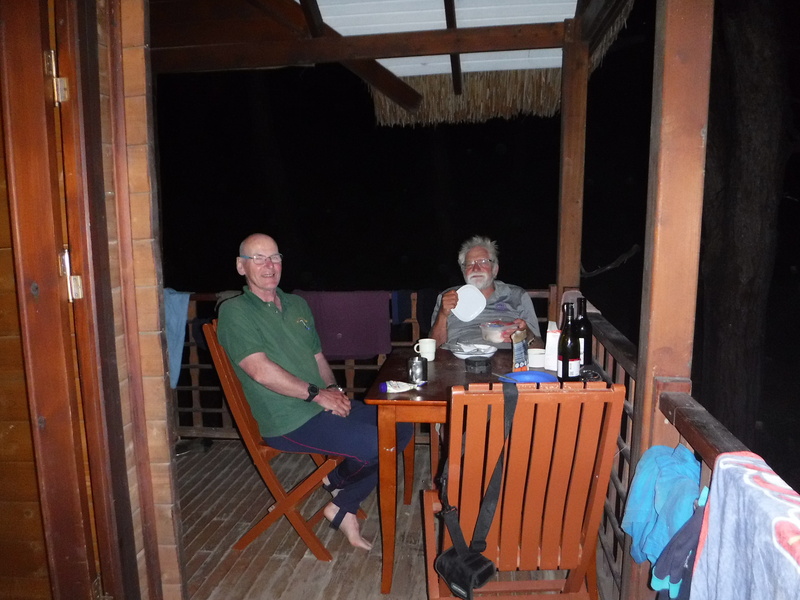 However the adjacent hotel provided good food, beer and shelter and a convivial evening. Sunday was drier, brighter but windier. From Craighouse we retraced our route and then had to make a decision on whether to go back up the Sound for a shorter but less windy crossing or take the direct route. We chose the latter and for the next 80 minutes were pummeled by a strong northerly wind hurling down the Sound. As usual photographs do not convey the instability and tension induced by rough weather. Who takes his hand off the paddles in those circumstances? 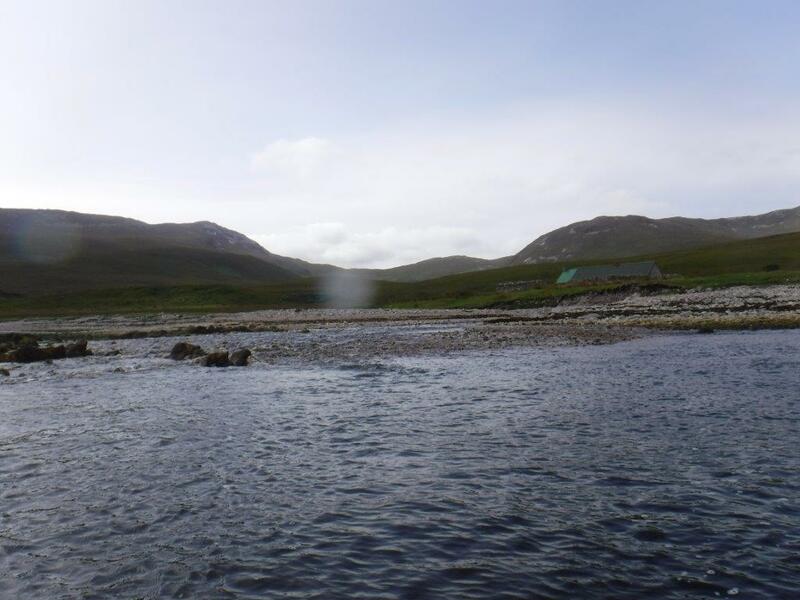 Eventually we landed by Proaig bothy (not MBA) for lunch and readings from the amusing Bothy Books. 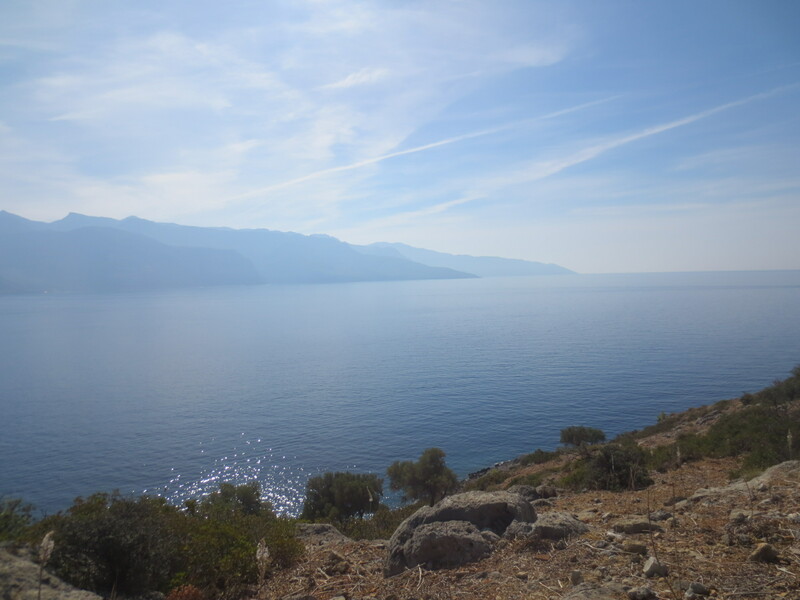 The weather had been steadily improving with wind dropping and a hazy sunshine. 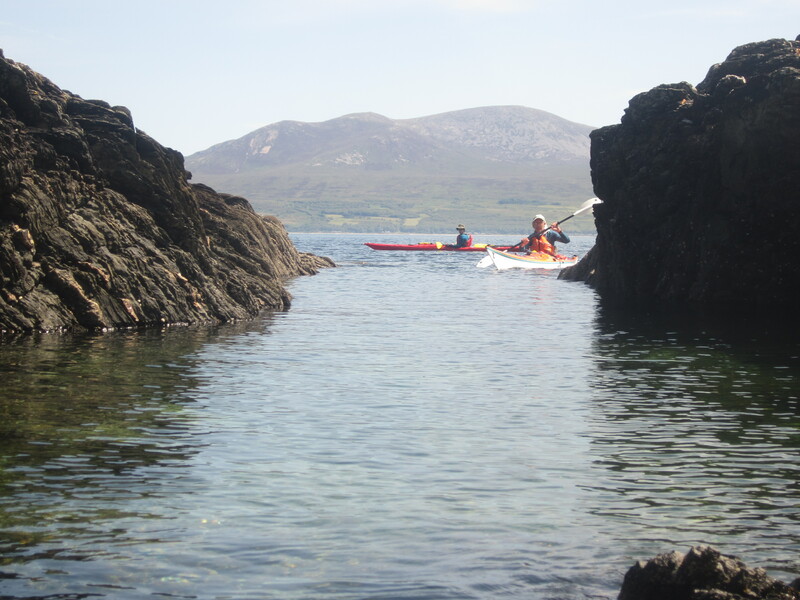 The next section of the paddle was sea kayaking at its best; remote, rocky and fragmented coastal scenery backed by high hills coupled with lively conversation between the paddlers. 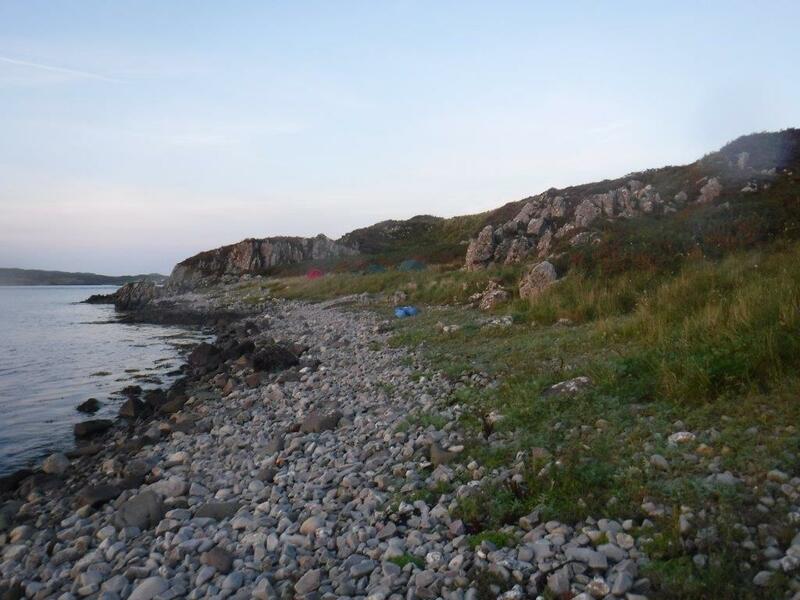 Rock Hopping close to the shore also provides both amusement and shelter provided you do not hit any. 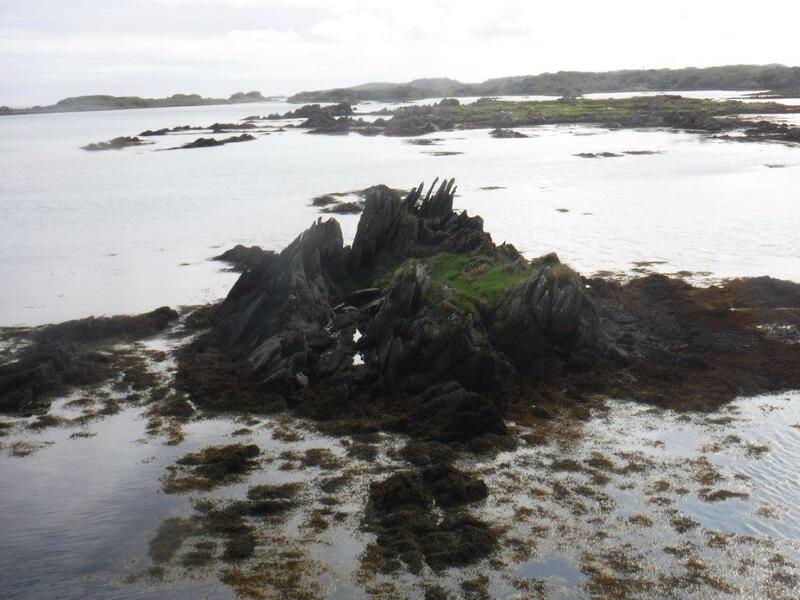 In our quest to keep inshore we cut inside a pair of islands (Eilean Mhic Mhaoinoire). 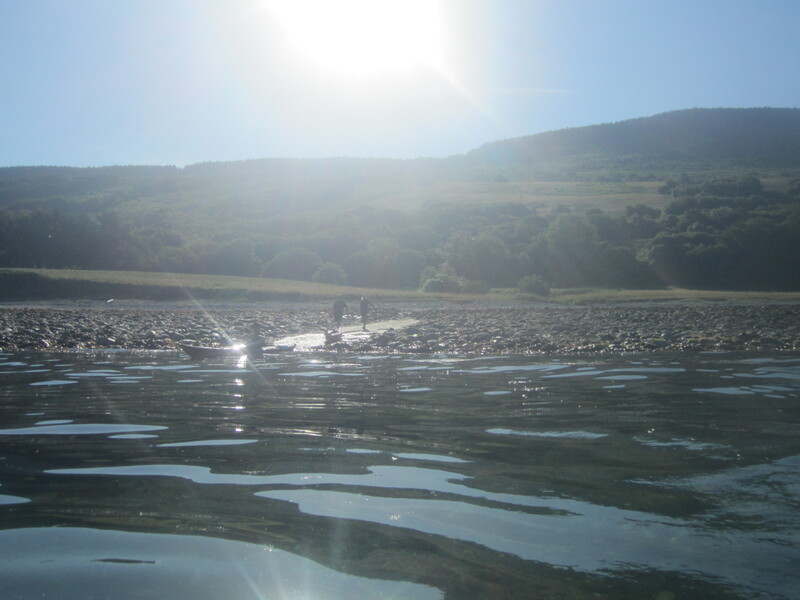 As is shown on the map the channel does not dry out but, unknown to us, does get so shallow we were forced to wade for a few hundred metres. 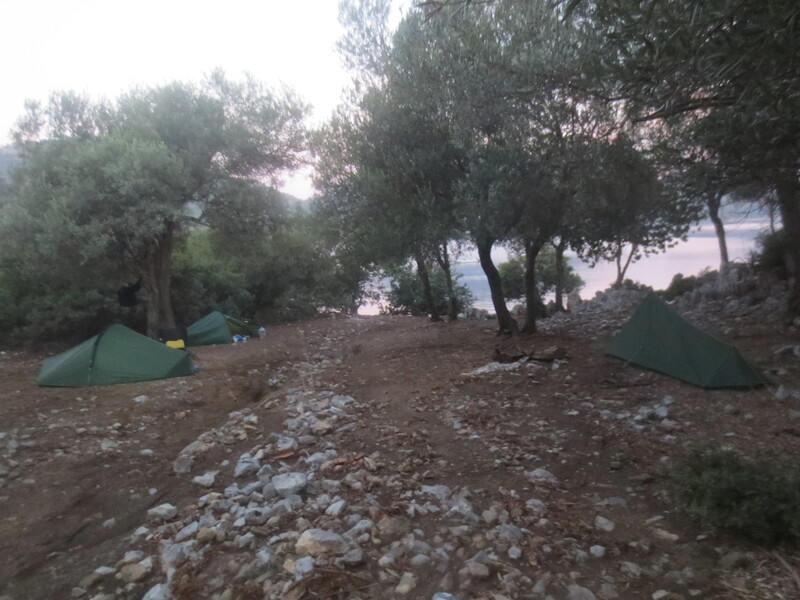 The next task was to find a camp site. 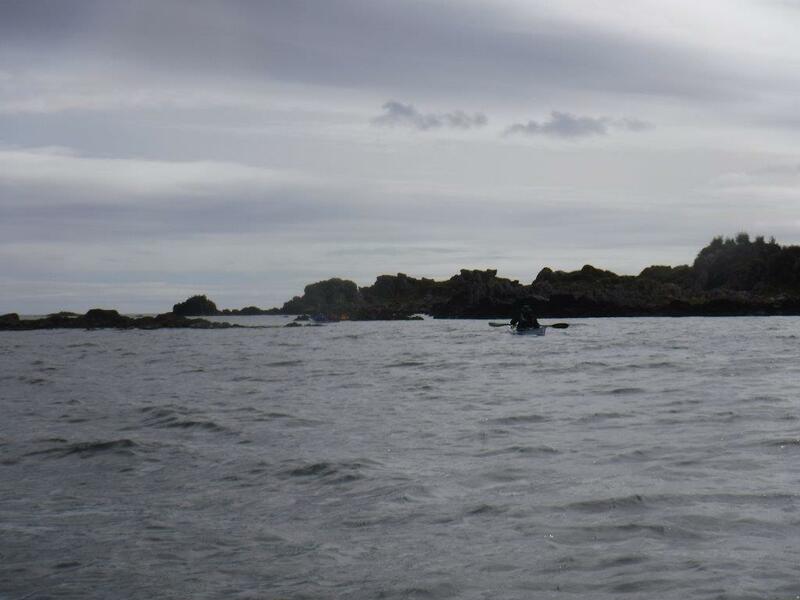 To minimise the paddle on the Monday and ensure we caught the ferry we decided to head on past Ardbeg to Lagavulin and camp there. 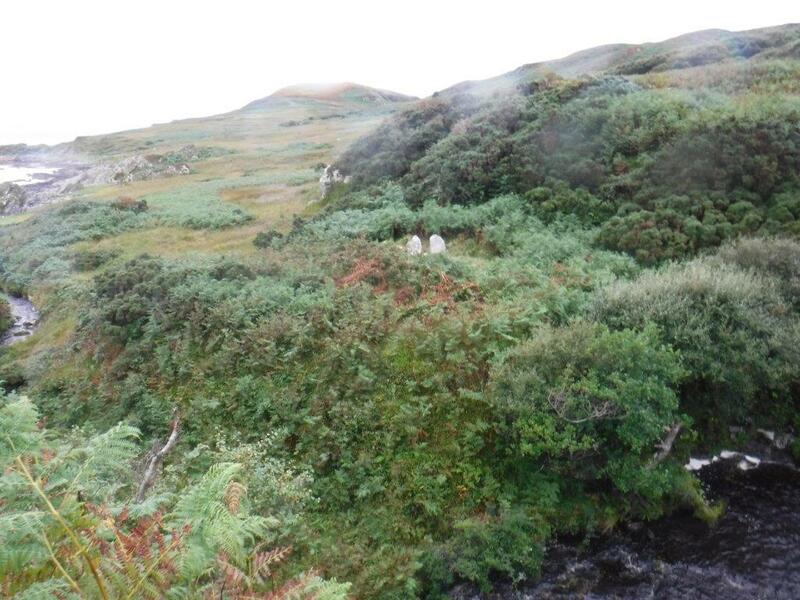 Dunyvaig is a spectacular ruin that is, unfortunately, inaccessible for safety reasons. https://en.wikipedia.org/wiki/Dunyvaig_Castle gives the history. Unfortunately there are no good camping sites there so we headed on to the island of Texa where we were greeted by a large herd of goats. The Camp site on Texa was very rough and there appeared to be no wood. 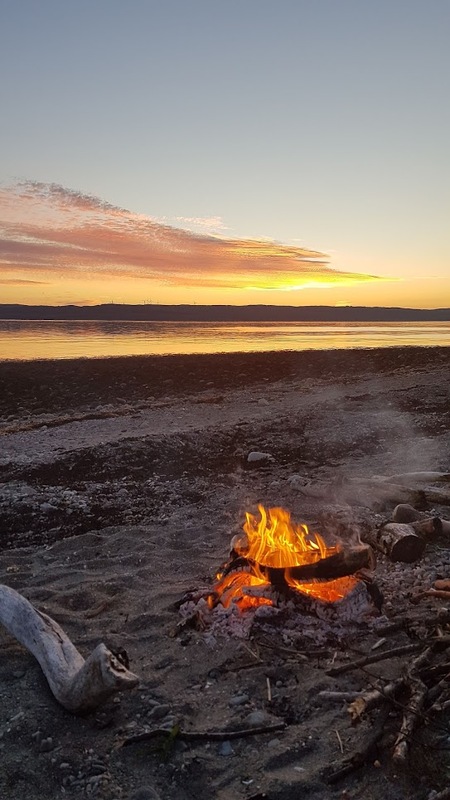 However we managed to find enough to have an excellent fire and with fine dry weather and few midges a good evening was had by all. Monday dawned dry, bright and almost windless. 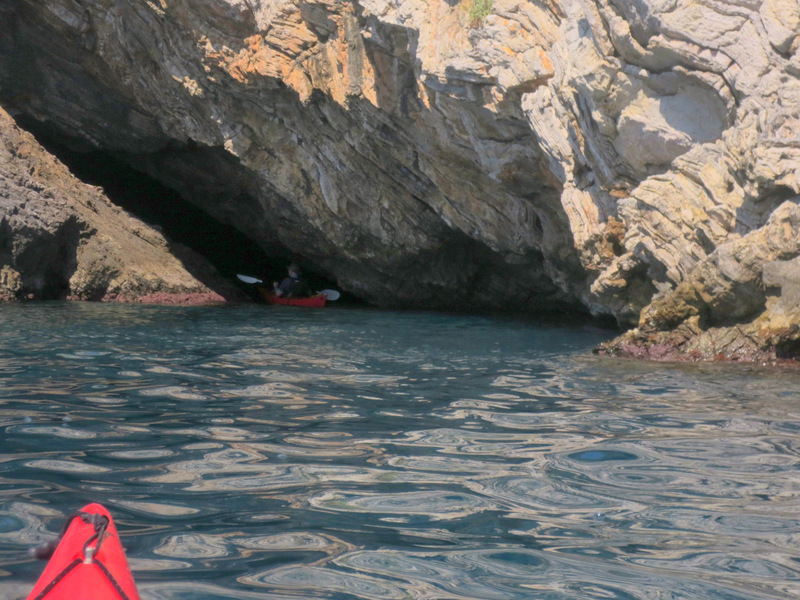 With more than enough time we decided to explore the island and, in particular the two caves marked on the OS Map. 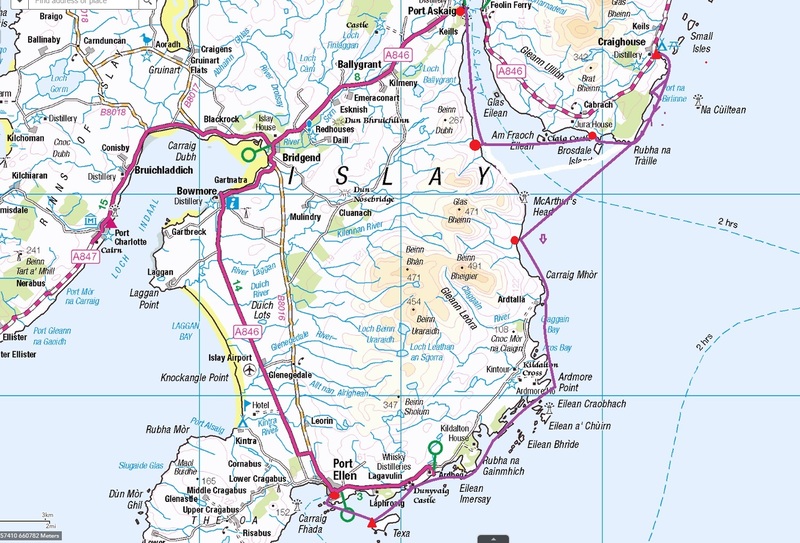 The island is not very interesting (see https://www.islay.blog/article.php/islay-texa-island ) for further information and we were unable to find the caves. Que Sera. 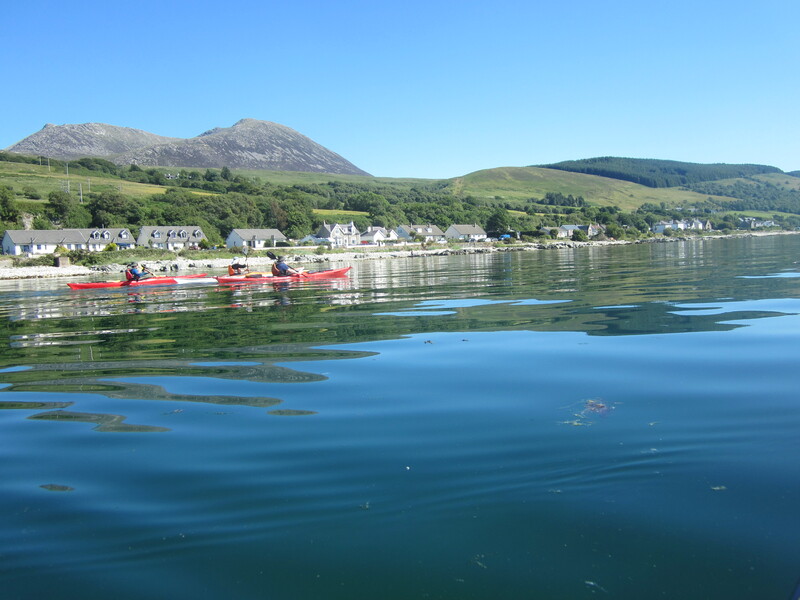 The paddle into Port Ellen was once again, beautiful and Port Ellen is now a very attractive village with a couple of excellent sand beaches. Camping looks quite possible. 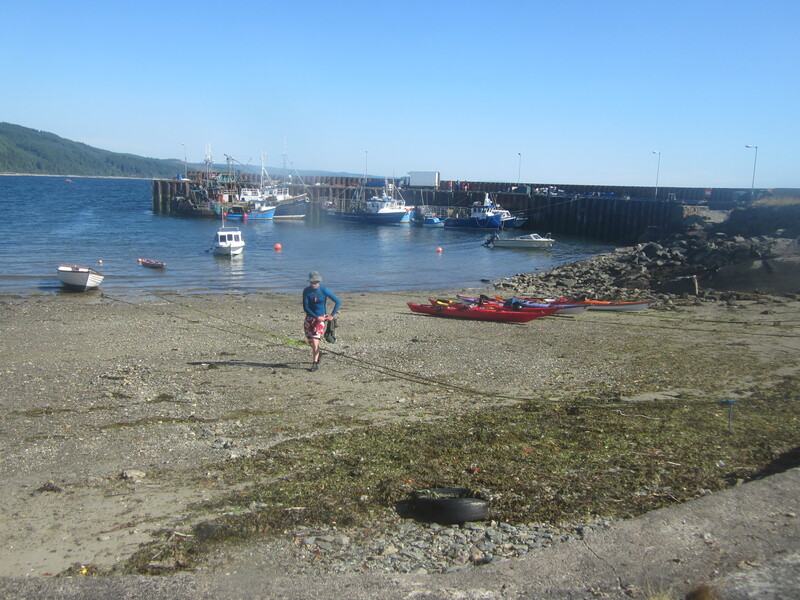 There is a good slipway to the east of the ferry berth where we landed, changed clothes and loaded the kayaks on the trolleys. We caught the 12:45 boat and had Cal-Mac’s excellent Fish and Chips for lunch. Unpacking the kayaks and loading the cars took over half an hour and we eventually left Kennacraig at 15:30, arriving back in Helensburgh at 18:00. 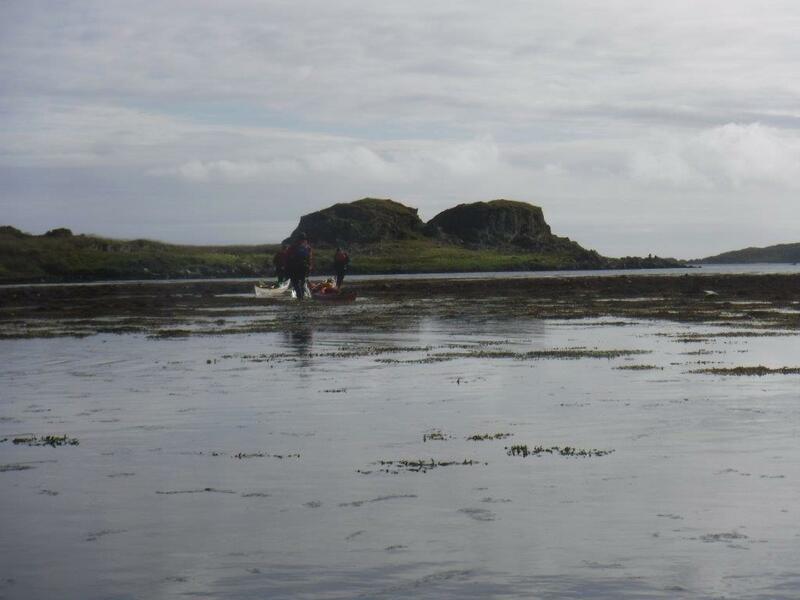 Wildlife included 2 separate sightings of Sea Eagles, 2 Otters (at Craighouse) and hundreds of seals, particularly on the rocks on the second day. I noticed, in this report, how often I had used the term excellent and this word really summarises the whole experience. 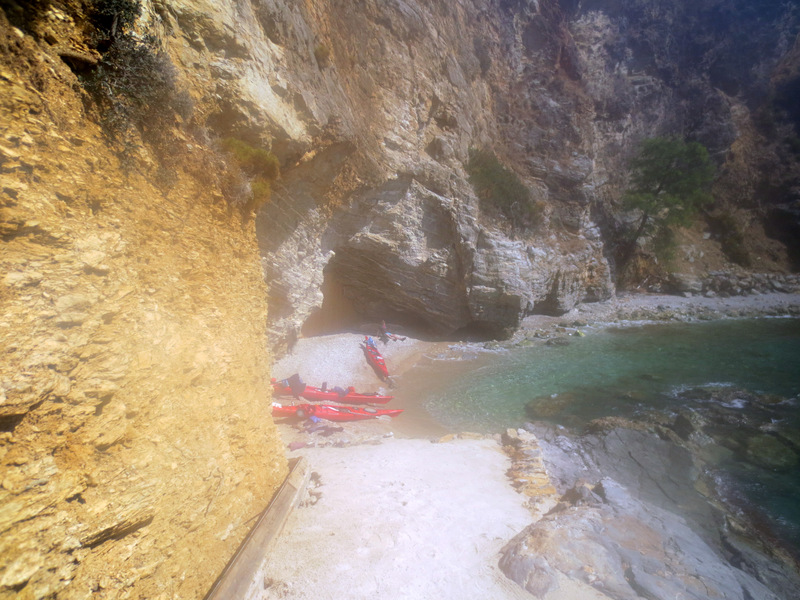 This was an excellent trip with wonderful companions in a relatively unknown and thoroughly recommended area. 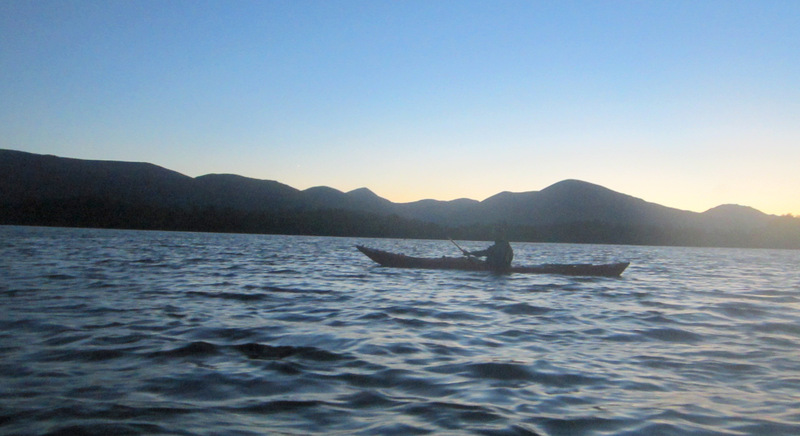 Report: We met at 10pm at Luss car park with some new and some rare faces. with the expectation of dark at 10.30. In fact, despite the absence of a moon, there was enough light not to use torches/light until the unpacking, tying on stage at 01:30. 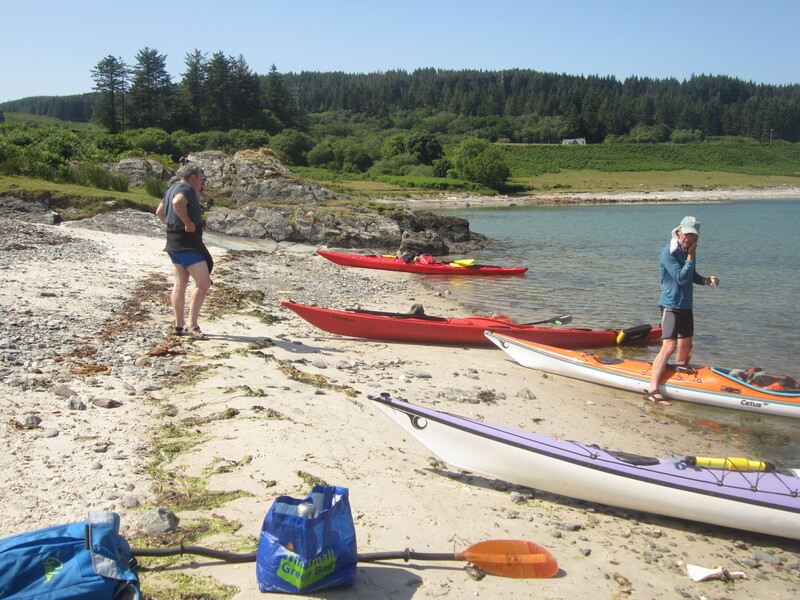 We were meant to call in at a beach on the south side of Inchmoan but the site was occupied so we pushed on to the long beach on the SW corner of Ichmoan. 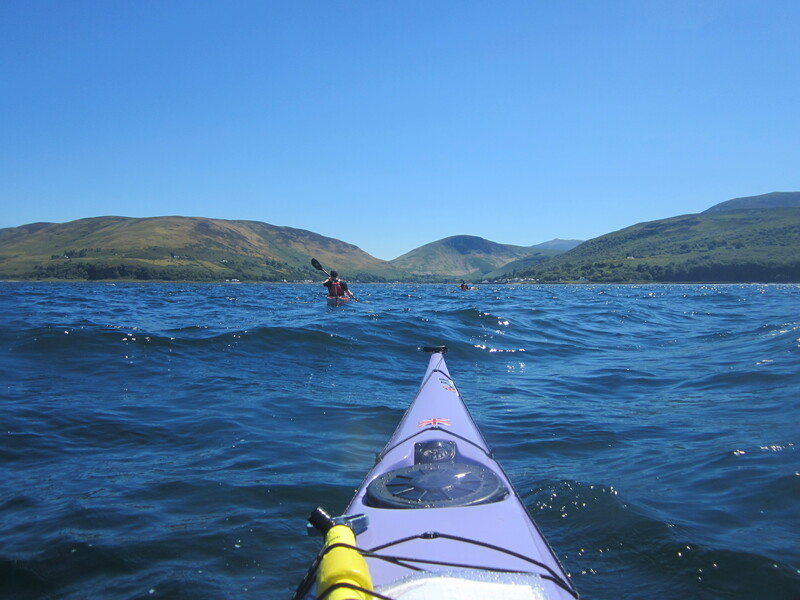 From there we paddled on through the Narrows and on to the mainland towards Luss and the cars.. Double click on any map or photo for full size. “Back” to return. 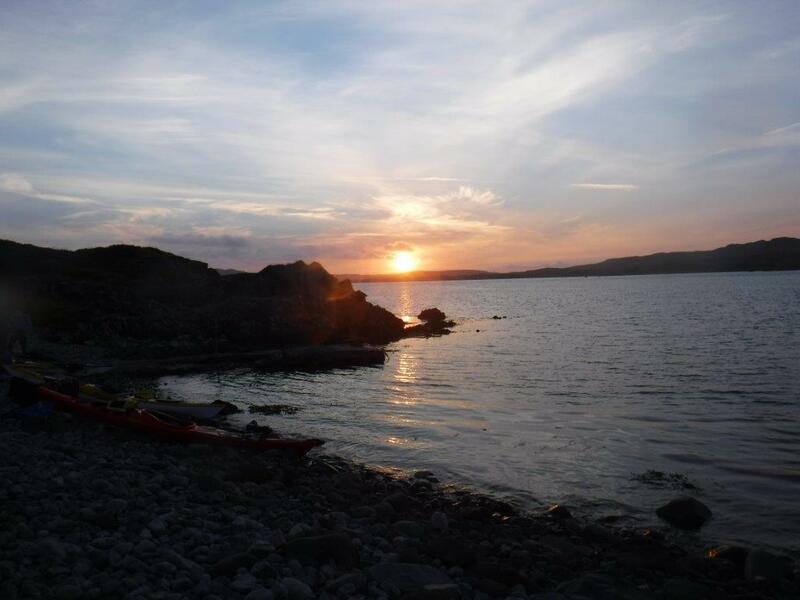 Saturday: Developed as a weekend alternative to the Outer Hebrides, the trip proved to be wonderfully successful. 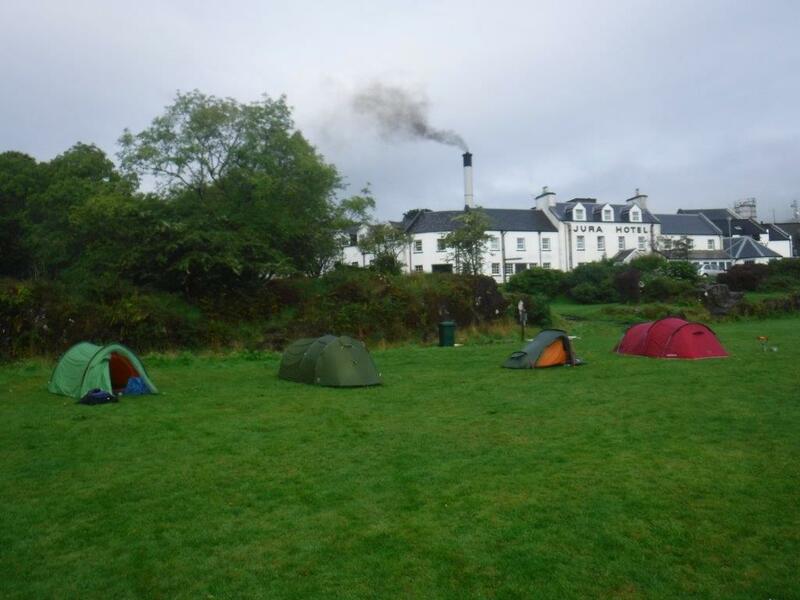 In part this was due to the fantastic weather and in part to the excellence of the scenery and the camp site. 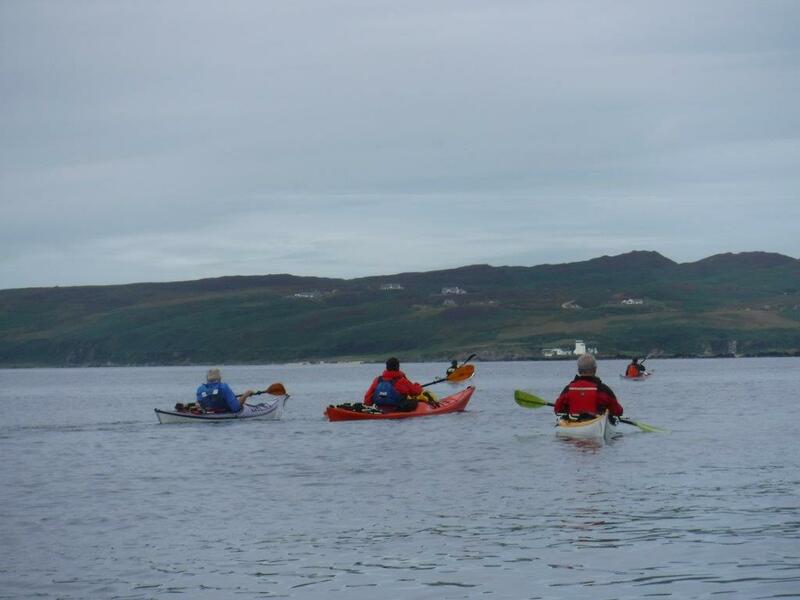 After meeting at 8am, stops at the Container and Finnart for boats and people we left the are at 8.45 arriving at about 10:45. 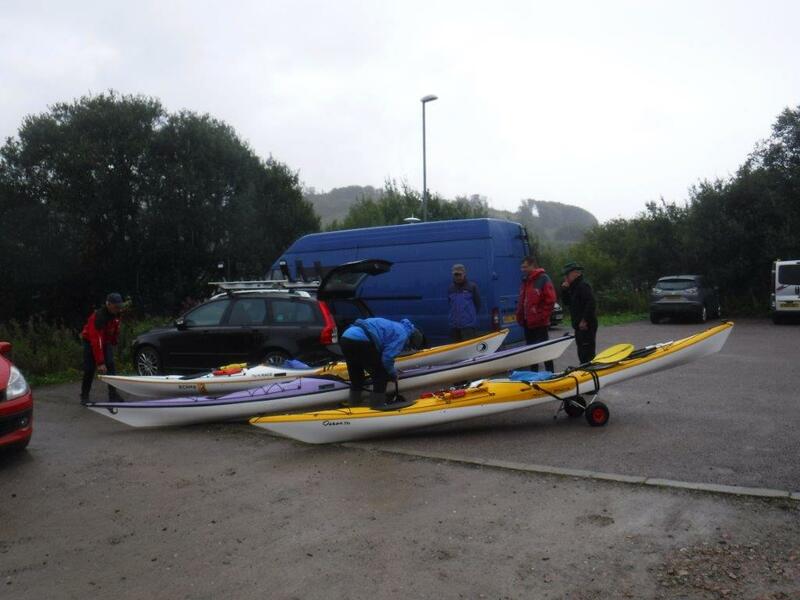 Unloading the cars and packing the boats added another 30 minutes so that we eventually got away by around 11.15 for the longest paddle of the trip, the crossing from Claonaig to Lochranza, a distance of 9km. 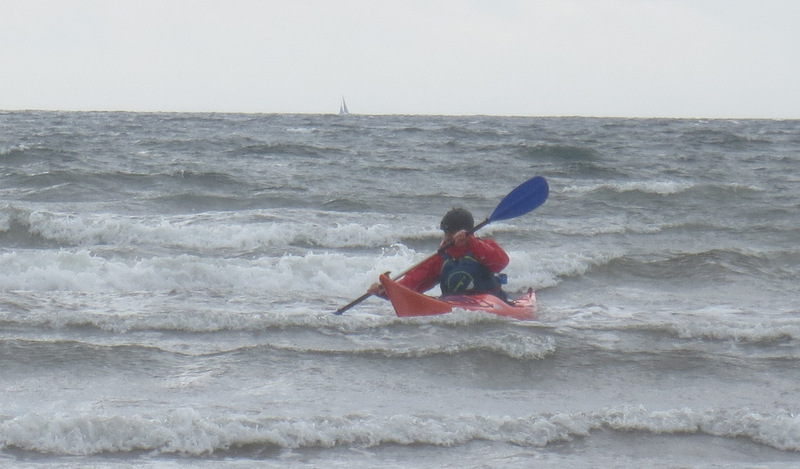 The sea was surprisingly bouncy but without any big swell and the 2 hours soon passed. 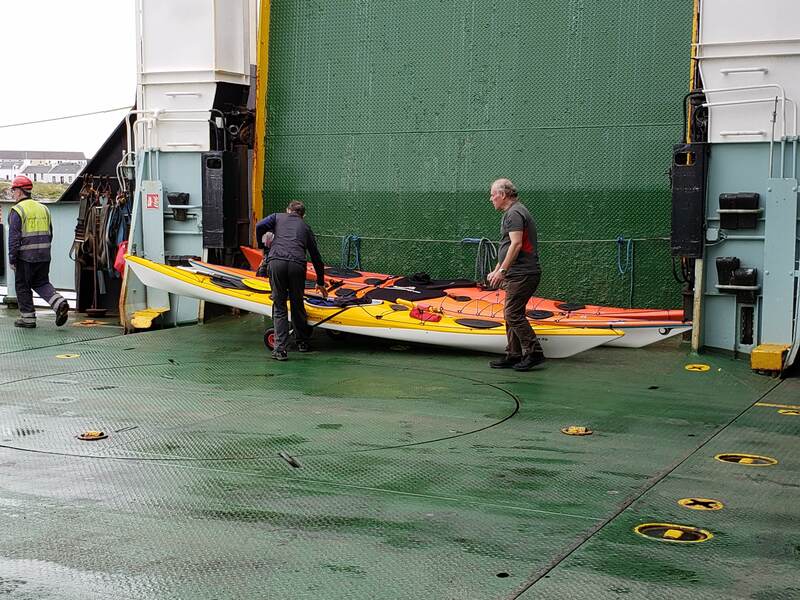 The only incident worth recording was the rafted stop to allow Colin to pump out his boat, which was gradually sinking because of a crack in the deck. 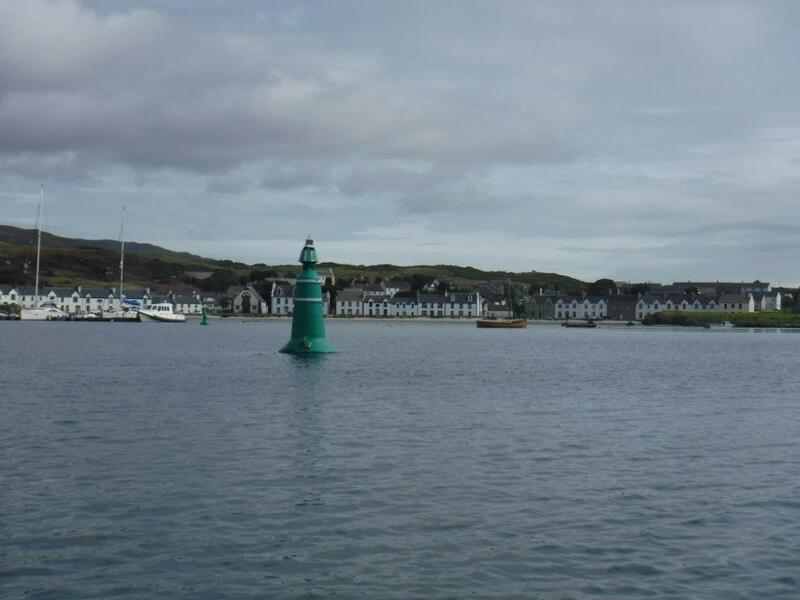 The landing by Lochranza pier offers toilets, a bench and table and an excellent sandwich shop. 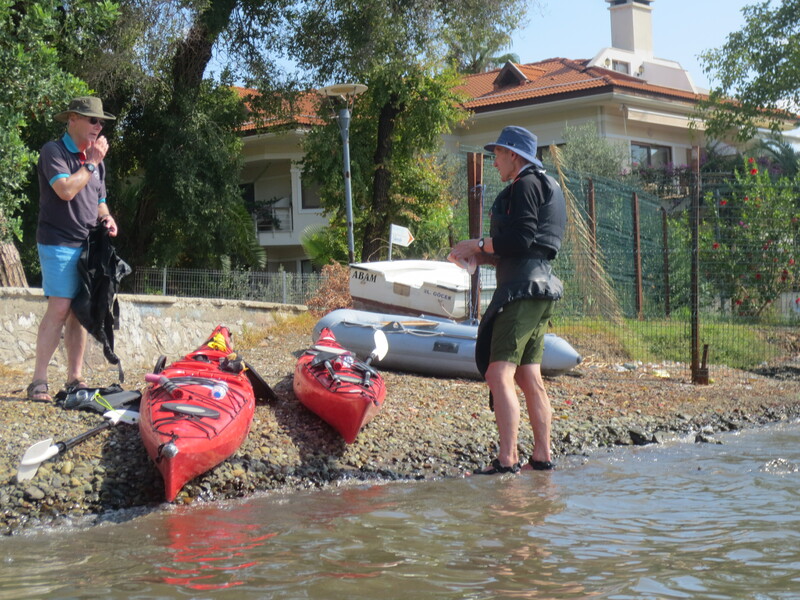 A long stop, witty repartee and a bit of self congratulation on successfully negotiating a serious crossing, followed. We had a break at Pirnmill for beer (off-Licence) and Ice Cream. There is now no pub, only an unlicensed restaurant which to Steve’s disgust does not welcome dogs. 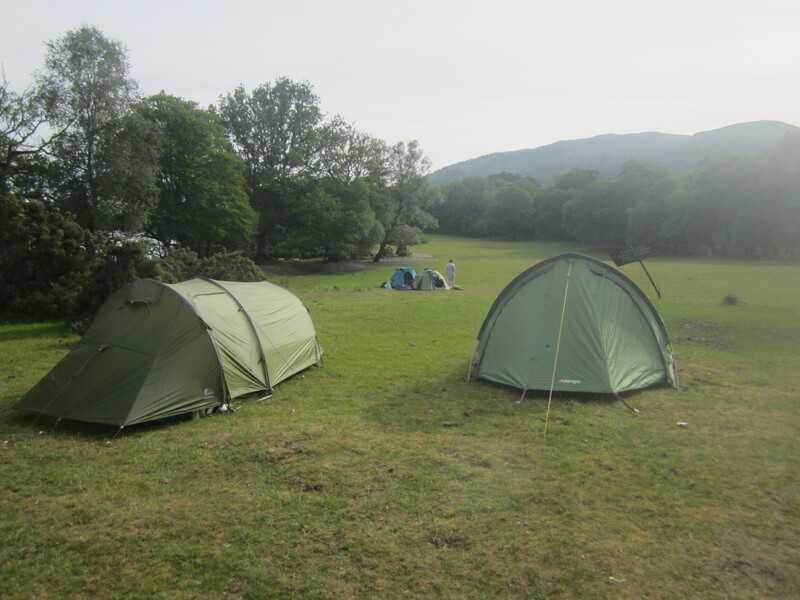 At the end of the path was a flat tufty area of tall grass, ideal for the tents. 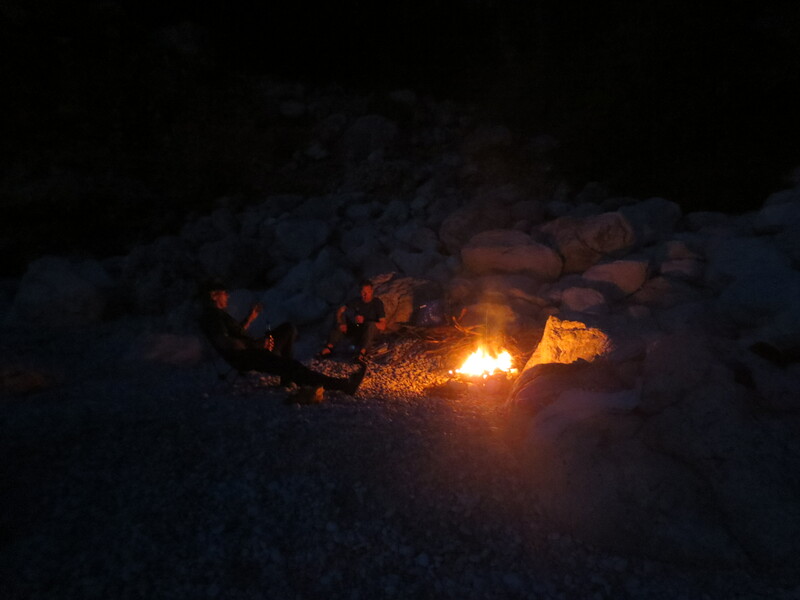 In addition on the beach was a ton of well dried driftwood ideal for the fire. The only negative was the kittiwake nest with three speckled eggs just at the end of the path from the water. Discovering this we moved tents and kayaks a bit away and eventually the mother returned. 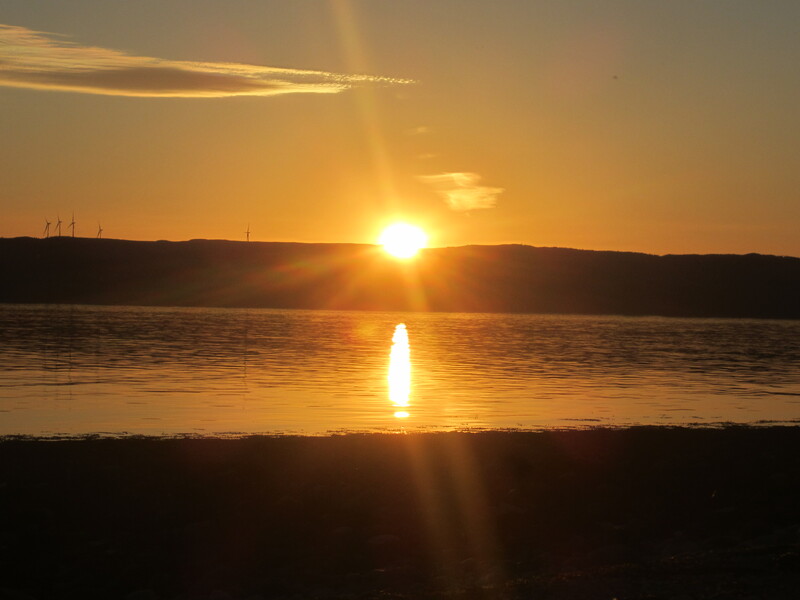 a glorious sunset over Kintyre. 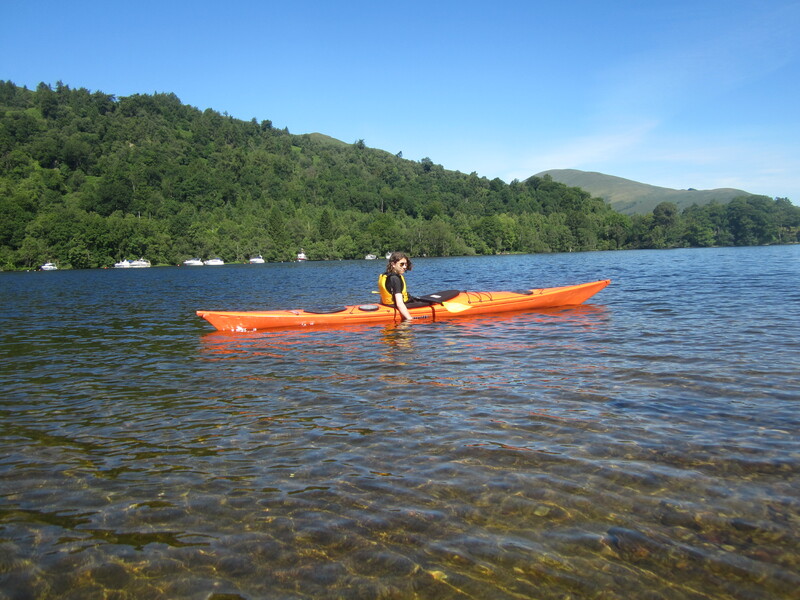 Sunday: If anything the weather was even better, certainly breezier. 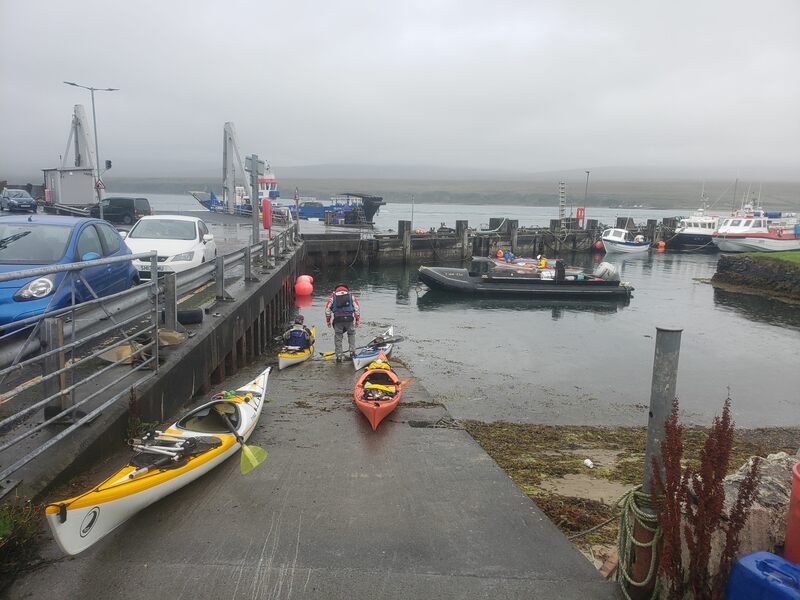 The plan was to get up at 7 and try to leave by 8 for breakfast in Carradale but this proved impossible and at 8.20 we were ready for the trip across Kilbrannan Sound to Carradale. 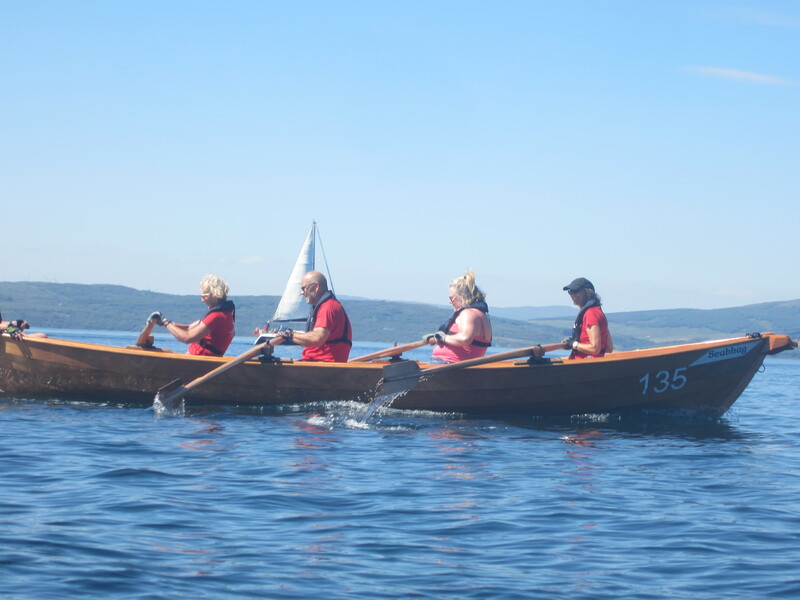 Rather to our surprise as we progressed towards Kintyre the swell got significantly larger with the occasional wave breaking over the boats. It is less surprising that there is no photographic record . 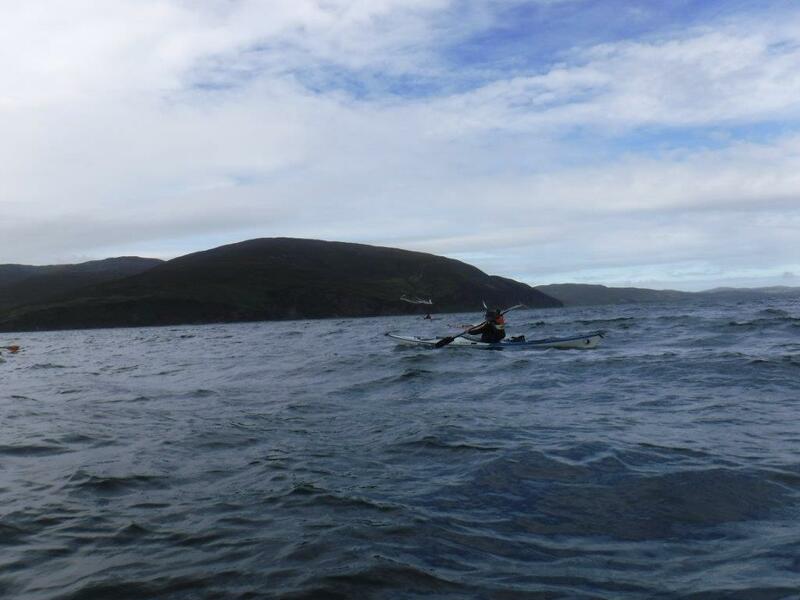 We reached Carradale at 9.30, just over 1 hour for the 4.5km. 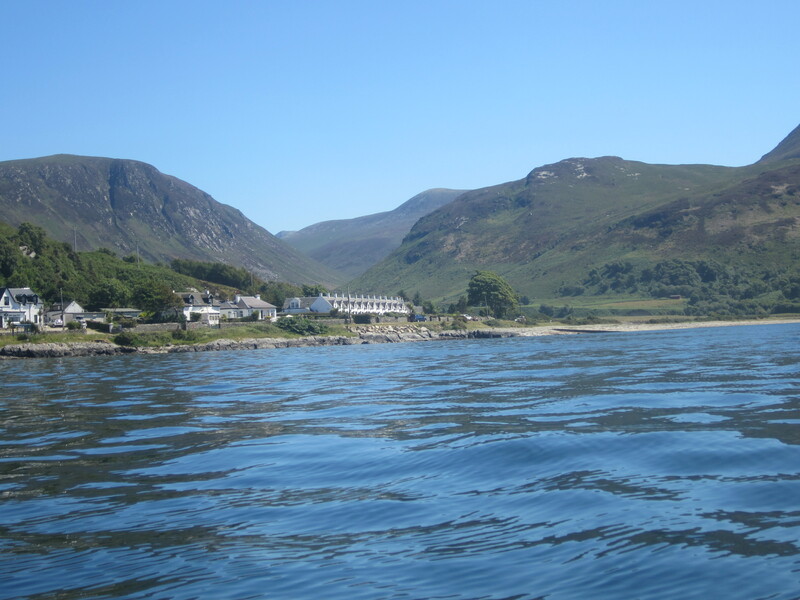 Carradale is an attractive village with an excellent harbour and landing beach. The tearooms, hotels etc do not open until 10am so we walked up the village high street before returning to the tearoom for breakfast on the lawn. There was a mix of purchases; bacon rolls, full Scottish, Scrambled Eggs and so on all washed down with tea and coffee. After a very lazy couple of hours we were off again heading north for Grogport. 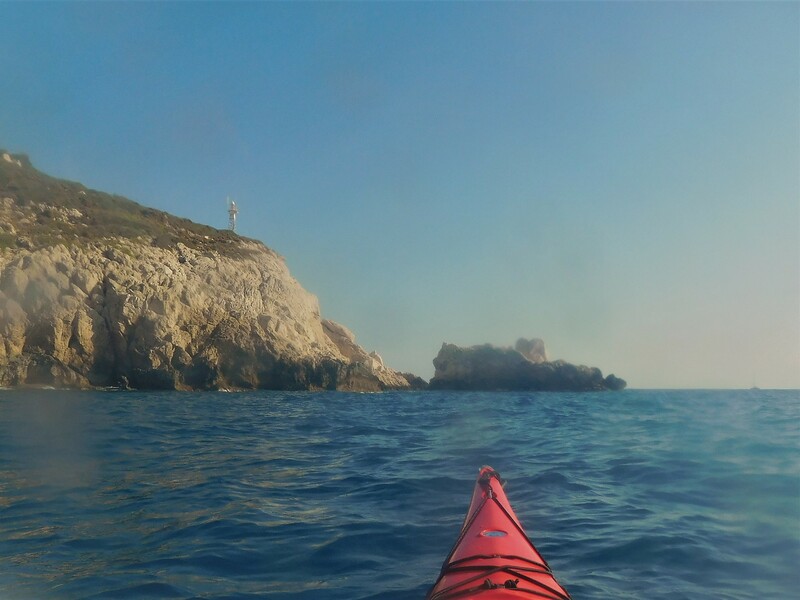 The wind had eased and veered west and the coastline was excellent. Things were going so well we decided to press on to Cour Bay for lunch, a lovely remote sand beach. 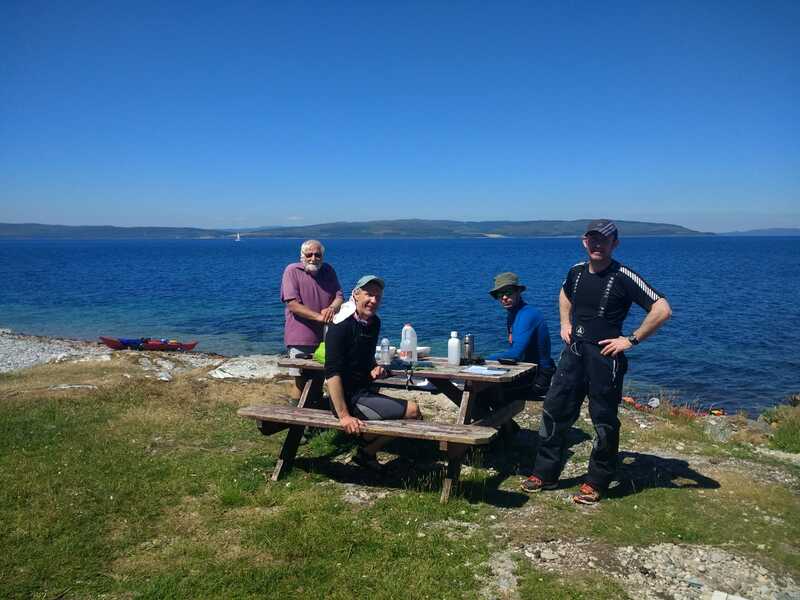 We took a long lazy contented lunch before commencing on the final 10 plus km leg back to Claonaig. 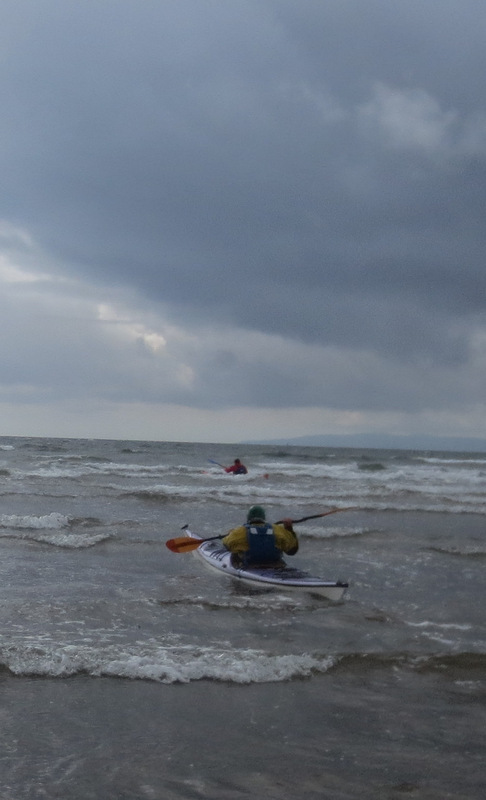 We were helped by an increasingly strong westerly and arrived back at the pier at almost exactly 5pm. Packing up took the best part of 40 minutes but we managed to just beat the car ferry that deposited its cars at 5.40. Fish and chips at Inverary and home just after 9pm, an excellent weekend and a recommended destination. 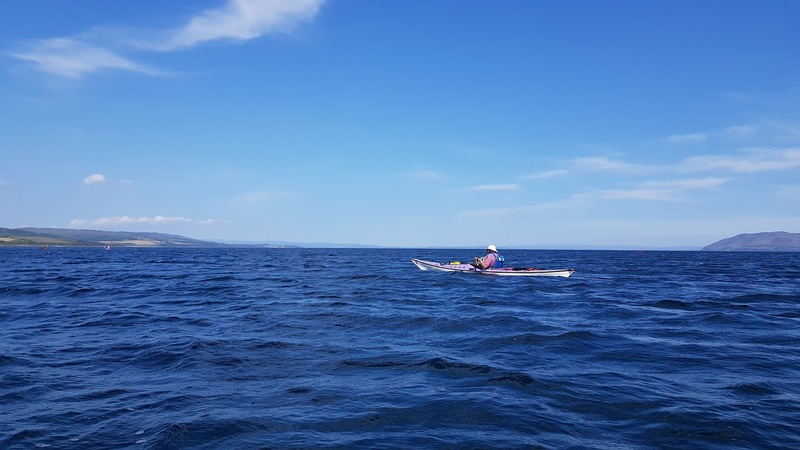 Report: A short email in the morning saw seven paddlers anxious to utlise the “heatwave” conditions. We assembled at 7pm and after a short wait for latecomers were away by 7.30. 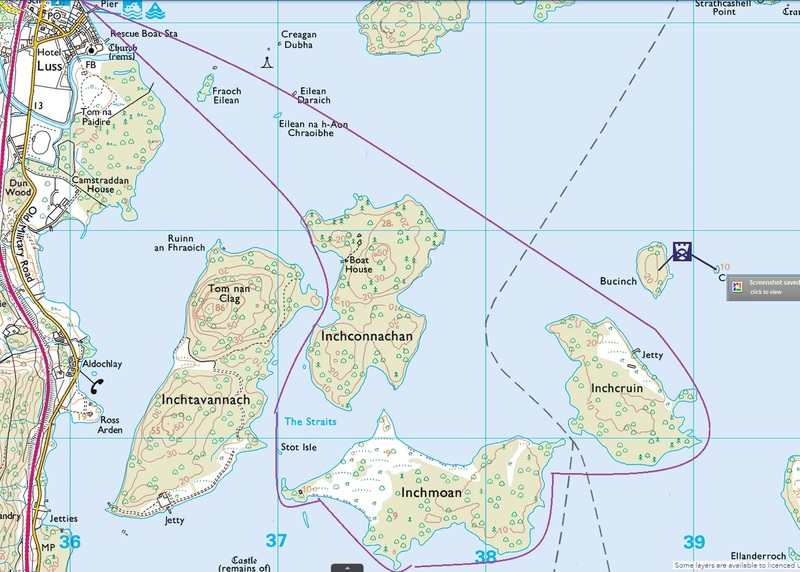 Gordon decided on a route back via Ardmore whilst the rest progressed gently, through the stationary yachts, back to Craigendoran. Gordon arrived about 30 minutes after the others. An excellent and beautiful evening. 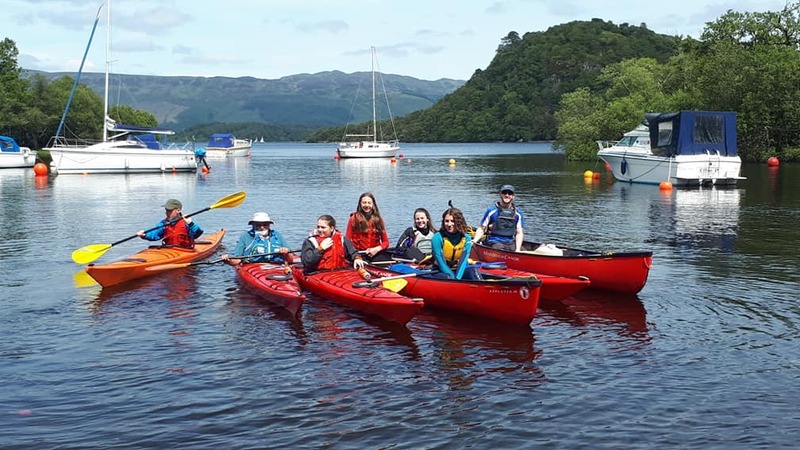 Luss, Lomond Shores, Kidston (and Rosneath) , Royal Northern (Canoes), Craigendoran (Polo) and the River Leven. 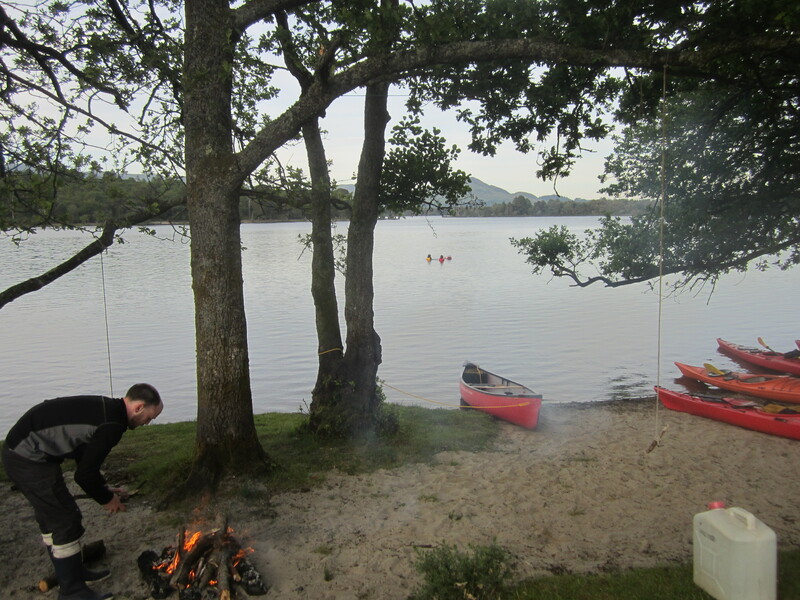 The course finished with a Canoe Camp on Loch Lomond. Our conclusion is that, once again, it proved very successful. 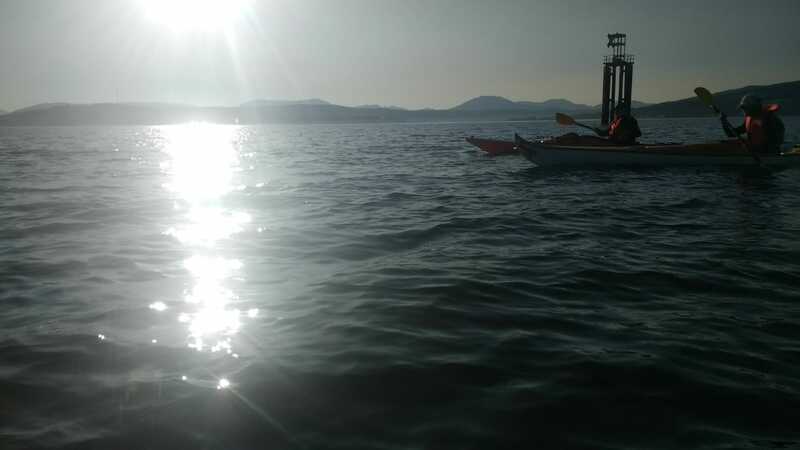 Report: The choice of canoes and sea kayaks was intended to give more experience to the Paddlers in a run up to the 2 Star assessment. 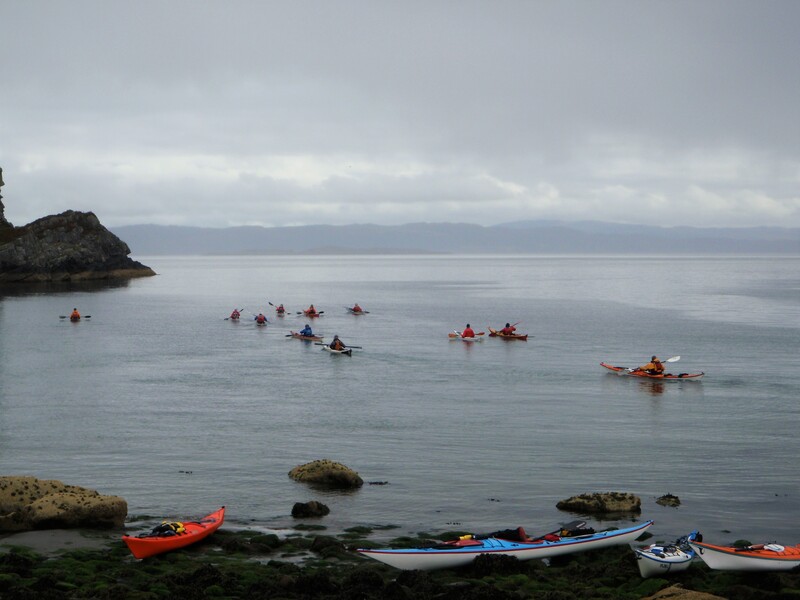 For the record the sea kayaks unsuprisngly proved the more popular. 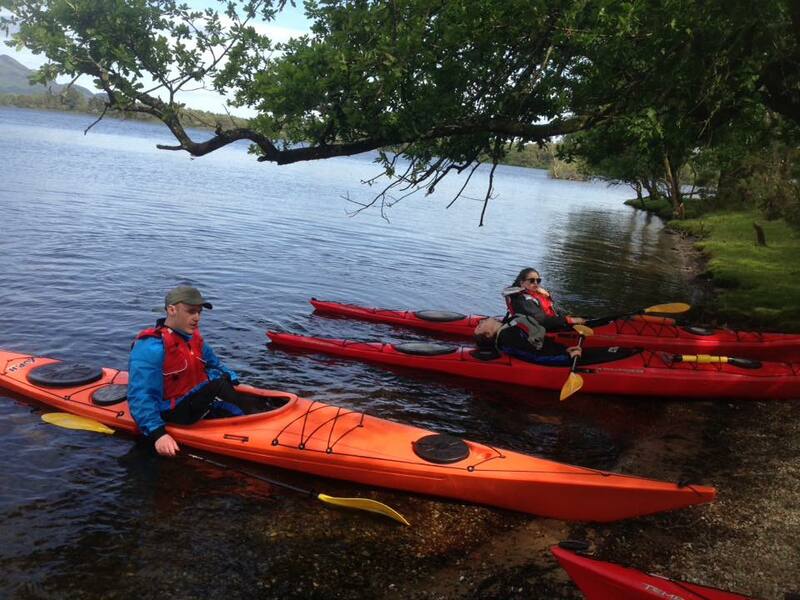 We met at Aldlochlay at 2pm and were away before 2.30 for the first leg over to Inchtavannach and Inchconnachan. At this time there was a good breeze from the north. 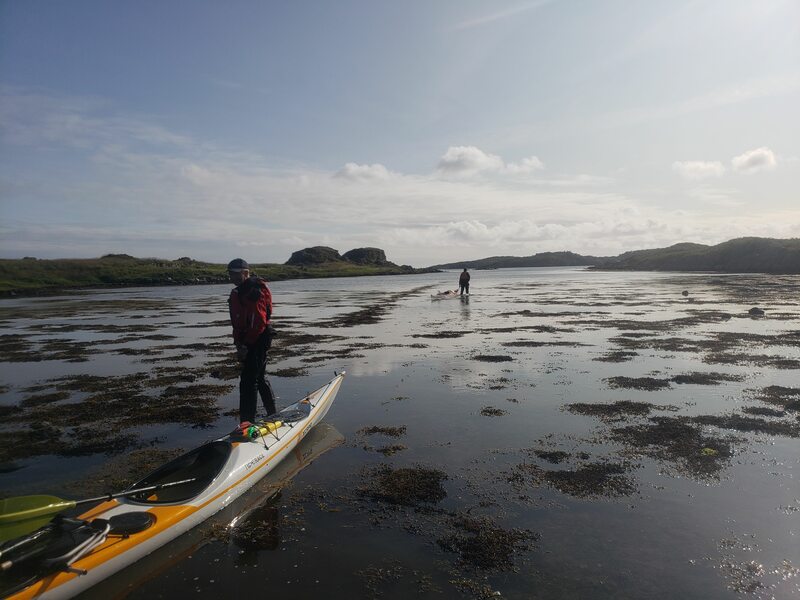 A very gentle paddle through the narrows took us to our camp site on Inchtavannach. A long rest and we were off for an evening paddle. 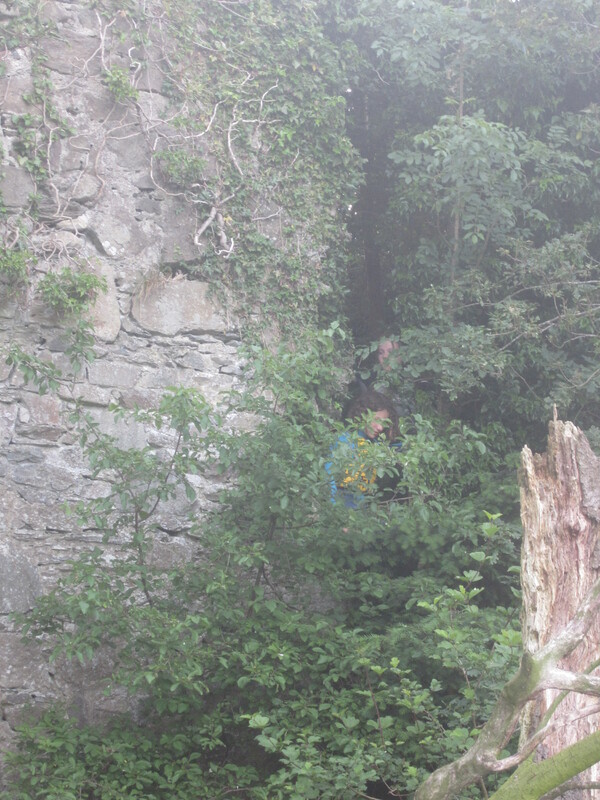 Our first stop was Inchgalbraith, a tiny island with an old ruined castle eminently climbable. 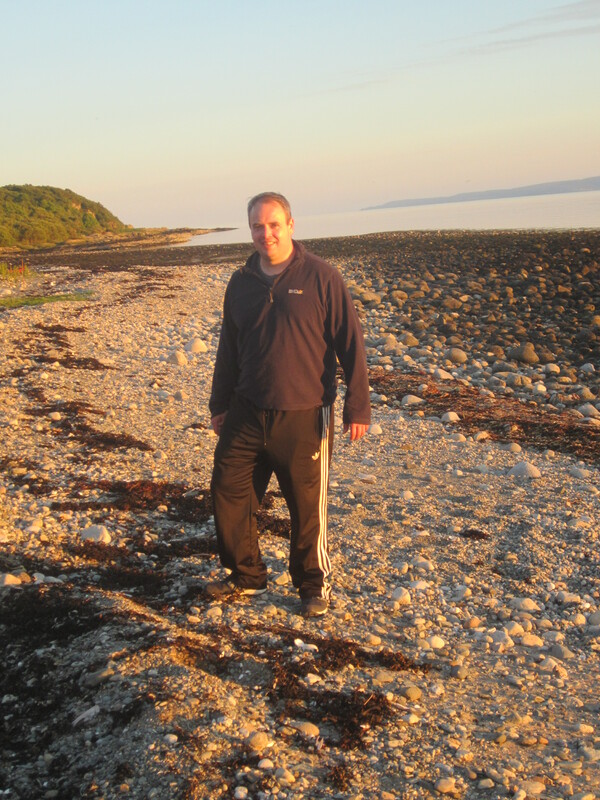 On to the long sand beach on Inchmoan for a stroll. The evening finally darkened at around 10.30 and we went to bed shortly after midnight. 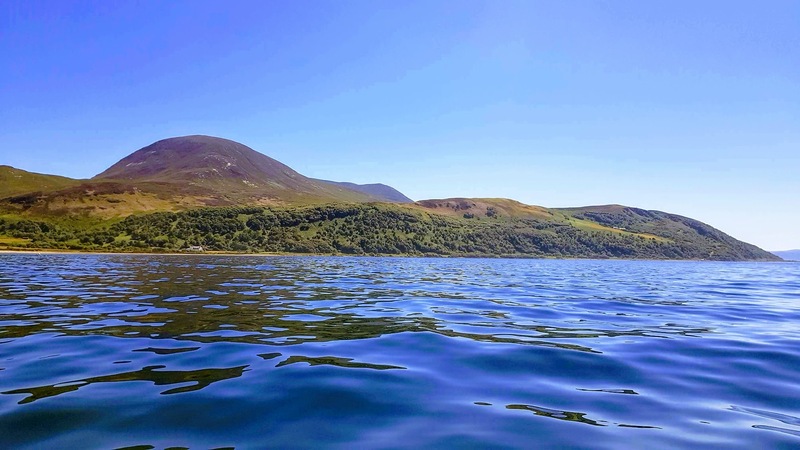 The morning was glorious with Loch Lomond looking at its very best, which is as good as anywhere in the world if not better. A slow lazy start but we were still away just after 10am. 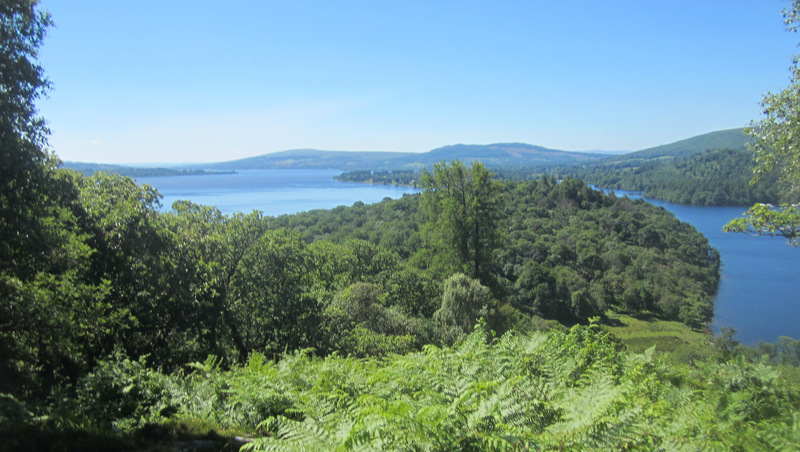 We moved quite quickly and by 11am were opposite Aldlochay and decided to climb to the top of the hill (the highest point on Loch Lomond at 86m (282 ft). 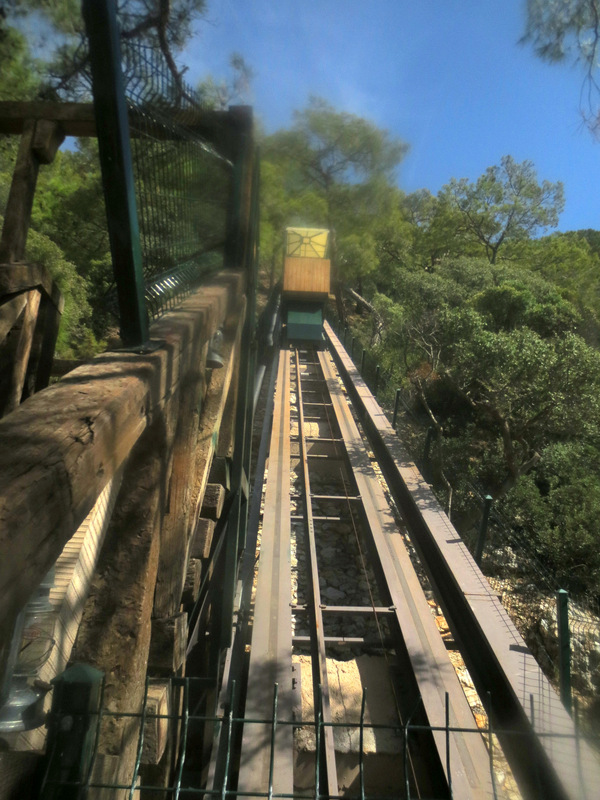 It is surprisingly steep but are rewarded with exceptional views south. 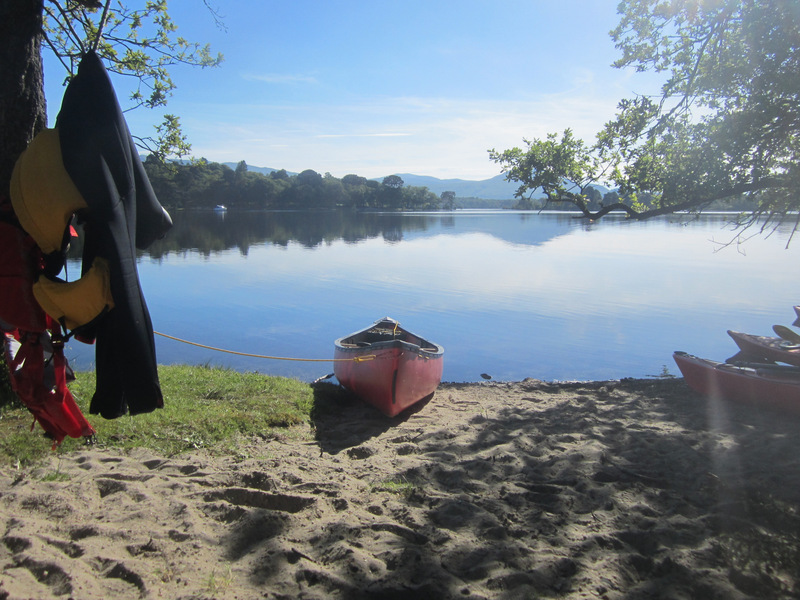 The boats are just visible at the edge of the trees/loch on the right. 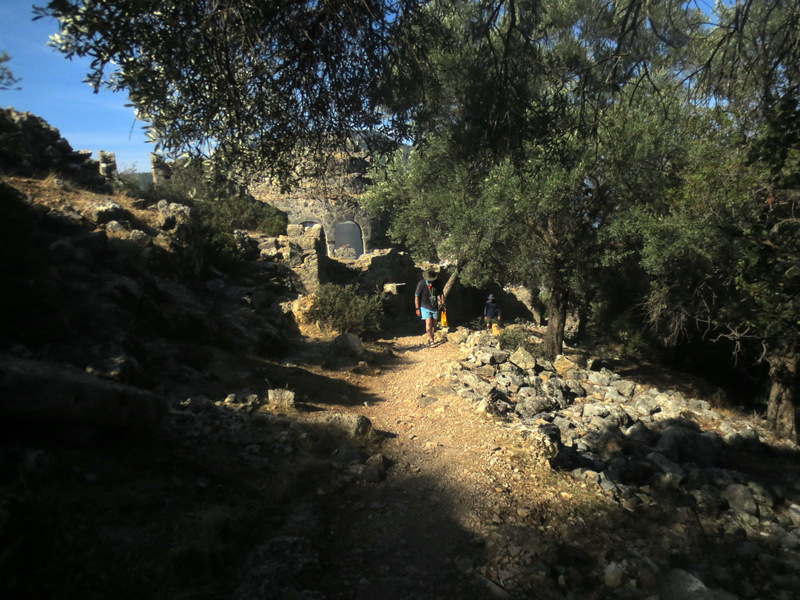 The climb is steep and the path poor/non-existent but still worthwhile but an excellent way to spend 30 minutes. 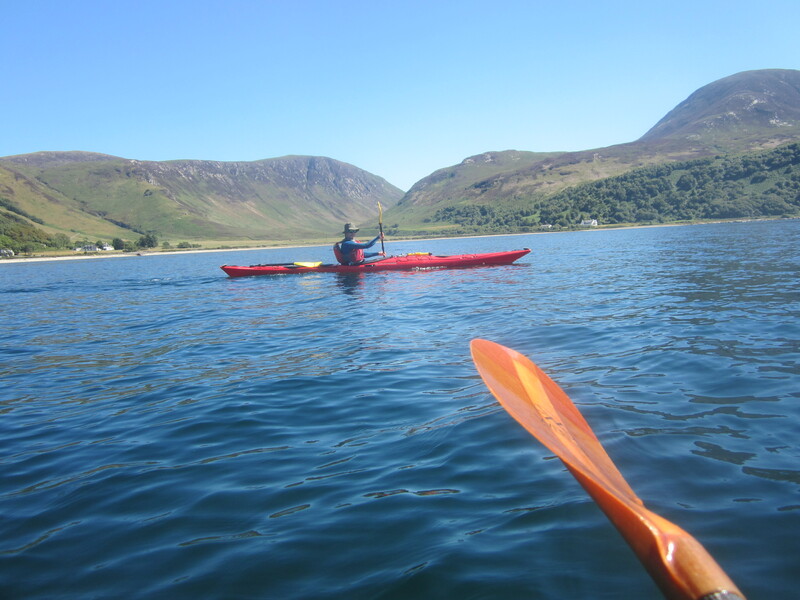 A quick paddle and we were back at Aldlochlay just before midday. An excellent and Hopefully instructive trip.